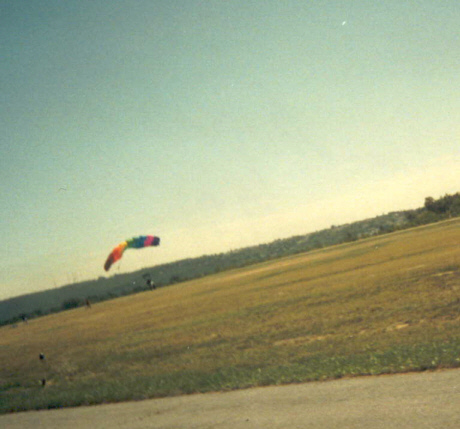 Here are some of my adventures while airborne. 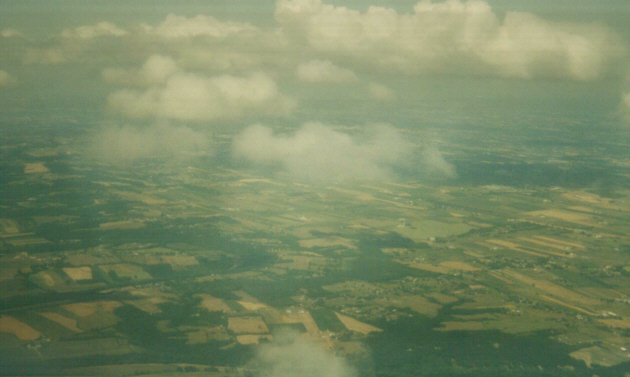 I must say, once I go up, I don't want to come down. 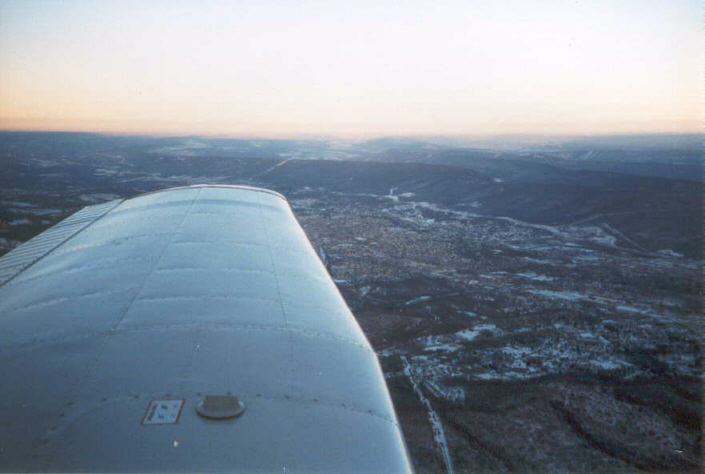 But there's this thing called fuel. 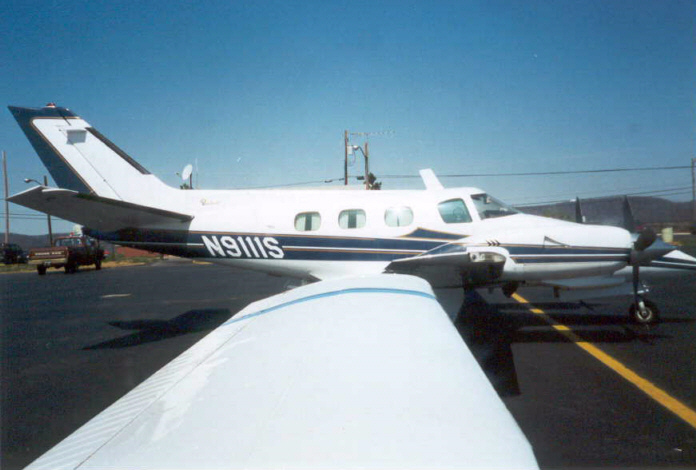 We need fly-though's up there so we don't have to land to refuel and check oil. 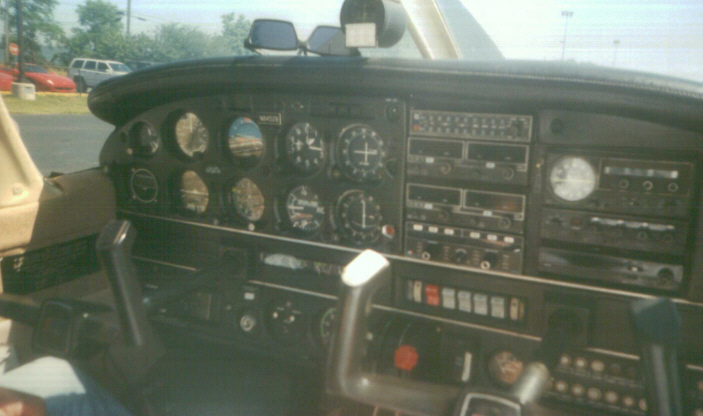 The Pilot Commandments written by me when I was still a student pilot. 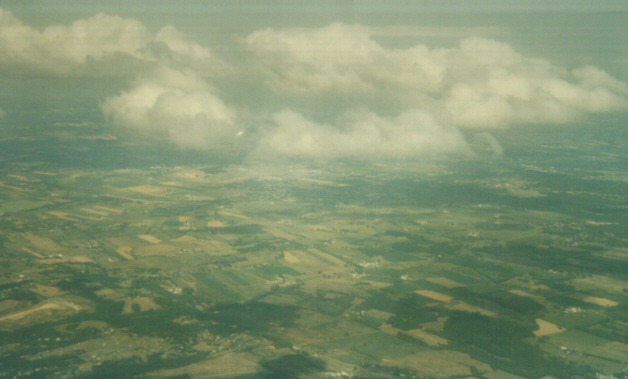 What makes up most of my collection - pictures from the sky of places on the ground. 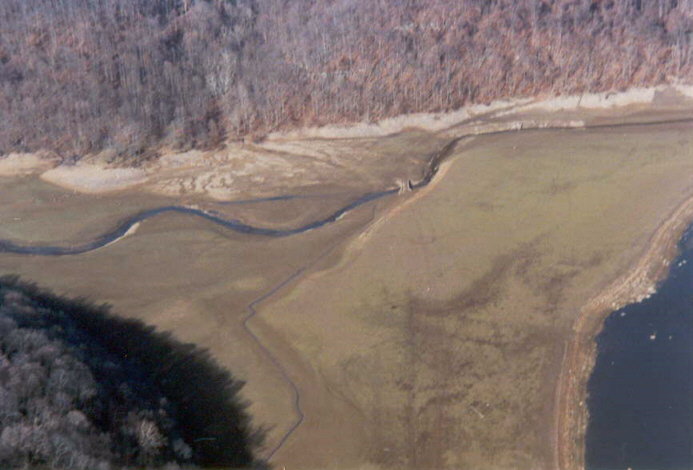 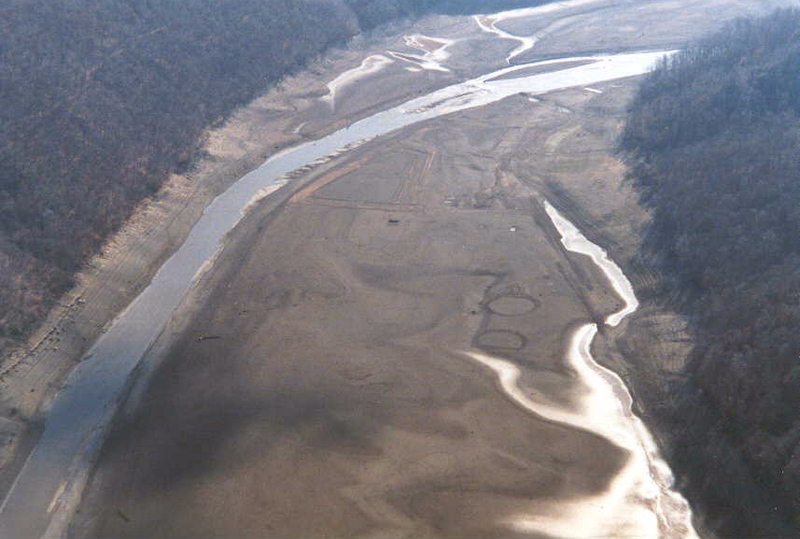 Youghiogheny Lake, Pennsylvania, 12/09/98 - The summer of 1998 was one of drought as can be seen here. 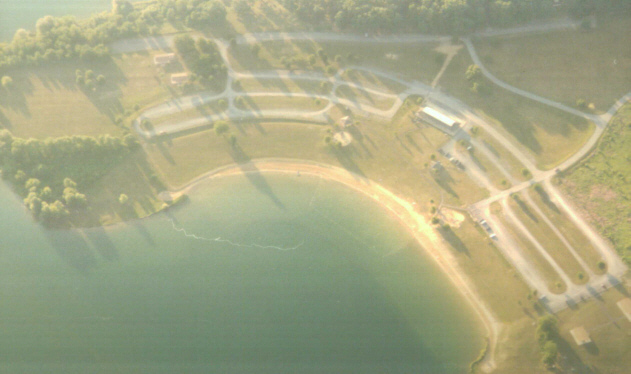 The lake was practically dried up. 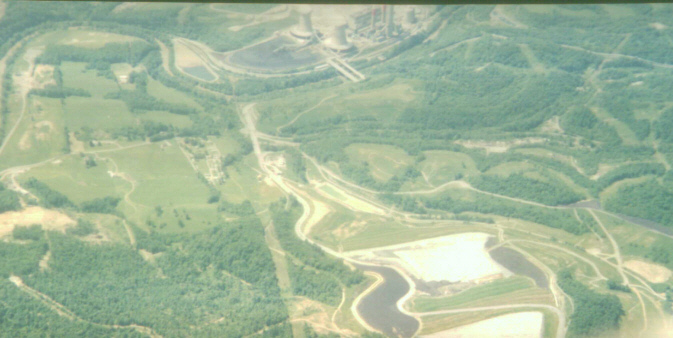 You can see foundations of houses which were once there before the dam was built and valley flooded. 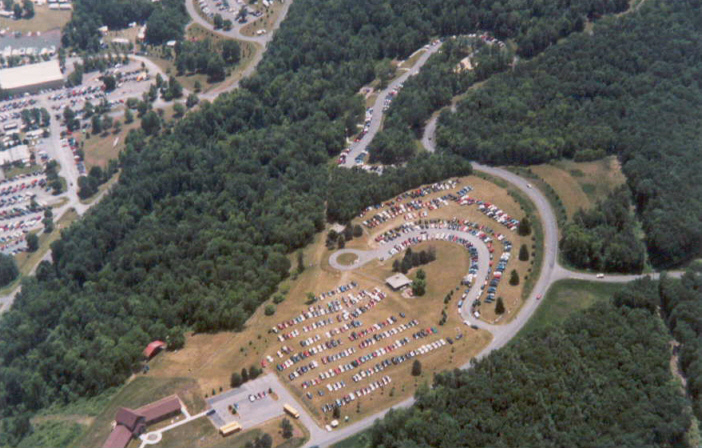 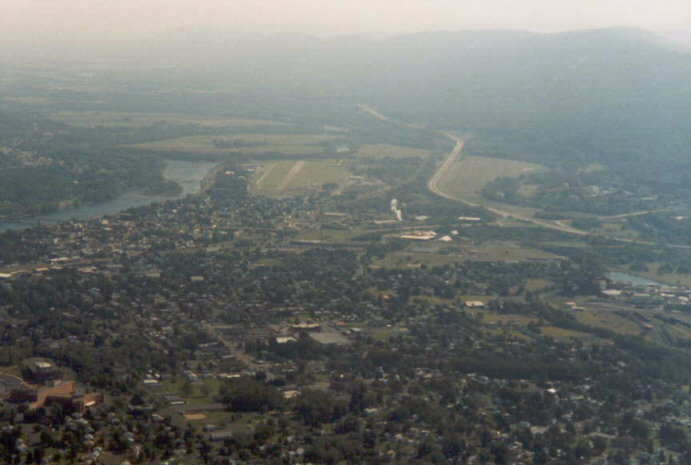 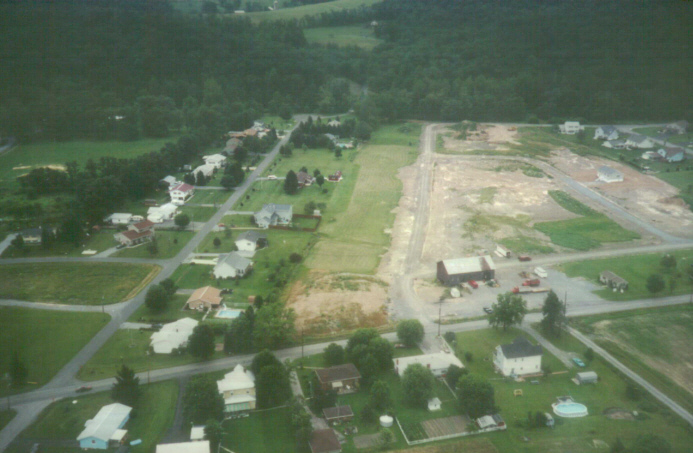 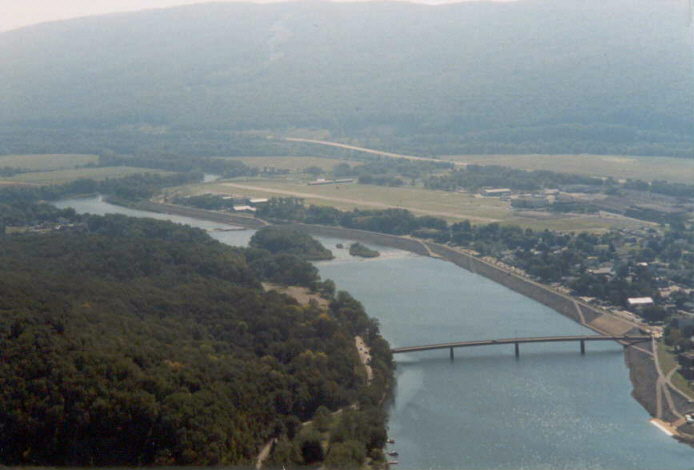 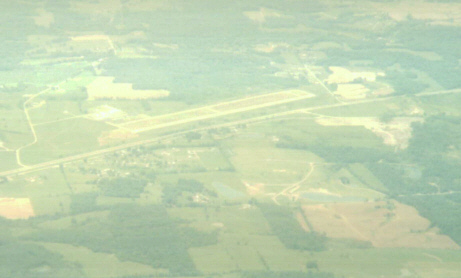 Mid-State Airport, Philipsburg, Pennsylvania, 05/16/99 with Black Moshannon State Park right next to it. 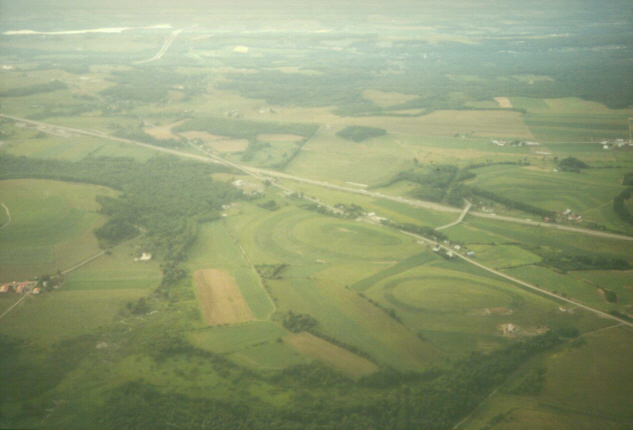 "Heart" of a Field, central Pennsylvania, 05/22/99 - It only looks like a heart from this angle. 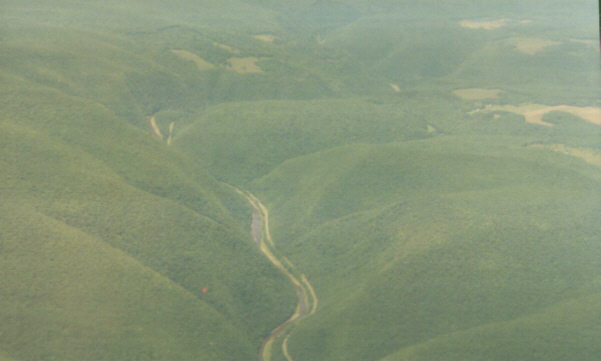 Believe me. 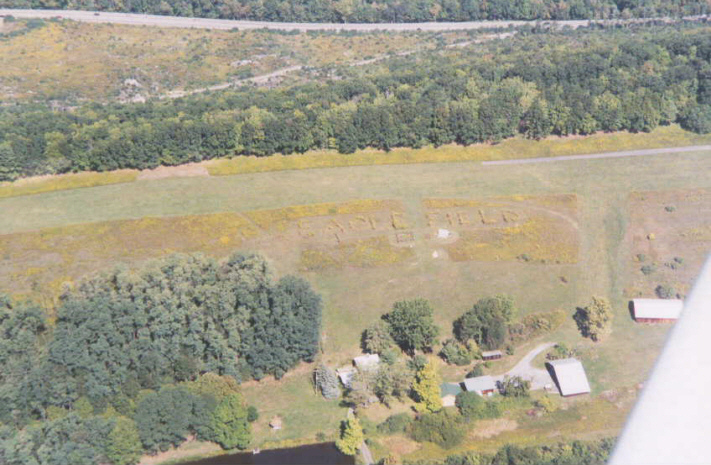 I circled it. 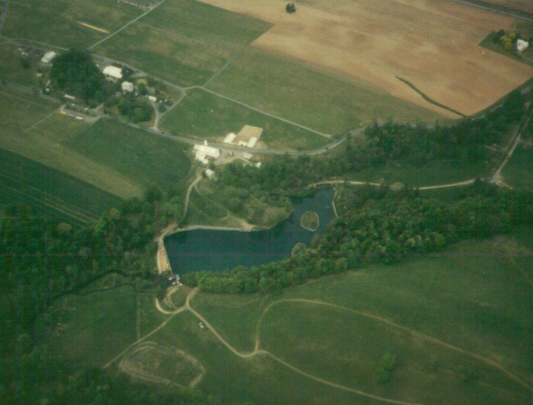 Penn's Cave, Centre Hall, Pennsylvania, 05/22/99 - This water area is entrance to one end of the carvern. 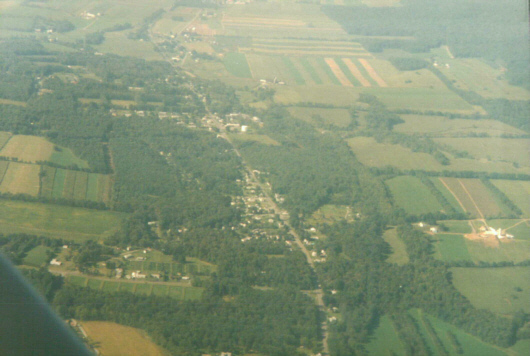 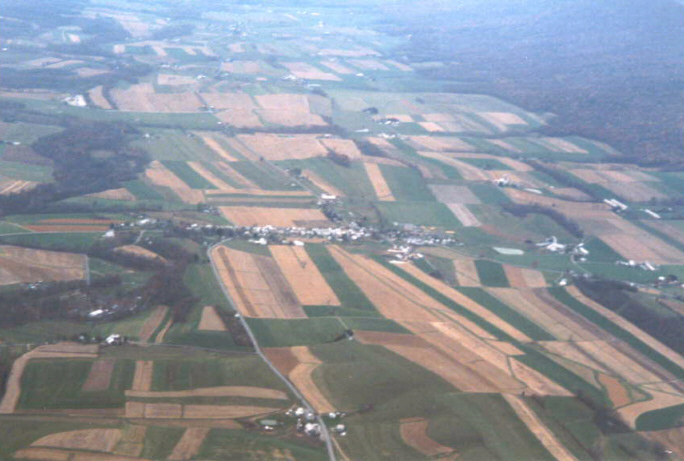 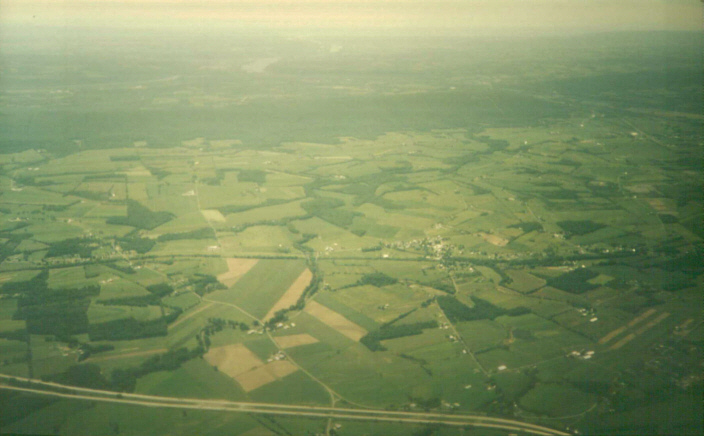 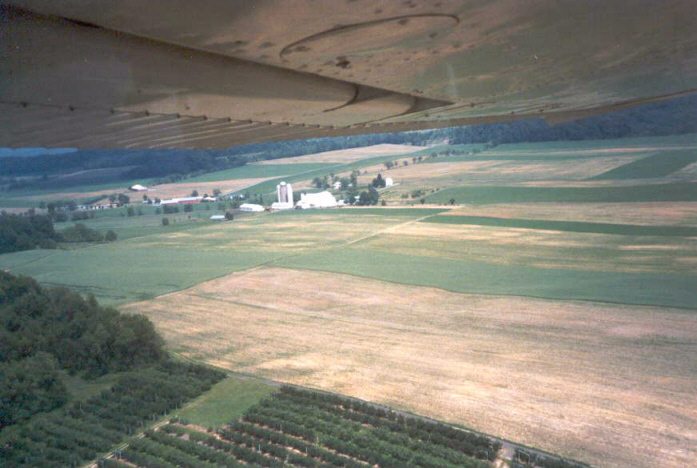 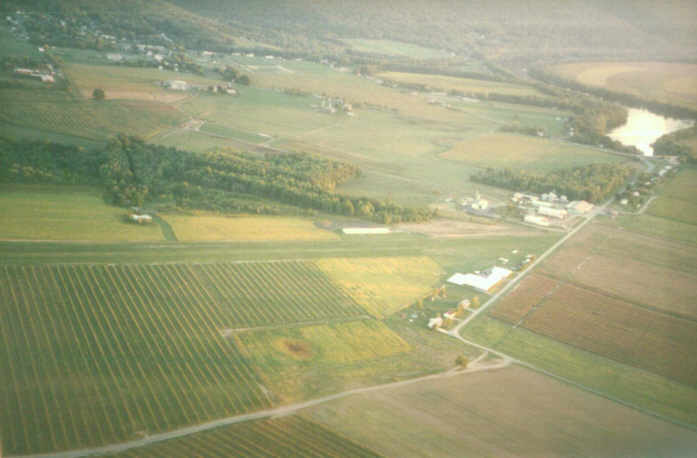 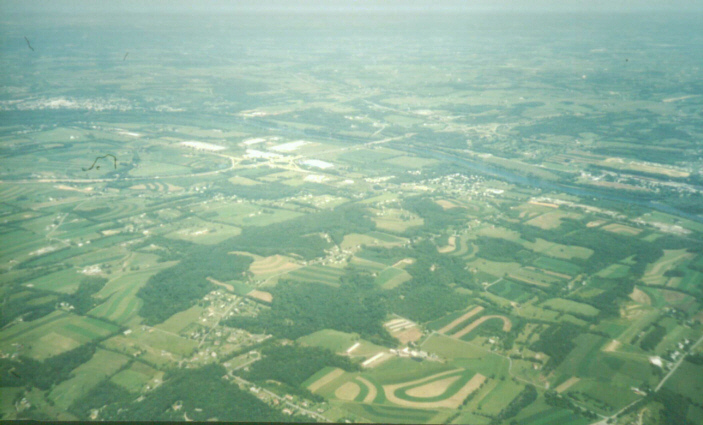 Farmland, 1 mile south of Altoona Airport (AOO), Pennsylvania, 06/05/99 - This was taken about 500 feet AGL (using camera zoom) shortly after departure while still on upwind of Runway 20. 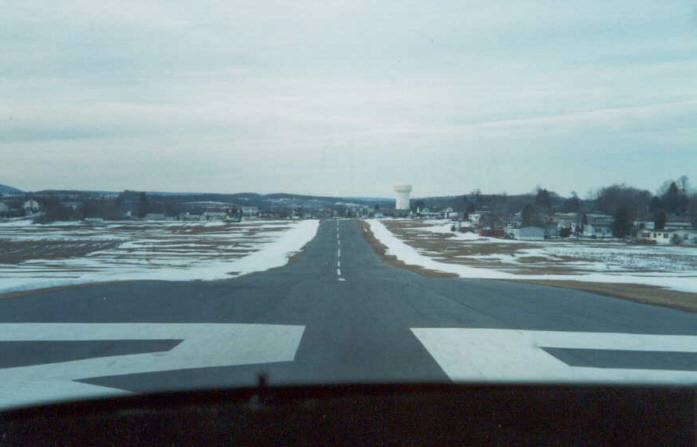 Sometimes you just need to have a pilot in the right seat to take controls to enjoy scenery around the airport and where it's posisble for emergency landings in the rare event it happens. 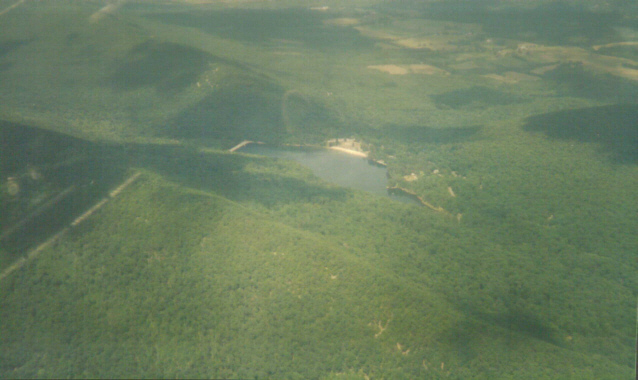 Raystown Lake, south central Pennsylvania, 06/05/99 - This is super clear, undisturbed water. 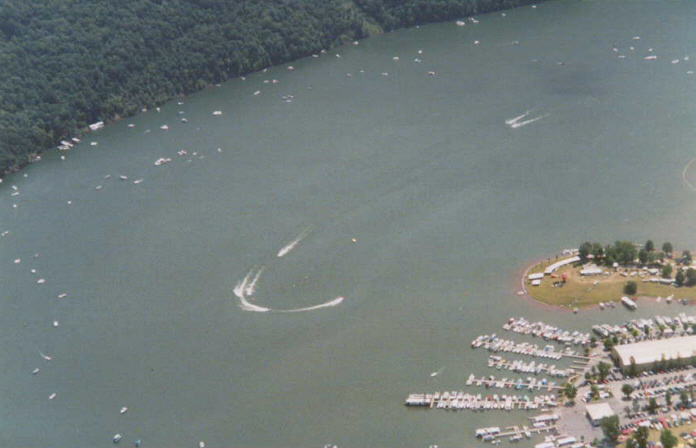 Watch Boat Racing - Who's who? 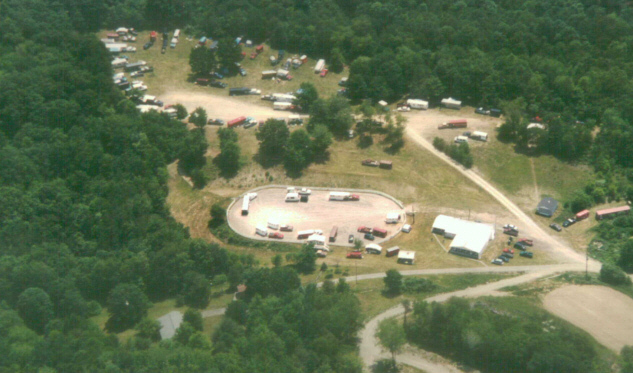 Are those all cars for fans who came to see the boat races? 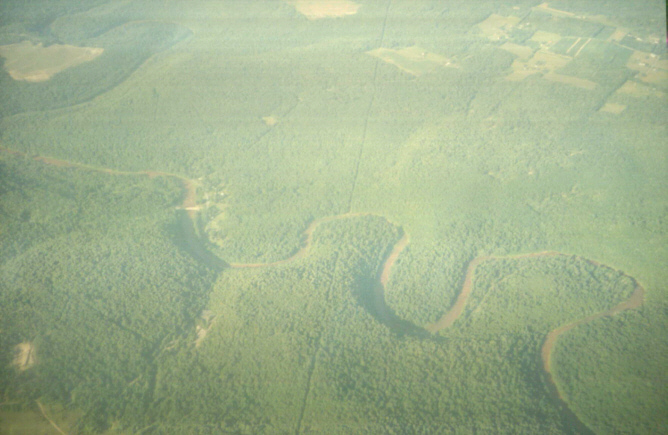 Winding river leading to Currwensville, Pennsylvania, 07/13/99 - That line going down the middle are high power lines. 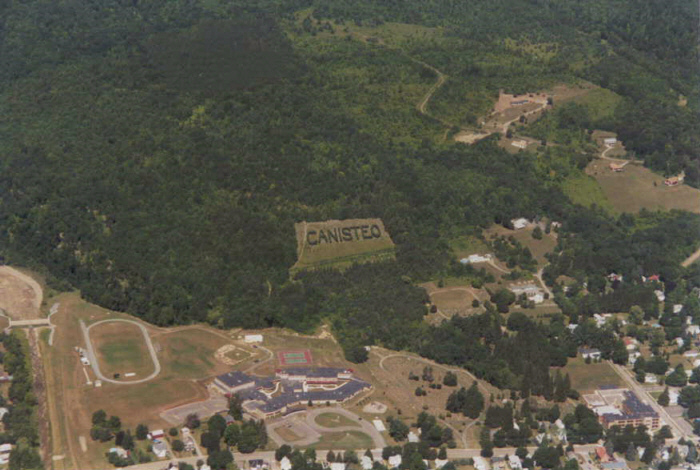 Canisteo, New York, 080199 - It's written in the bushes. 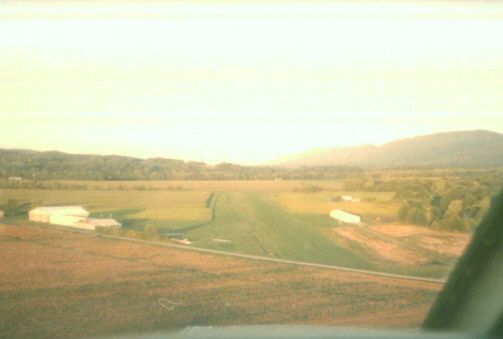 The Mountains of North Central Pennsylvania, 08/01/99 - Over the mountains and across the river to grandmother's house we go. 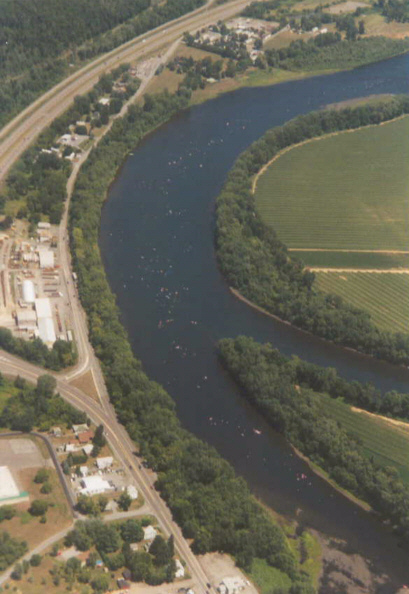 Float Your Fannie in the Susquehannie, Jersey Shore, Pennsylvania, 08/01/99 - Yes, all those white dots are people floating in the Susquehanna River. 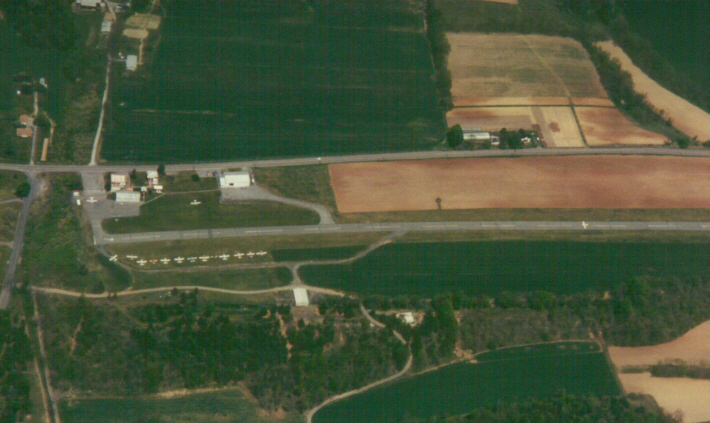 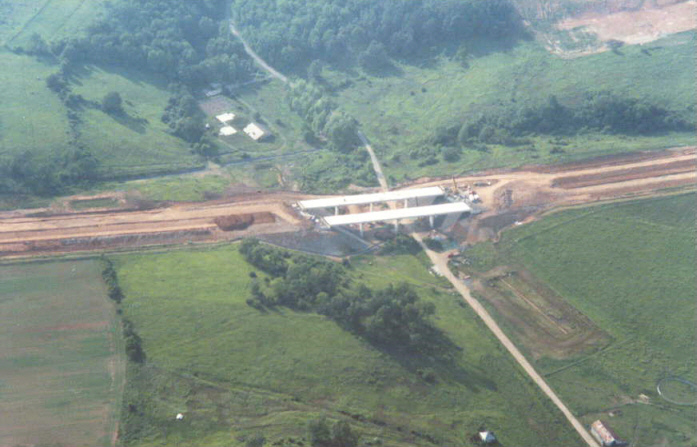 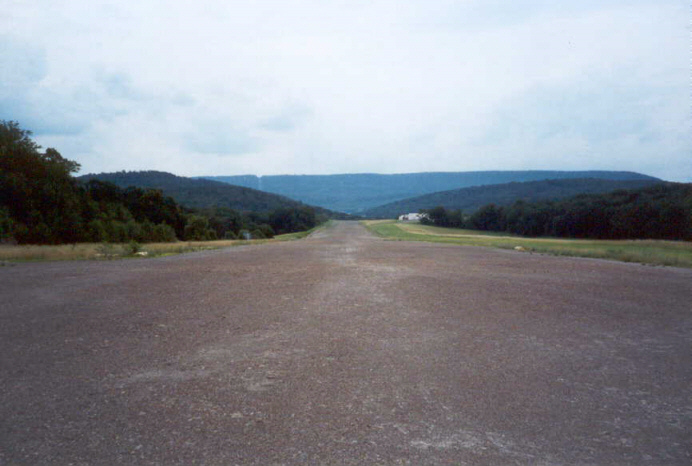 Eagle Field, Pennsylvania, 09/12/99 - This may be a private airstrip even though it is not on the sectional map. 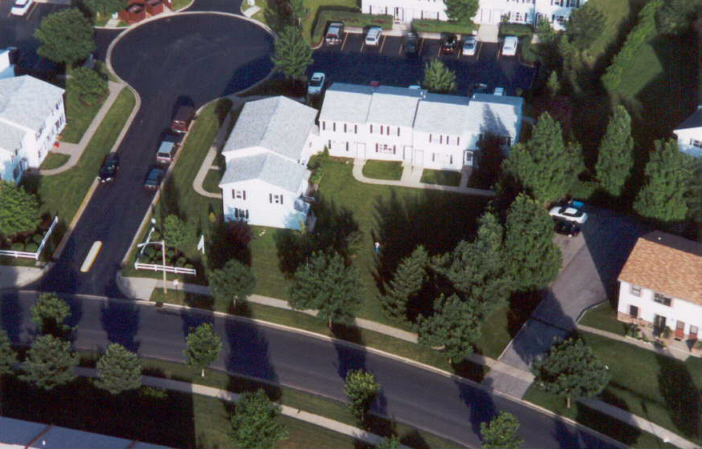 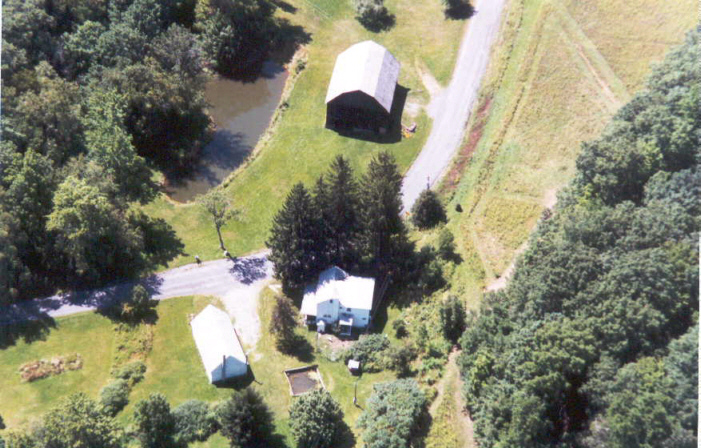 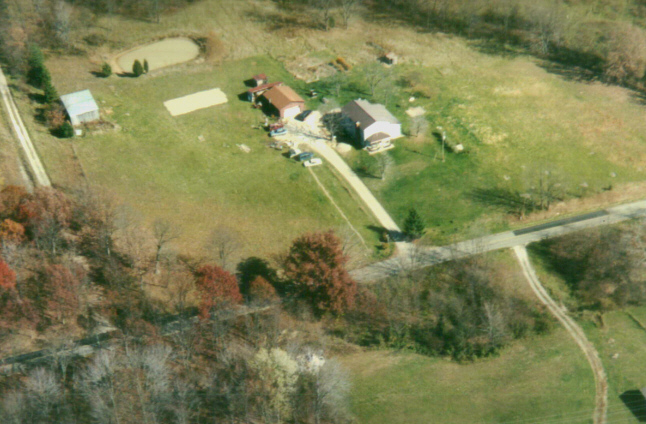 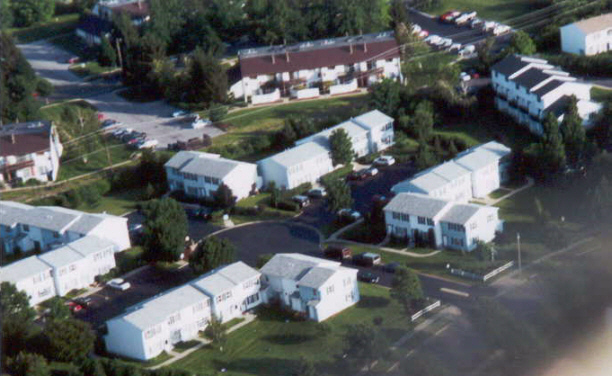 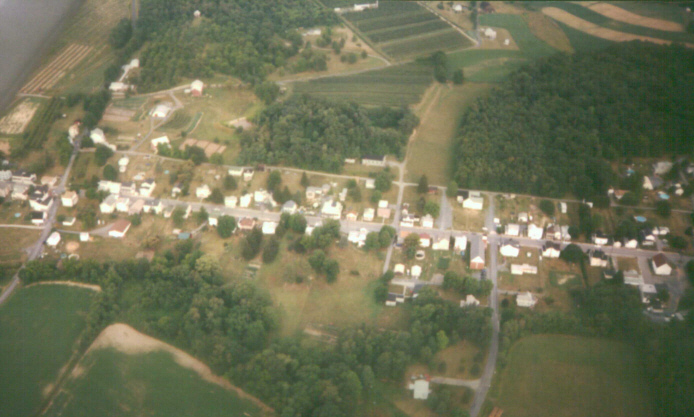 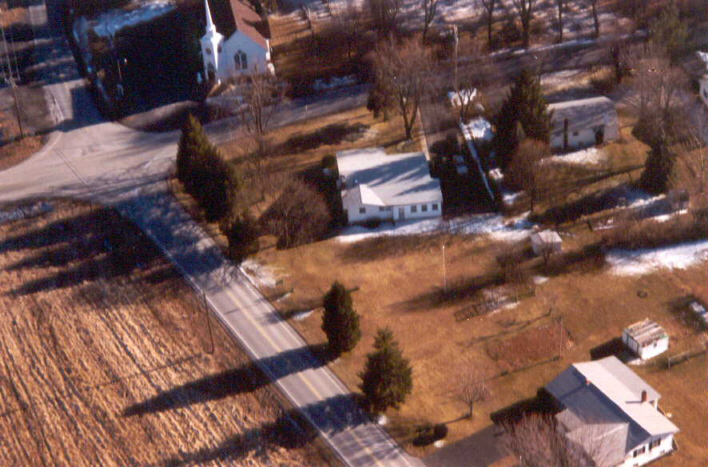 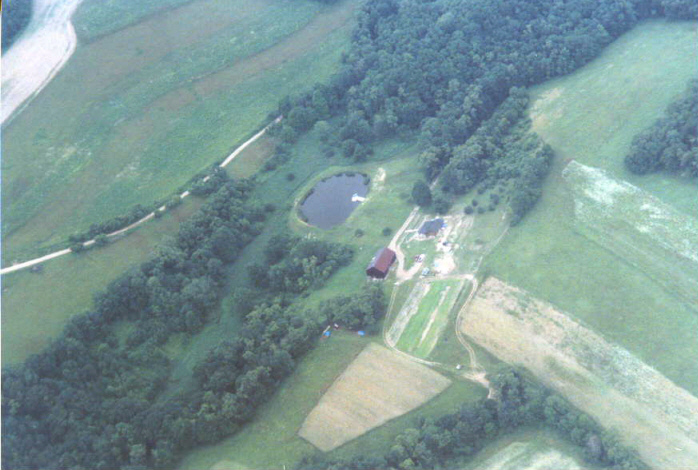 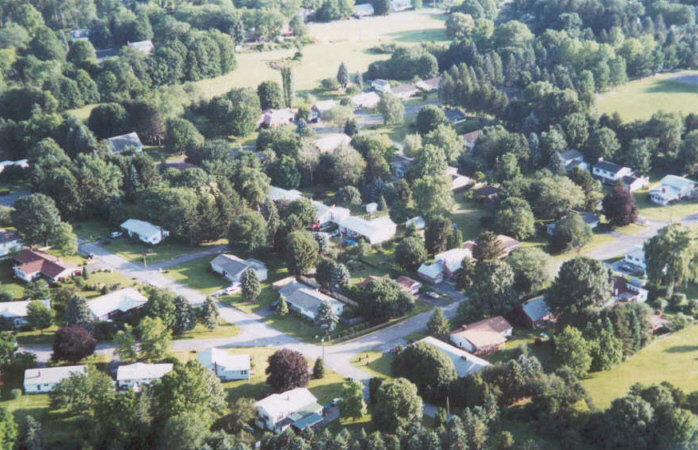 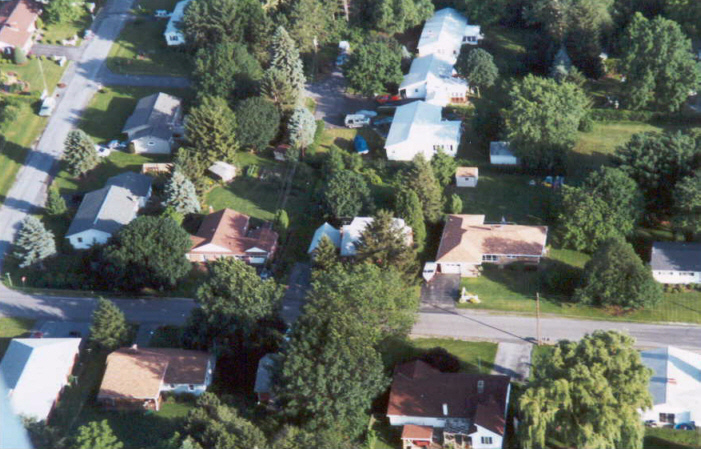 My Friend, Holly's, house, central Pennsylvania, 10/28/99 - This is the best thing about aerial photography! 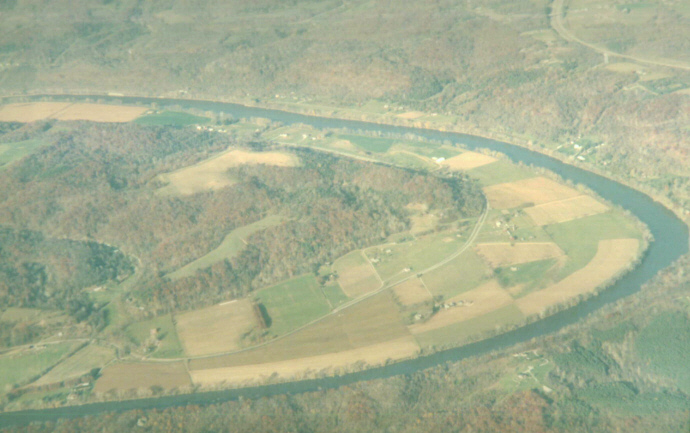 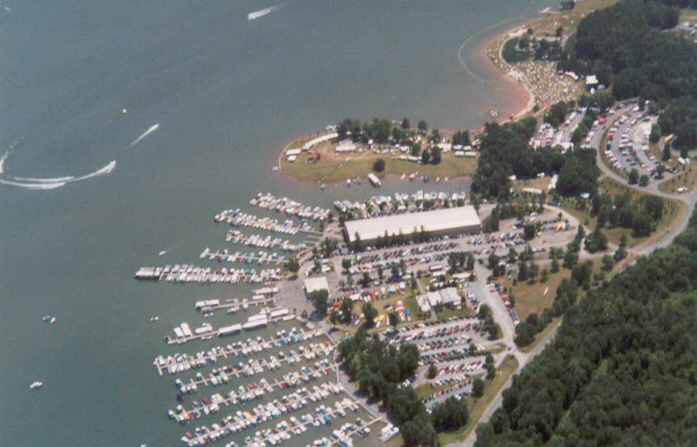 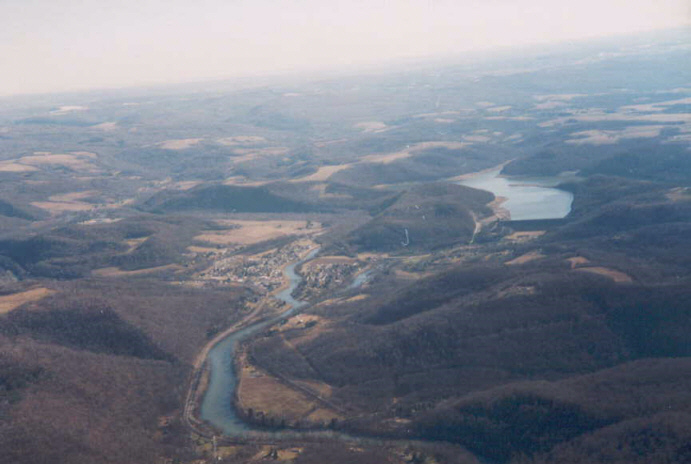 Youghiogheny Lake, Pennsylvania, 01/12/2000 from 3,500 feet MSL. 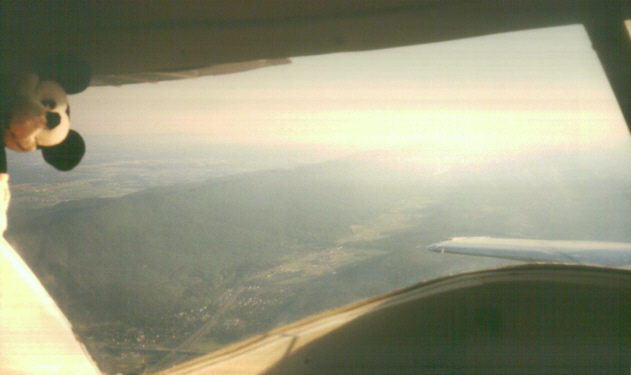 The wing is used to give you my (pilot's) relative perspective. 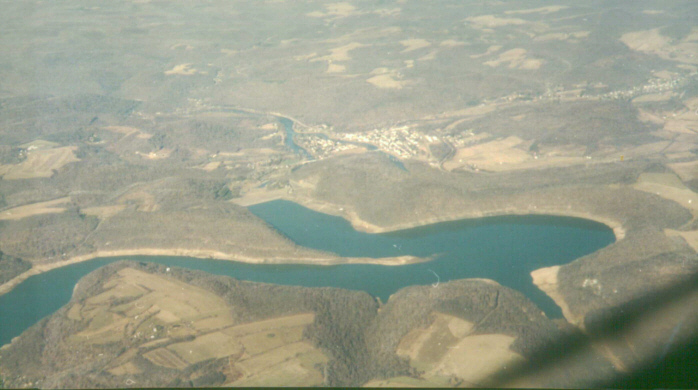 Youghiogheny Lake and Dam (at center), Pennsylvania, 01/12/2000 from 7,000 feet MSL. 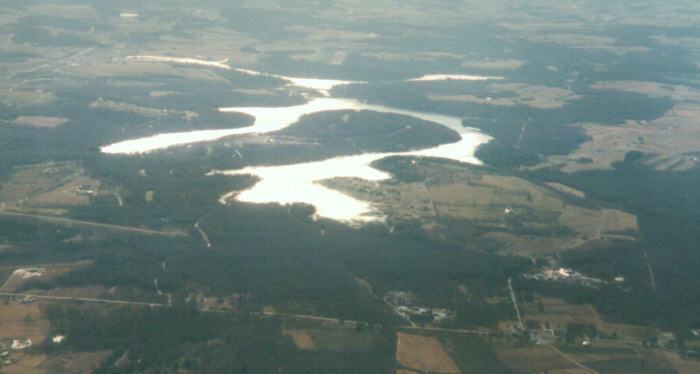 Youghiogheny Lake, Pennsylvania, 01/12/2000 from 8,000 feet MSL. 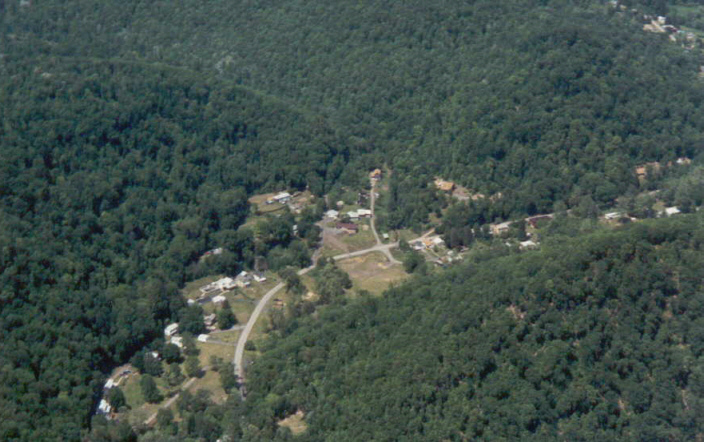 Looks very different from the 3,500 feet view. 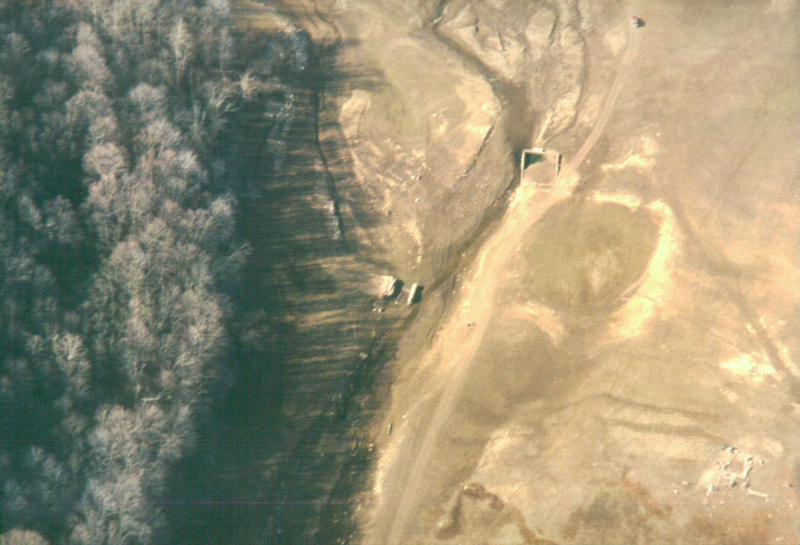 Cabins at the Youghiogheny Dam/Lake, Pennsylvania, 01/12/2000 The water level is lowered over the winter months. 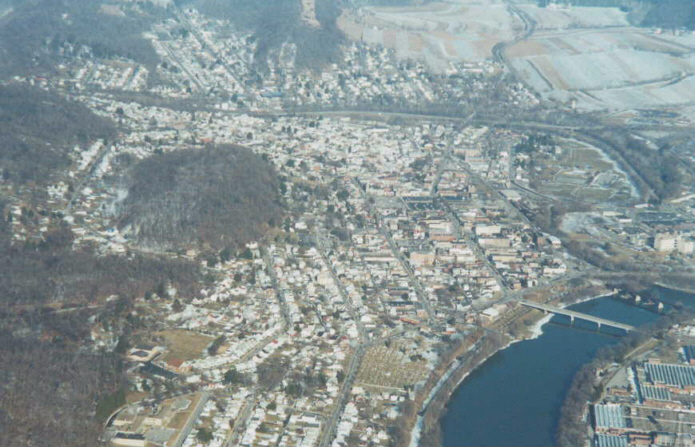 Punxsutawney, Pennsylvania, 01/29/2000 - Home of the most famous groundhog, Punxsutawney Phil. 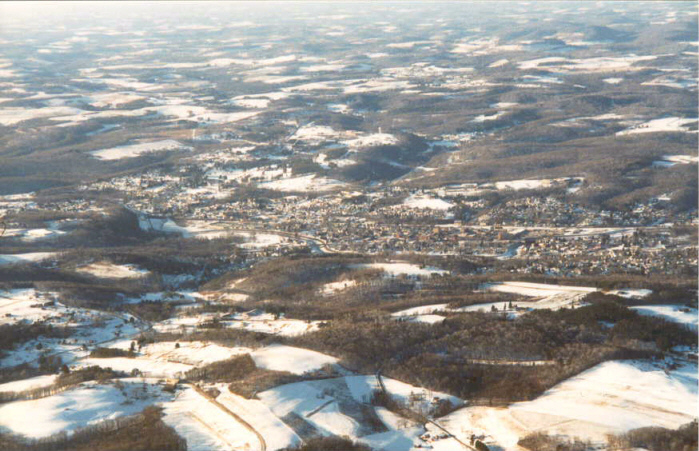 Note: Even though the movie _Groundhog Day_ starring Bill Murray and Andie MacDowell is about Punxsutawney Phil, none of it was filmed in Pennsylvania. 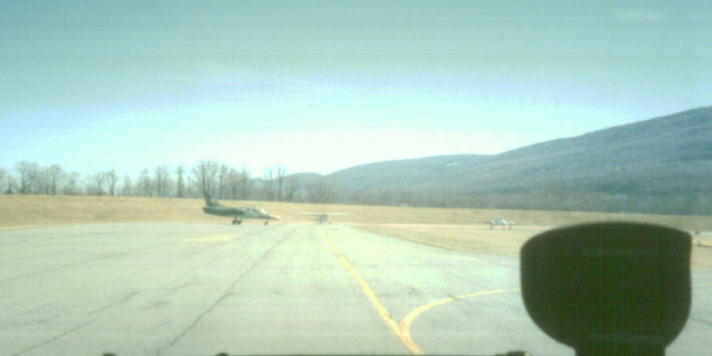 However, Bill Murray did make a visit here to learn all about Groundhog Day and its annual events. 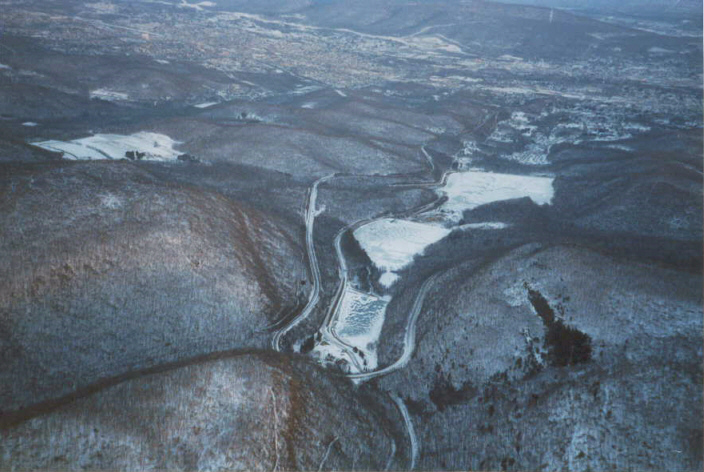 The Horshoe Curve, Altoona, Pennsylvania, 01/29/2000 - An engineering marvel of railroad construction. 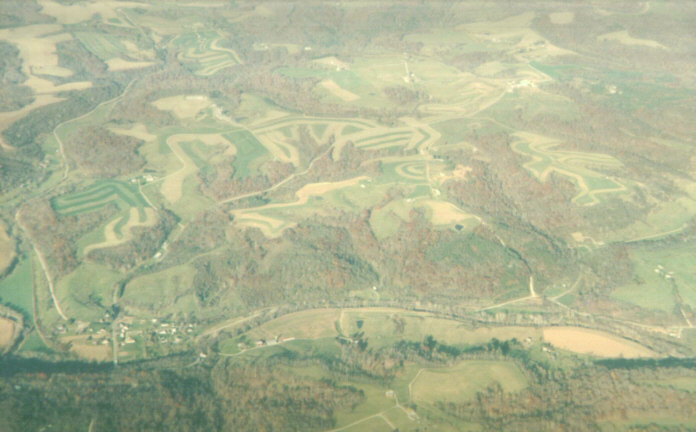 This was along the route flying back from Punxsutawney. 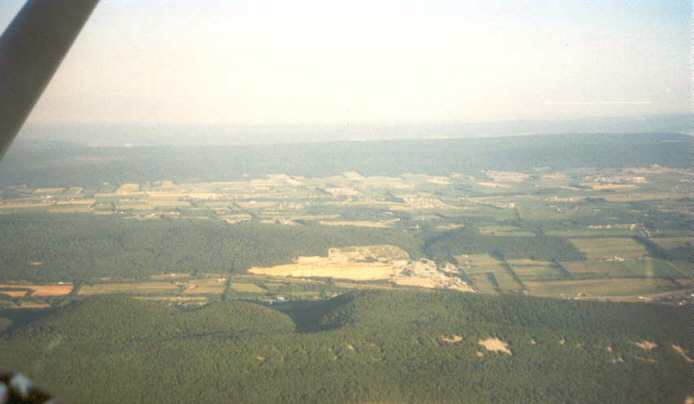 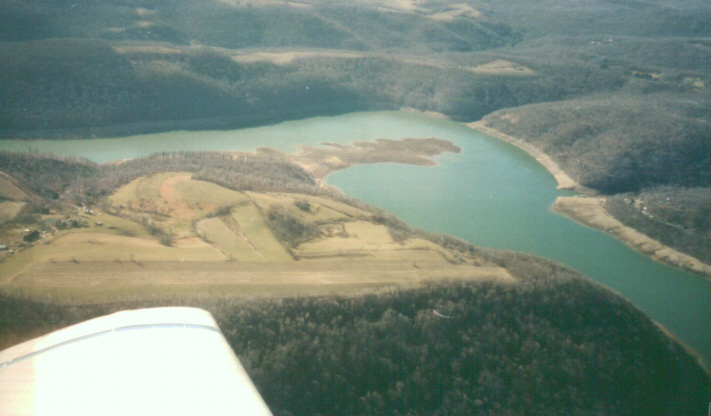 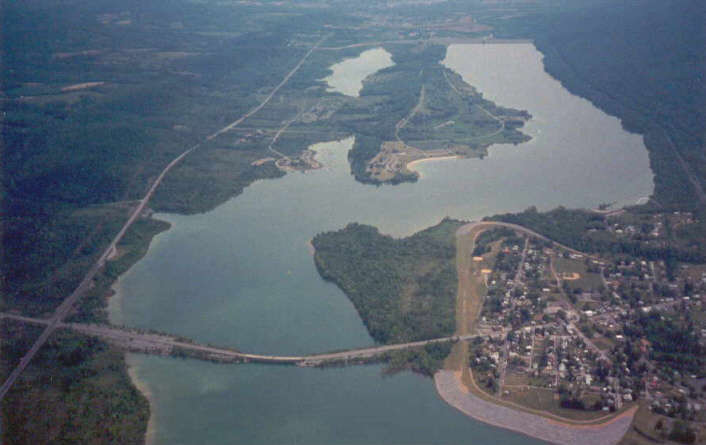 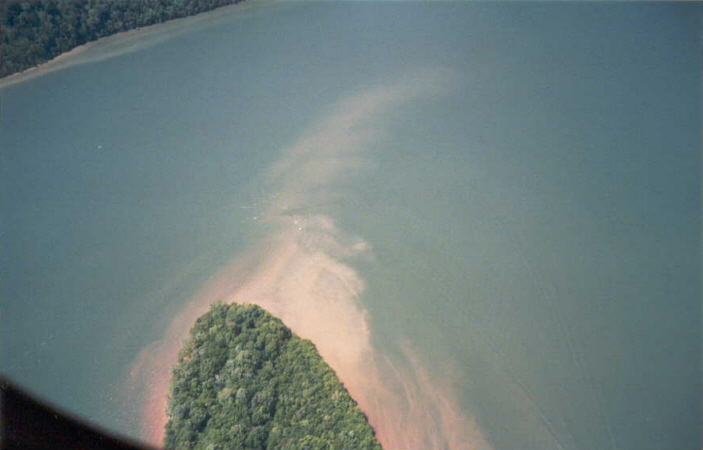 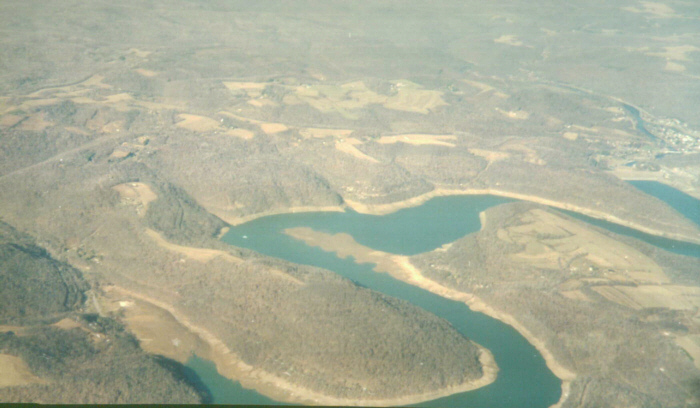 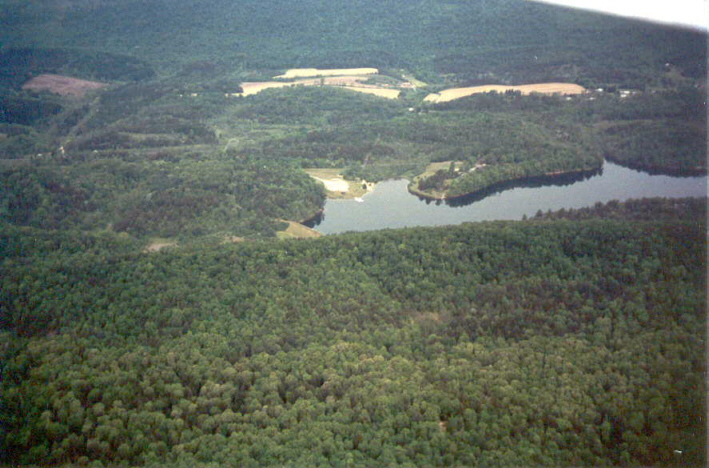 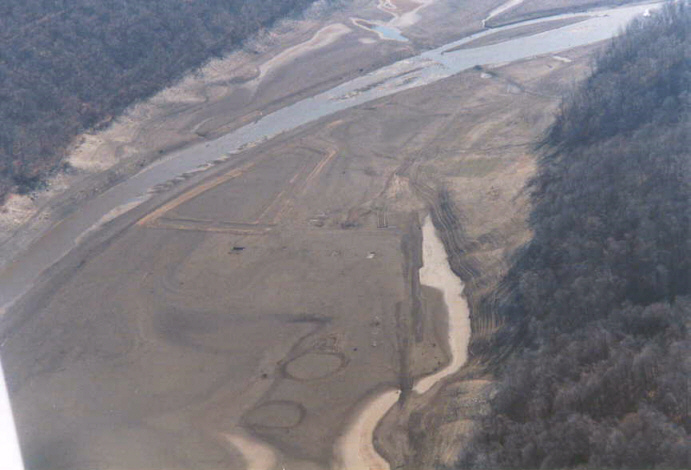 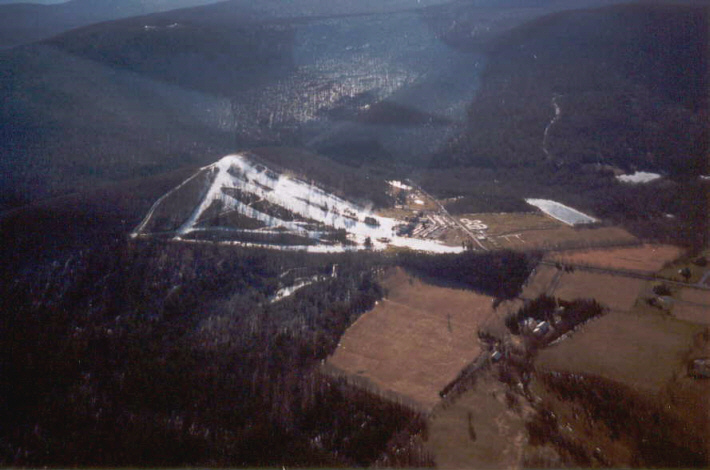 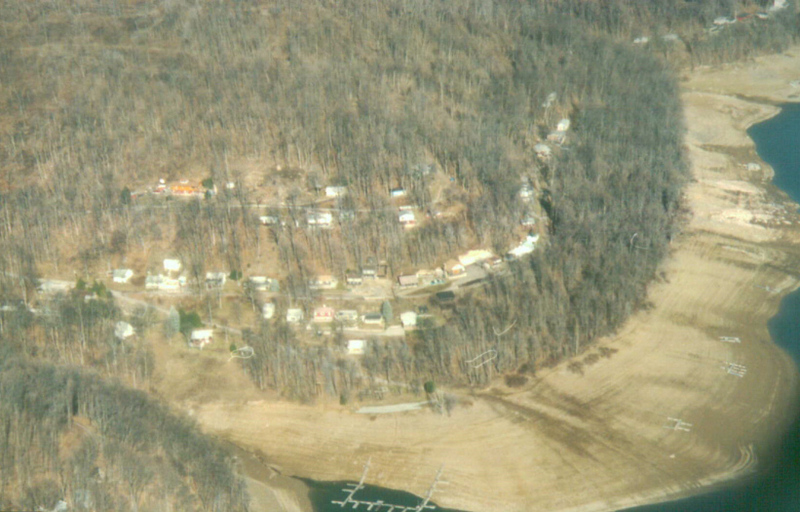 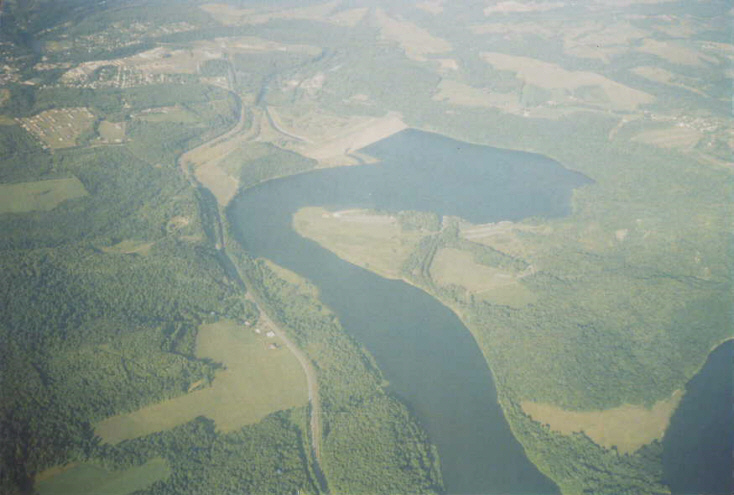 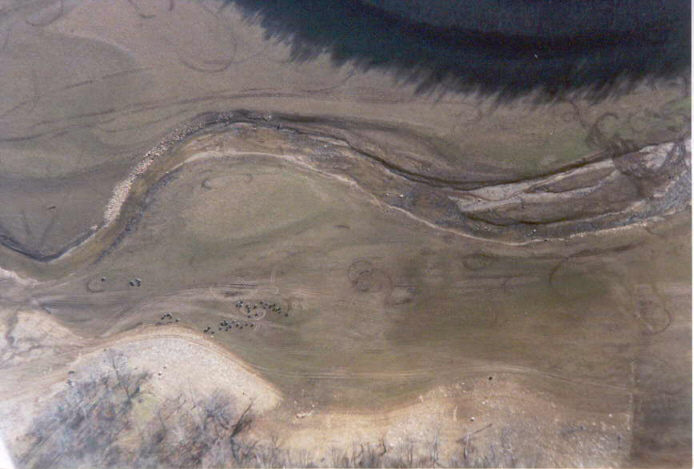 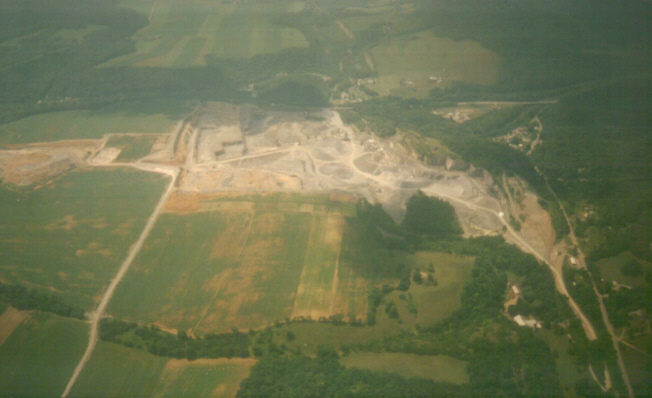 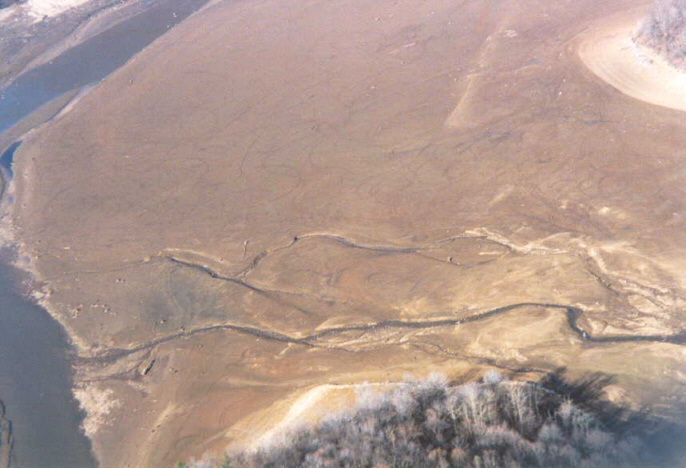 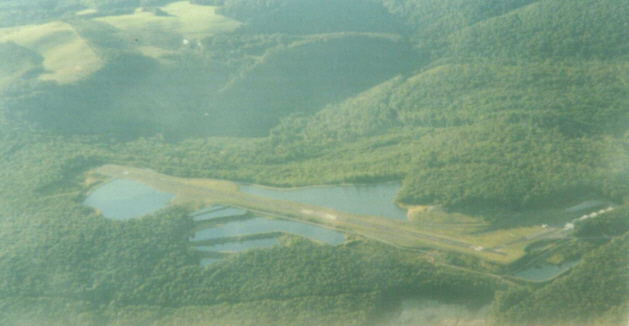 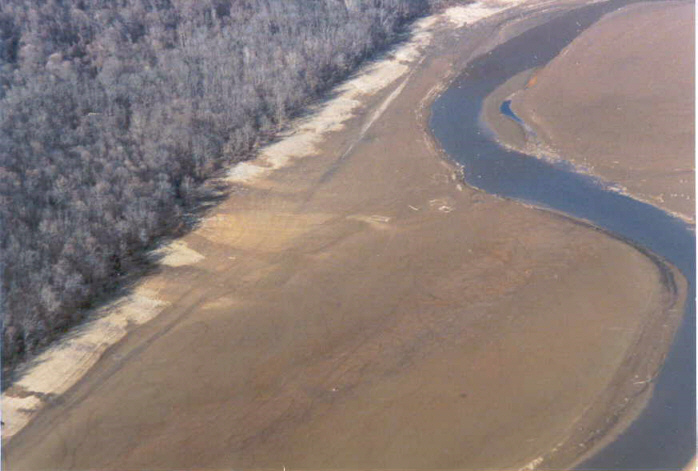 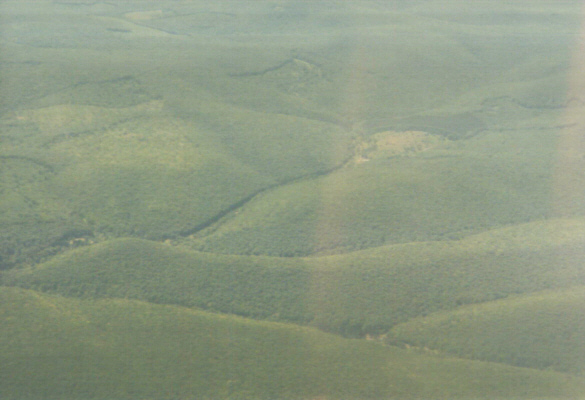 Area of Gallitzin Lake, Pennsylvania, 01/29/2000 from 5,500 ft MSL. 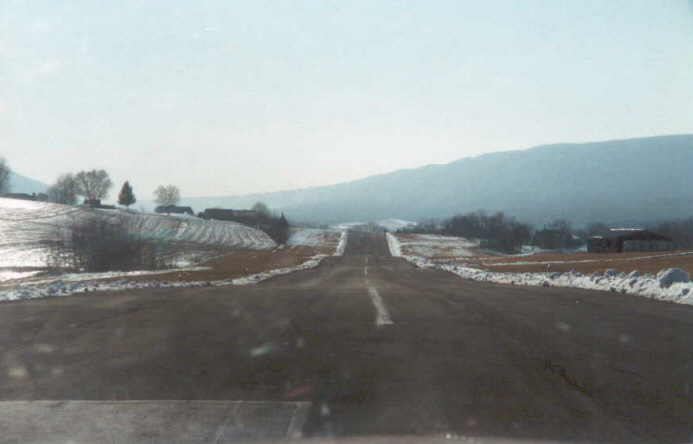 I don't know how far above the mountain tops, but at least 3,500 above ground. 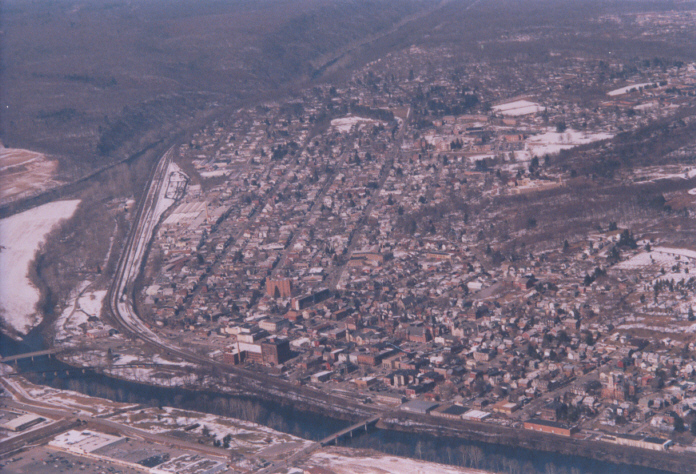 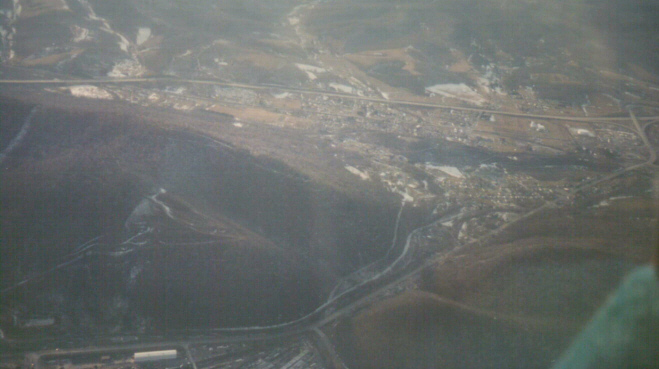 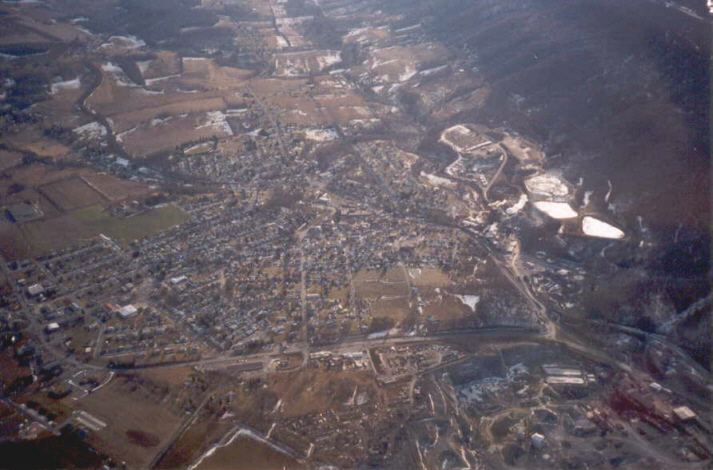 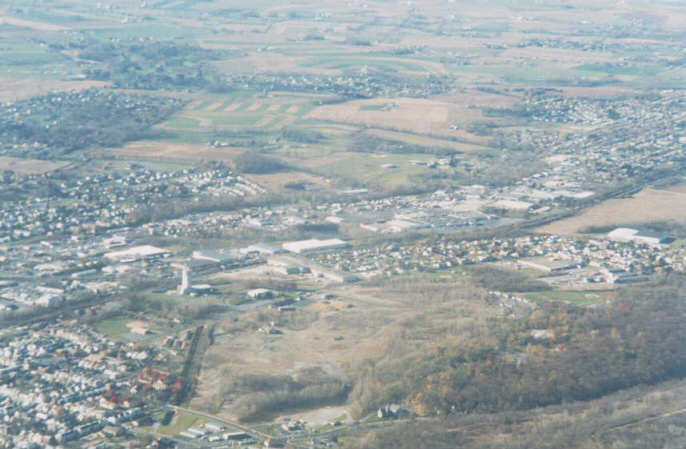 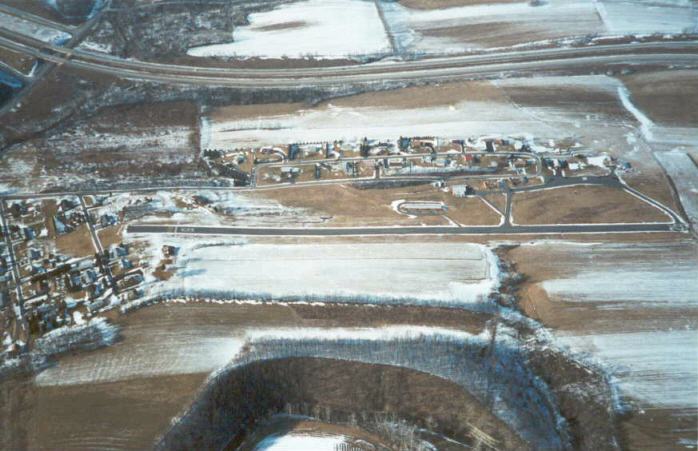 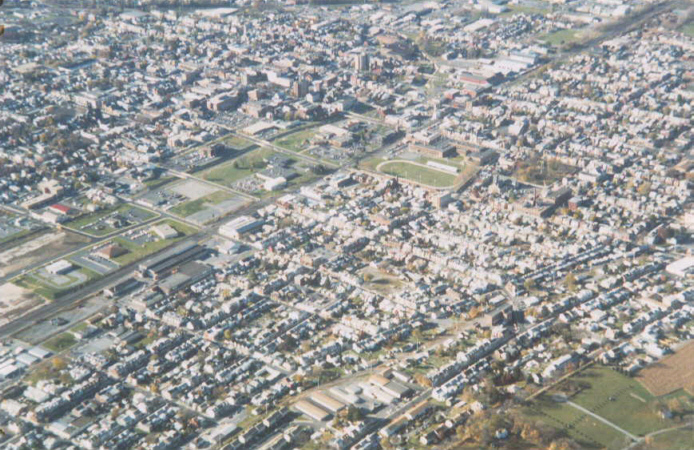 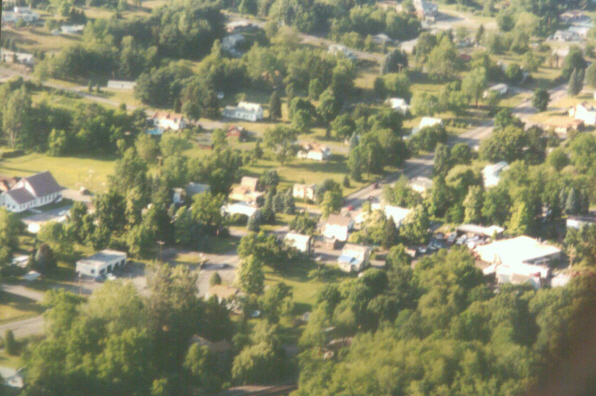 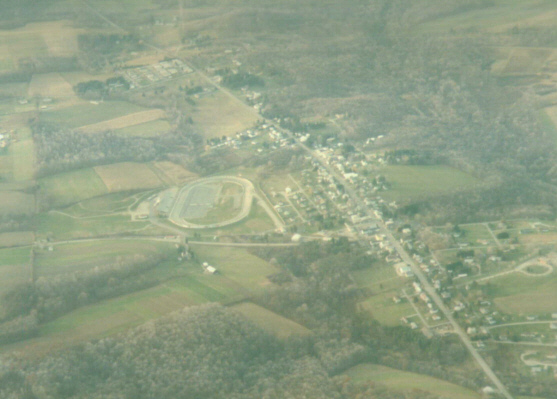 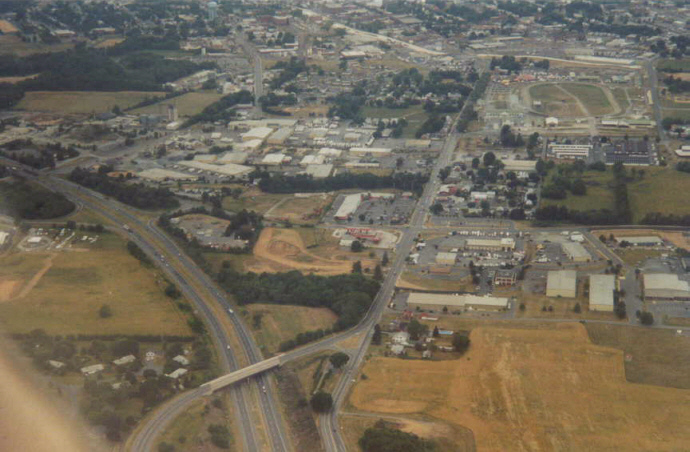 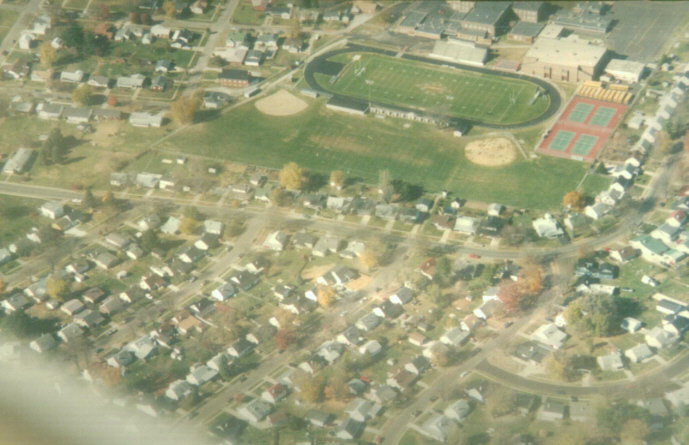 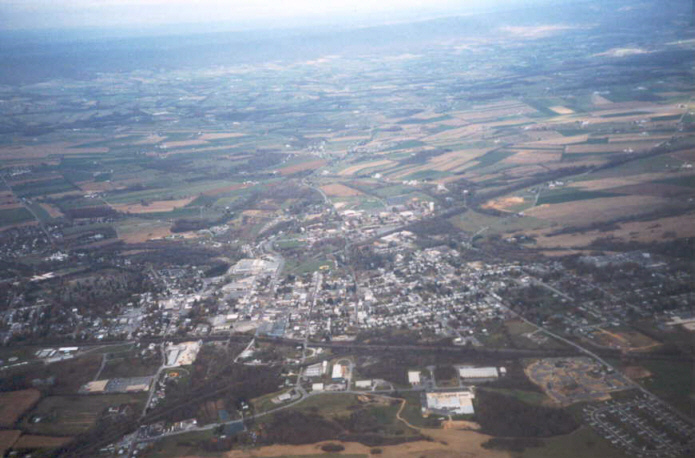 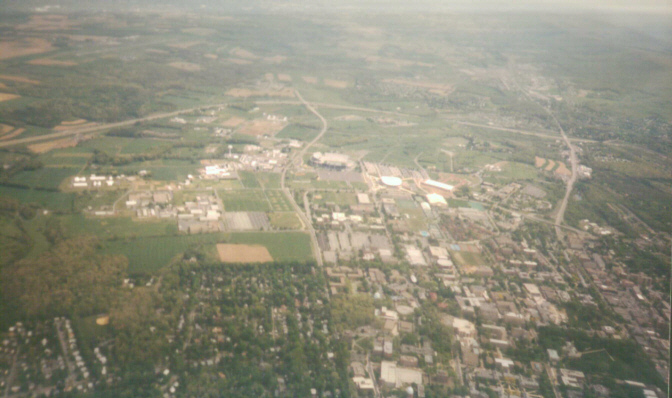 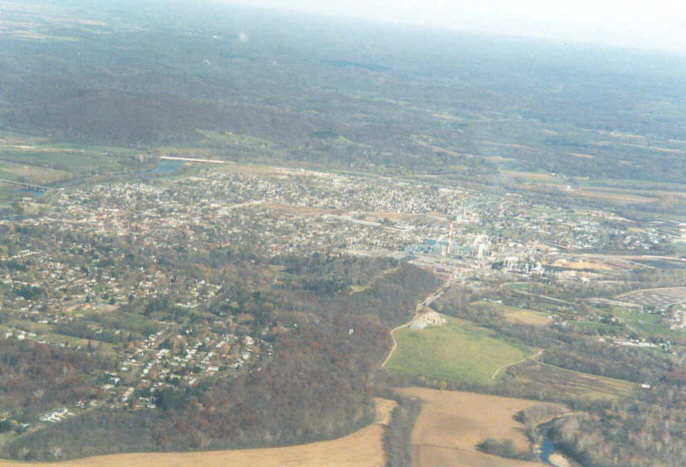 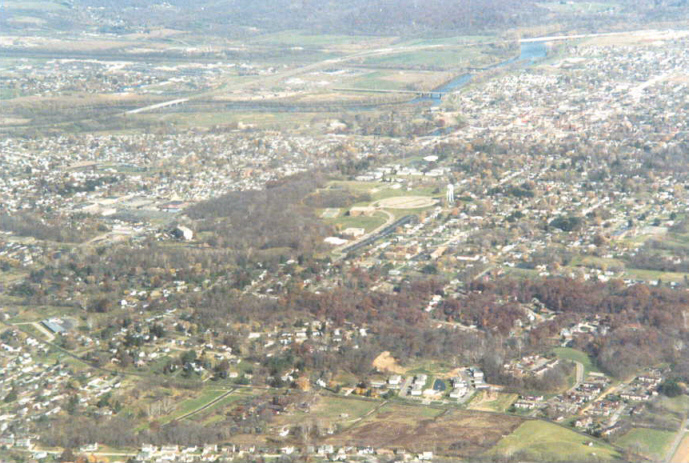 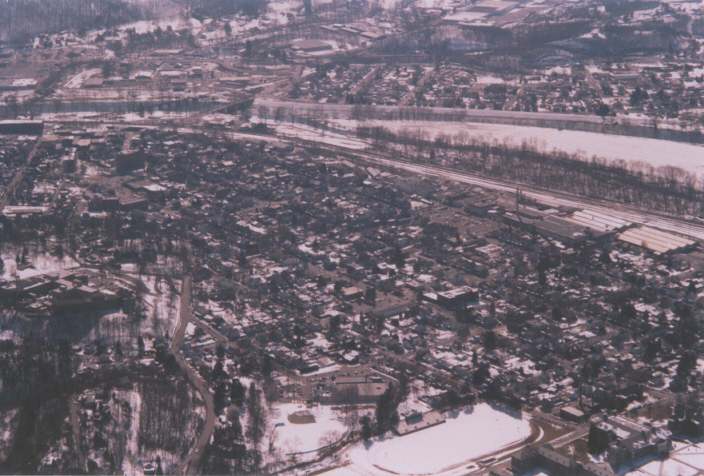 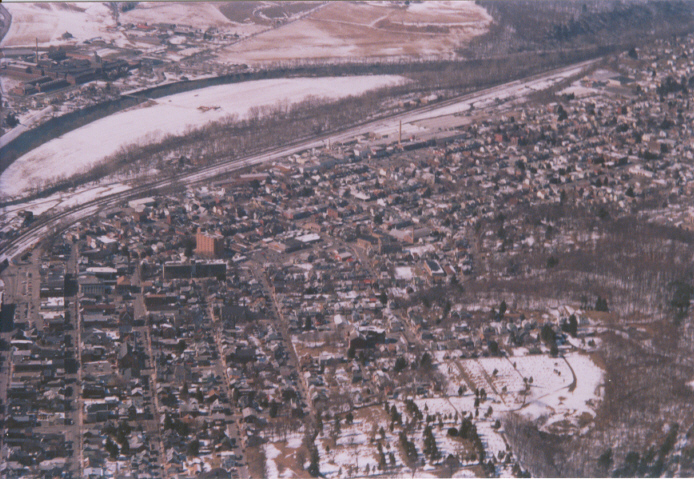 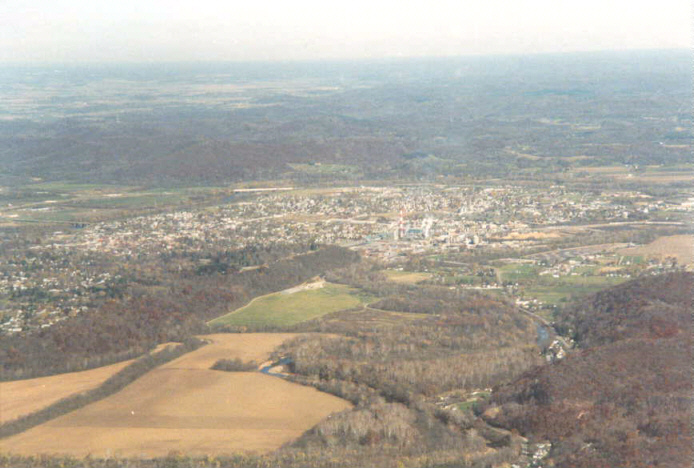 Altoona, Pennsylvania, from 5,500 feet, 01/29/2000 - This is shortly after flying over the Horseshoe Curve. 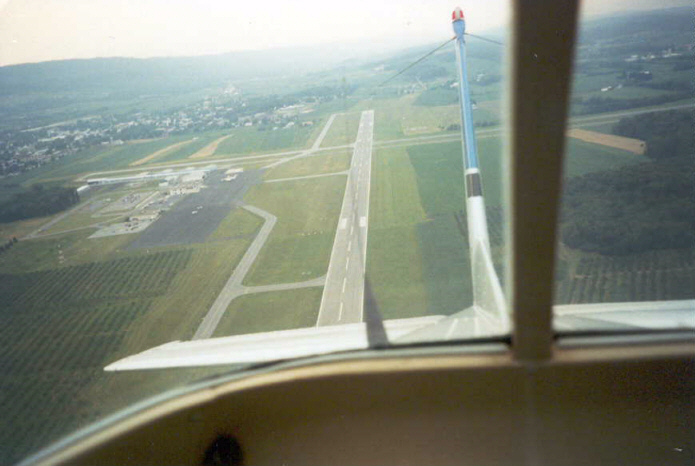 The wing is in the picture to show the pilot's view. 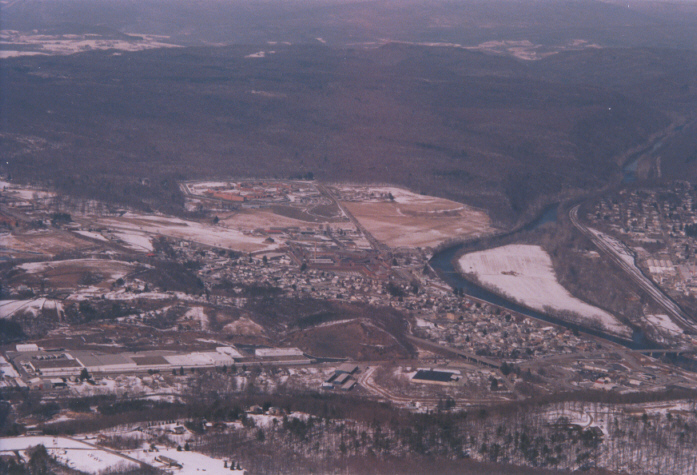 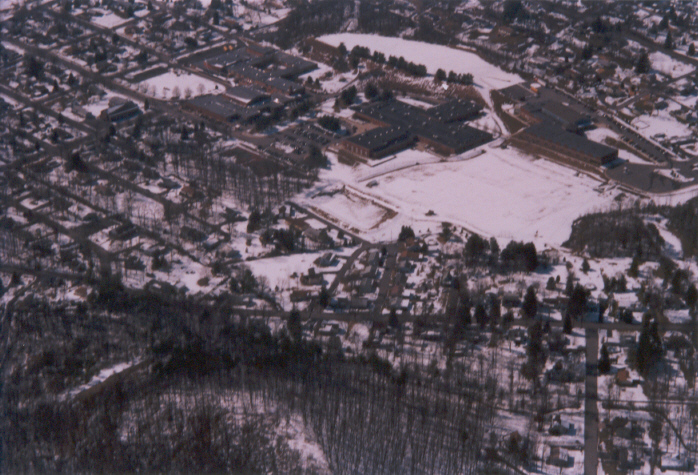 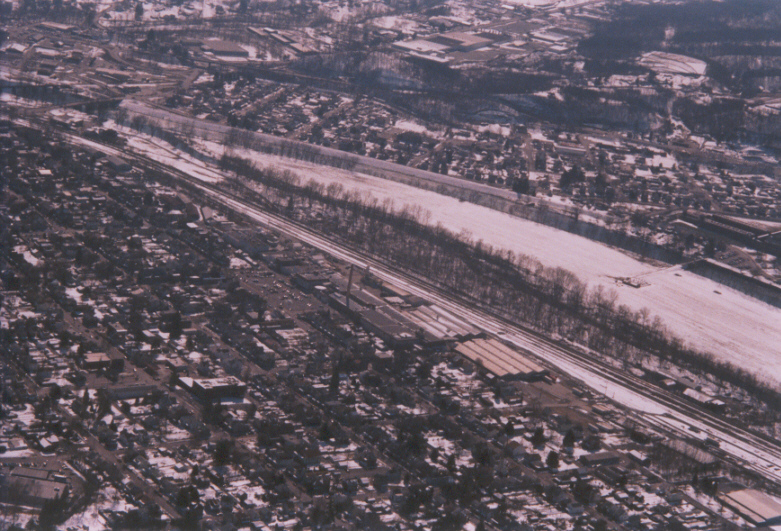 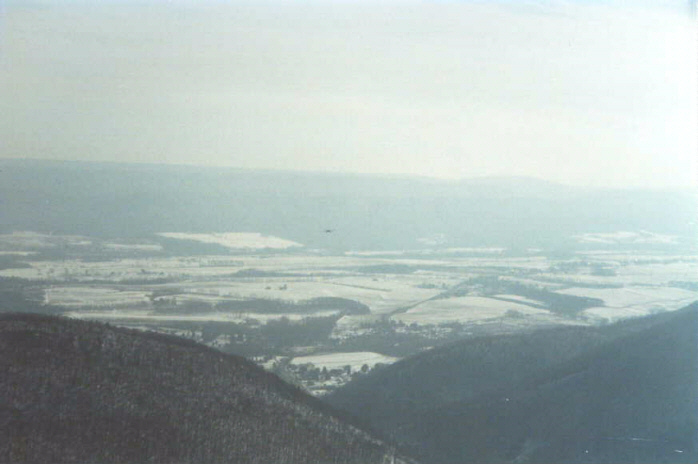 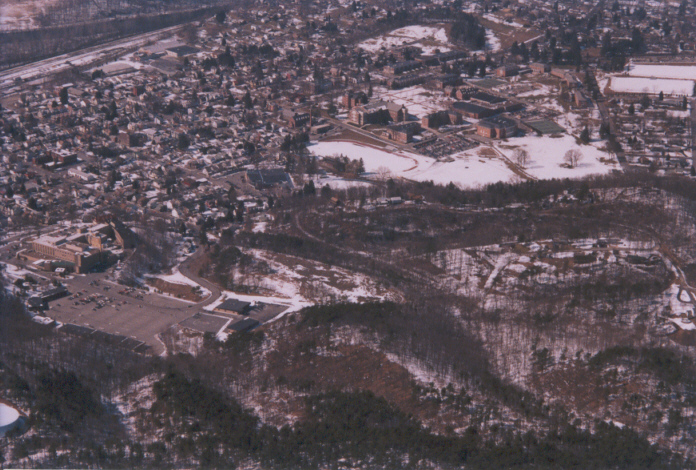 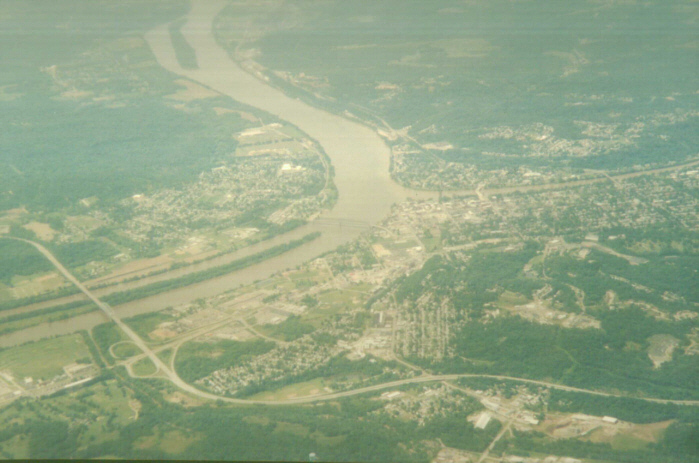 This is flying into the "Practice Valley" from Lock Haven, Pennsylvania, 02/21/2000. 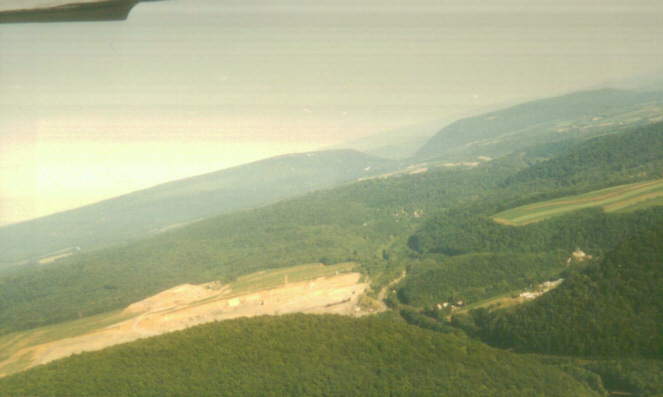 Believe it or not, that little black dot in the center is a plane that just passed over the nearby mountain. 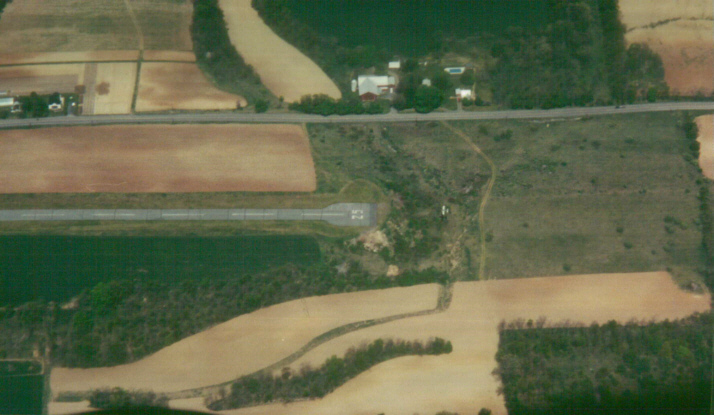 It's only about a mile away from the plane I was flying. 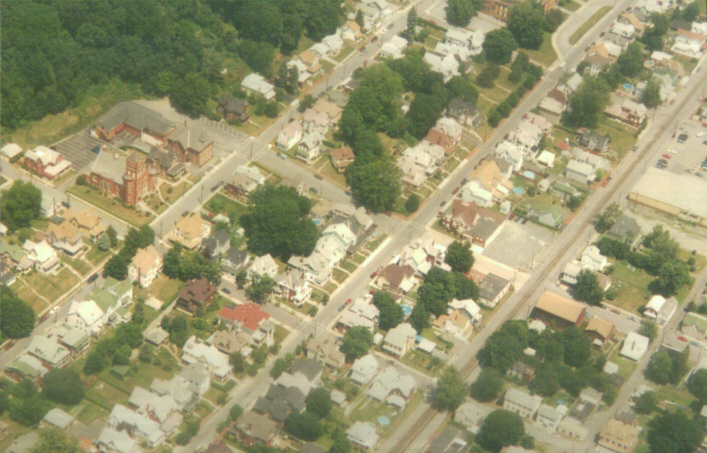 Tamara's house, 06/20/2000 - Unfortunately, it's hidden mostly by trees. 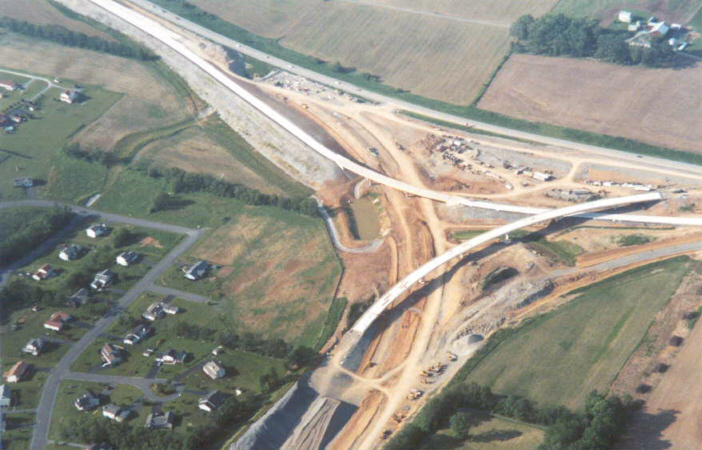 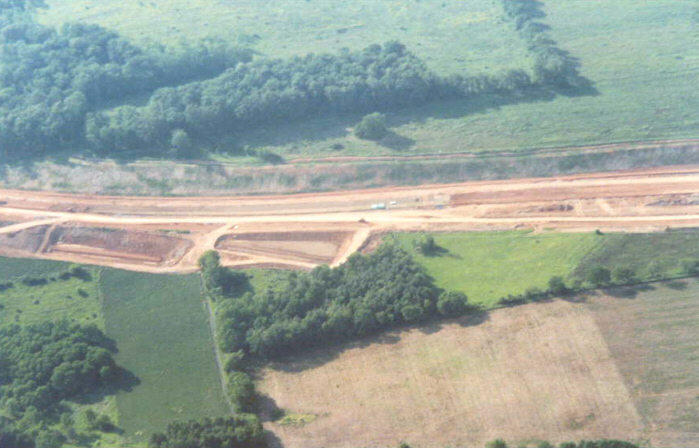 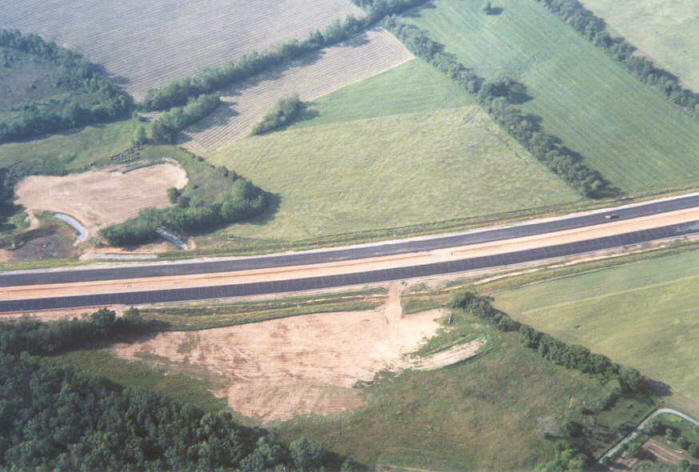 This collection of I-99 while being built contains pictures of various sections stretching from State College, PA to I-80. 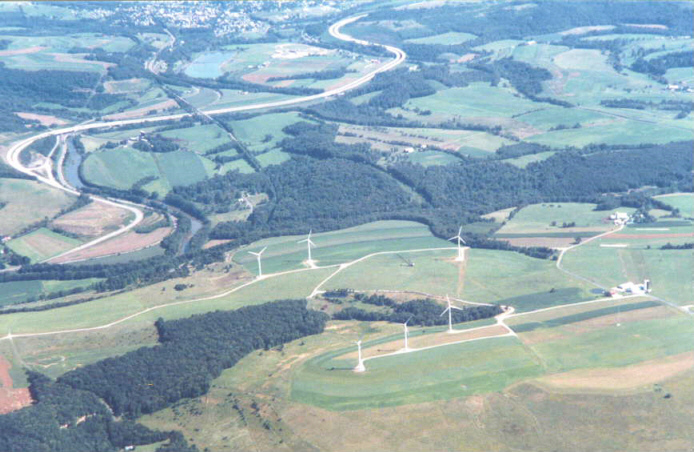 Located on a hilltop 2,300 to 2,460 feet above sea level, next to the small town of Garret are eight wind turbines, windmills, designed to generate 10.4 megawatts of electricity, enough for 2,500 homes. 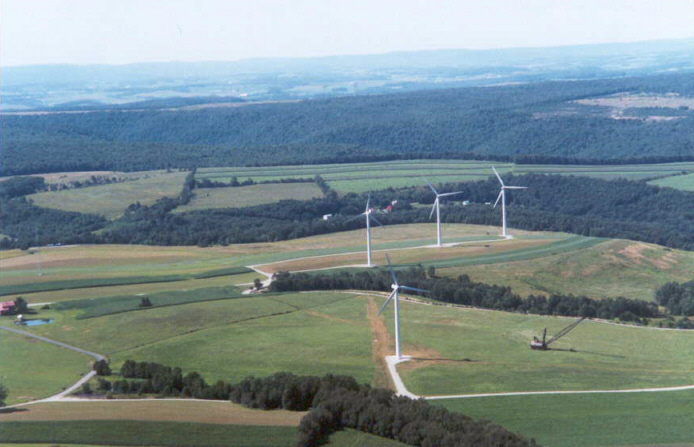 Each one is 200 feet high, 14 feet in diameter, steel tubular towers. 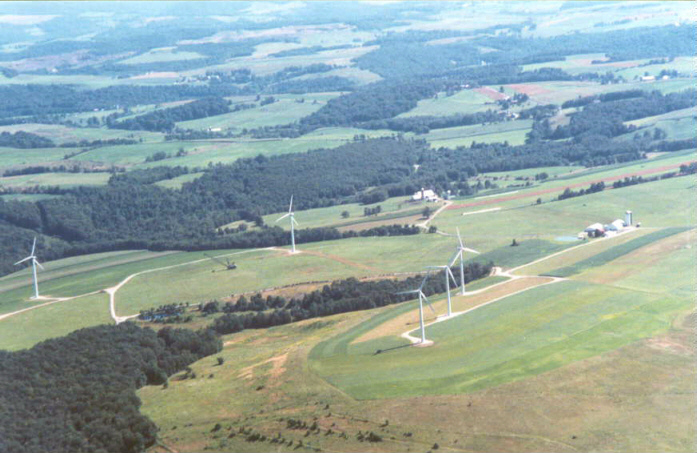 A turbine sits atop each tower. 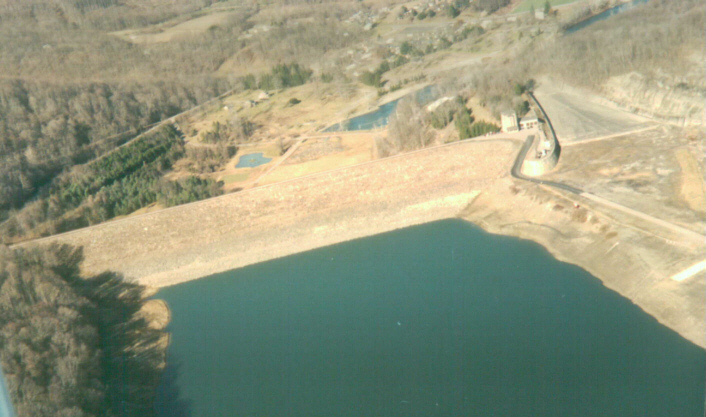 It is turned by three, 90 foot long blades. 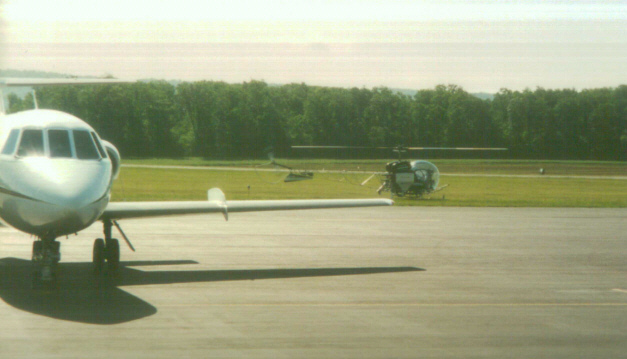 Each blade weighs 5 tons. 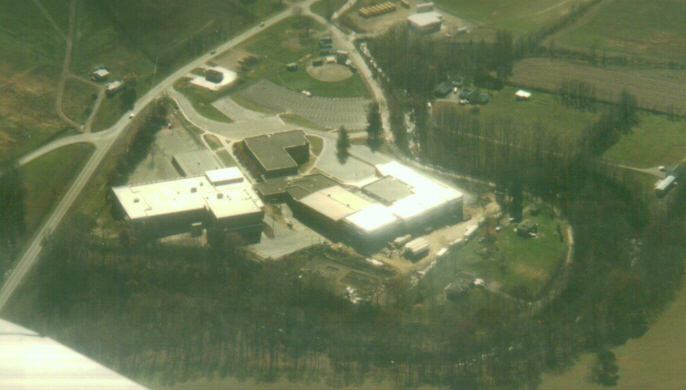 It is a $10 million project. 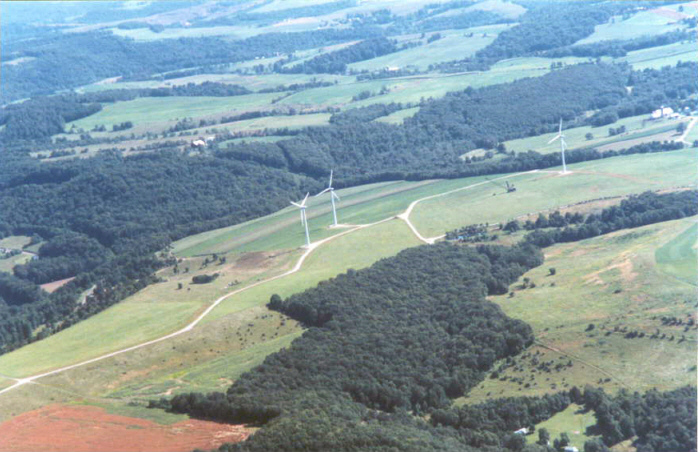 Using the wind to generate electricity instead of coal, it is will save 135 tons of acid rain producing sulphur dioxides, 35 tons of smog-generating nitrogen oxides and 17,500 tons of carbon dioxide, a gas that contributes to global warming. 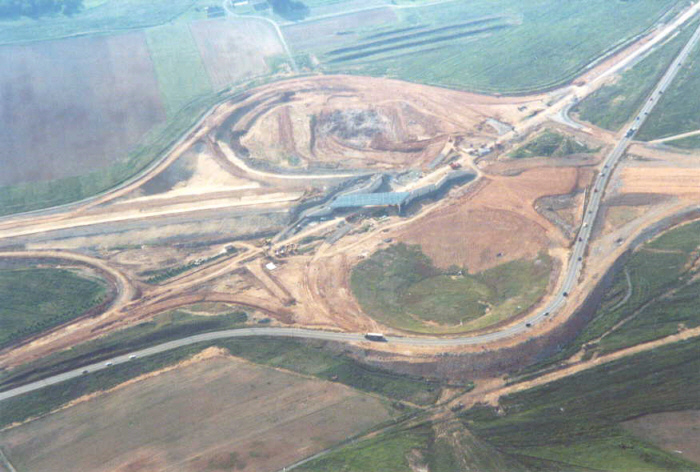 It was quite an endeavour to transport all the pieces up to the hilltop. 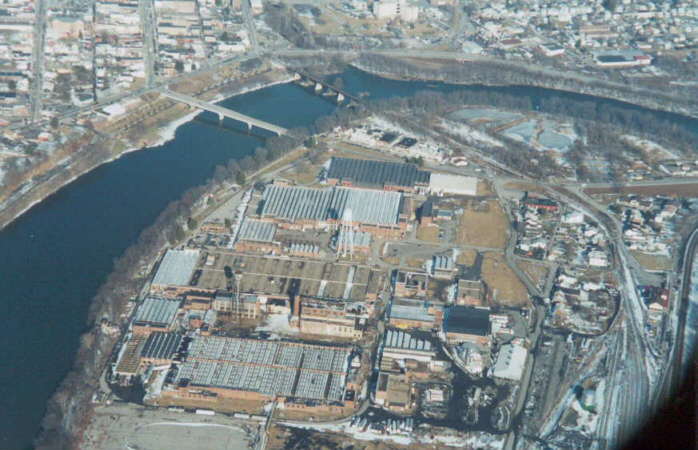 The towers were manufactured in Germany, shipped over the Atlantic to Port of Philadelphia. 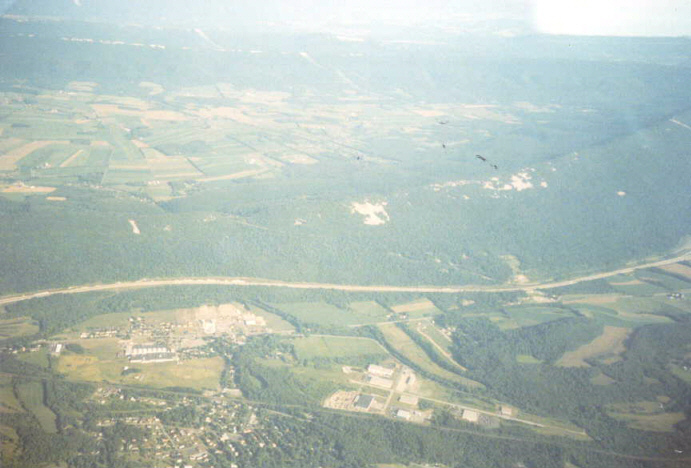 Some pieces were carried over the Pennsylvania Turnpike at a crawl. 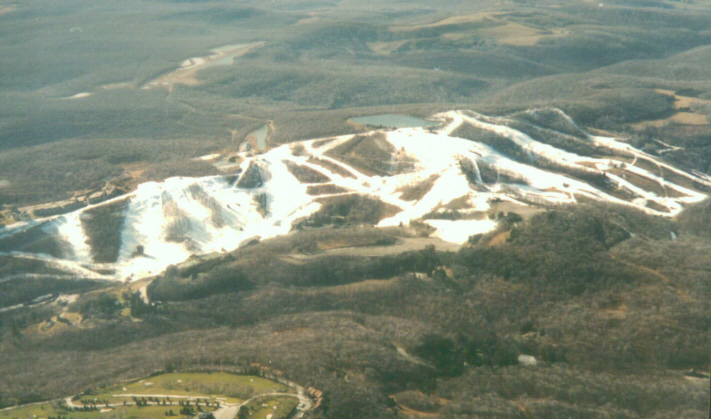 A normal five hour drive turned into two and a half days. 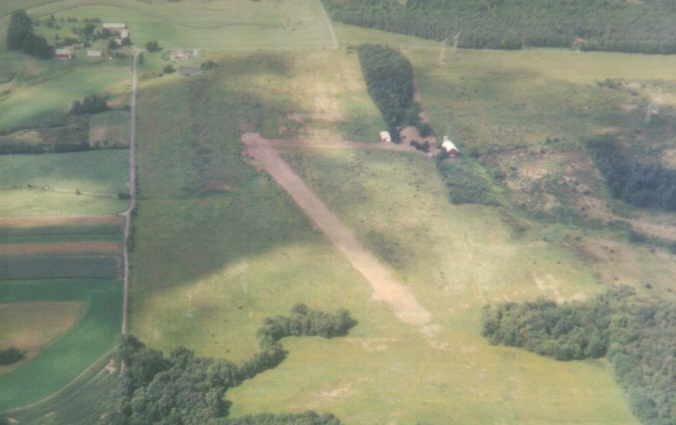 Other pieces were too big. 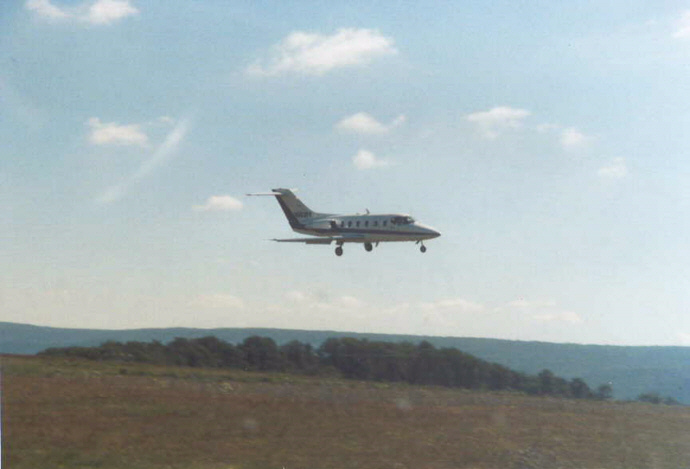 They had to be taken over various routes in Pennsylvania to arrive at their final destination. 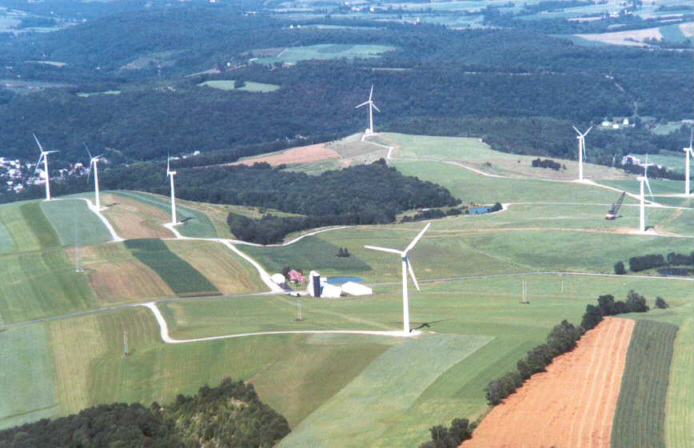 One truck with a single nacelle on its 80 foot trailer climbed the hill to where the windmill was erected at 6 MPH. 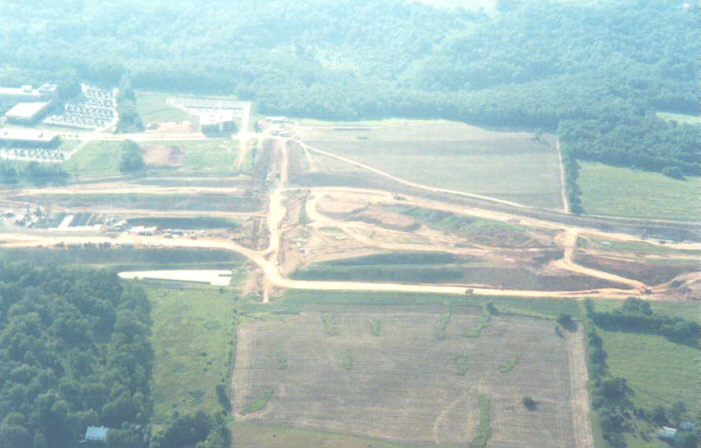 Each steel tower came in two pieces. 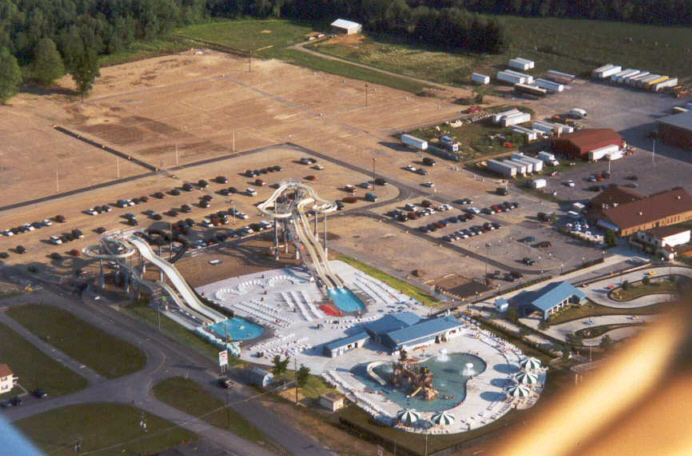 A 130 foot crane and a 230 foot crane were required to assemble the towers. 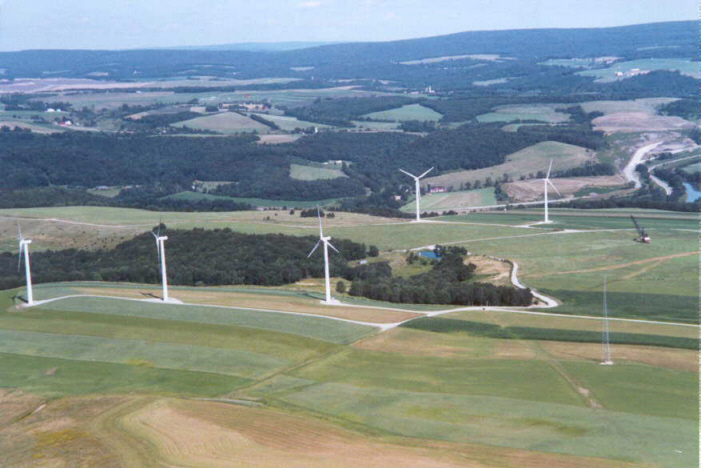 Compared to years ago, these windmills are bird friendly. 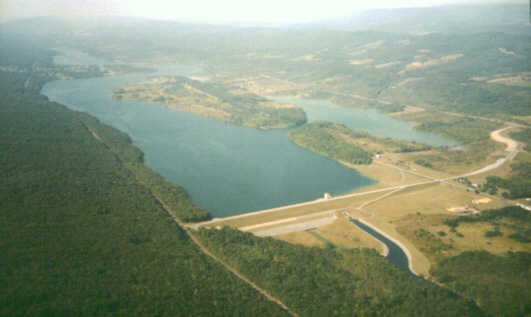 Old ones spun fast, killing birds which ventured too close, and only generated a small percentage of electricity compared to these present day miracles. The new windmills spin considerably slower. 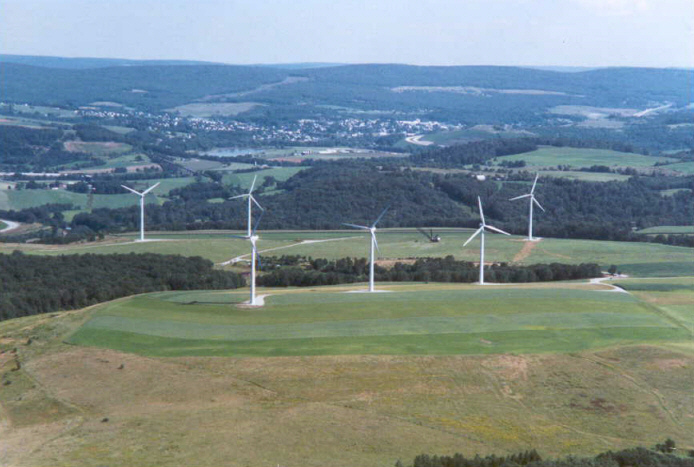 Depending on wind speed, the blades make one revolution up to 19 times a minute. 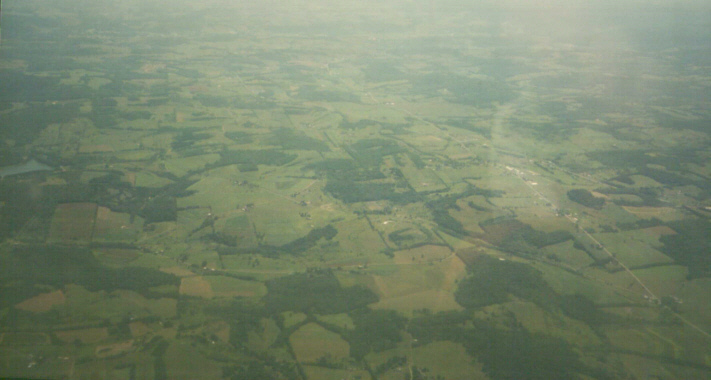 The wind was calm when I flew around the area. 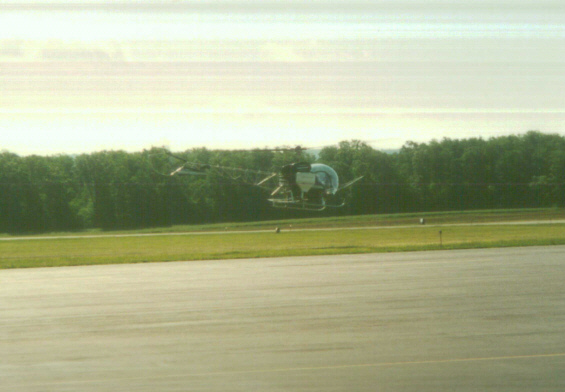 The blades were not moving making photography even easier. 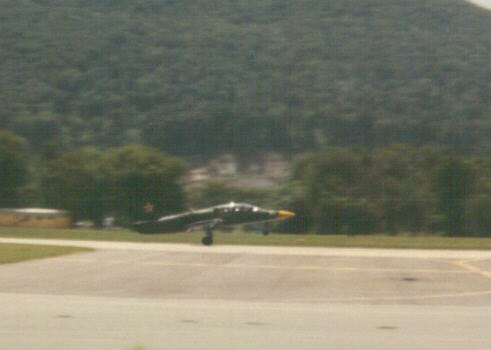 The pictures posted here do not give justice to this impressive sight. 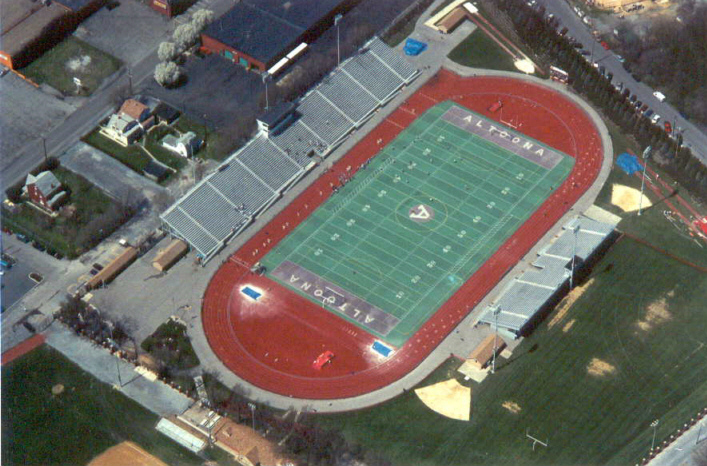 You simply have to be there to appreciate it. 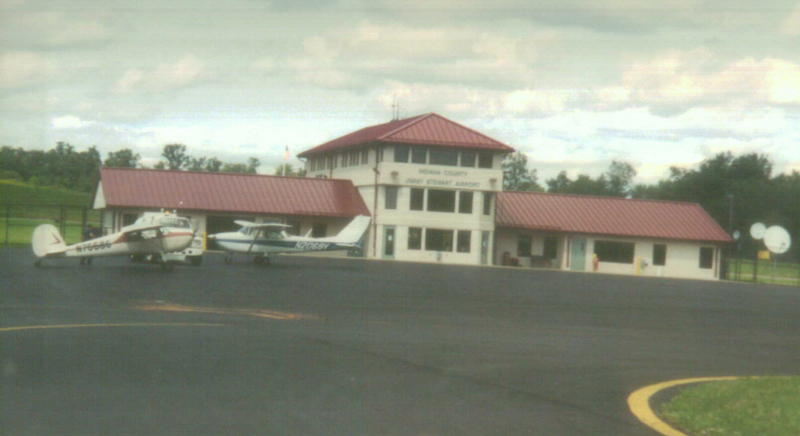 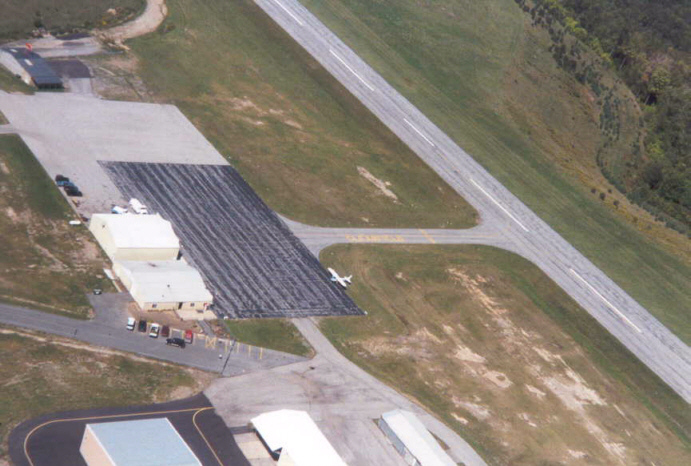 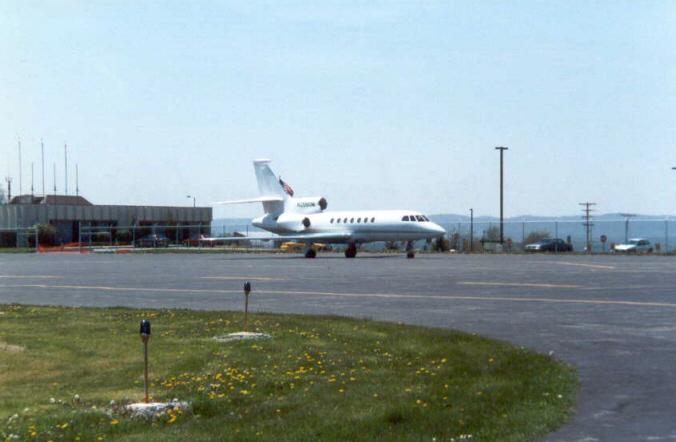 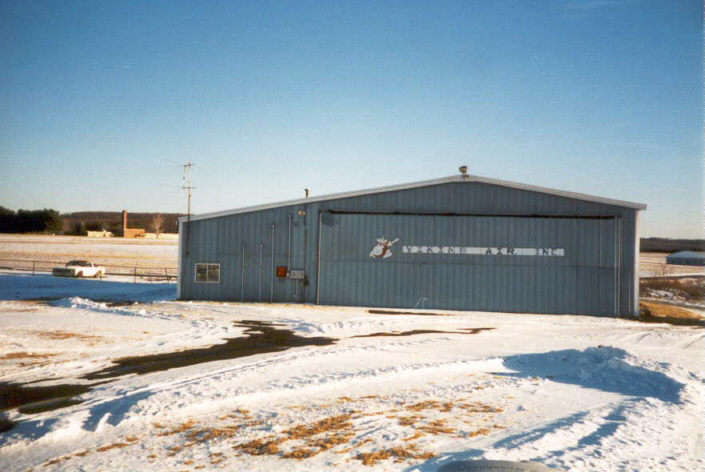 Johnstown-Cambria County Airport (JST), Pennsylvania, 04/99 - In Fall of 1999, a new terminal building was finished which has a good restaurant. 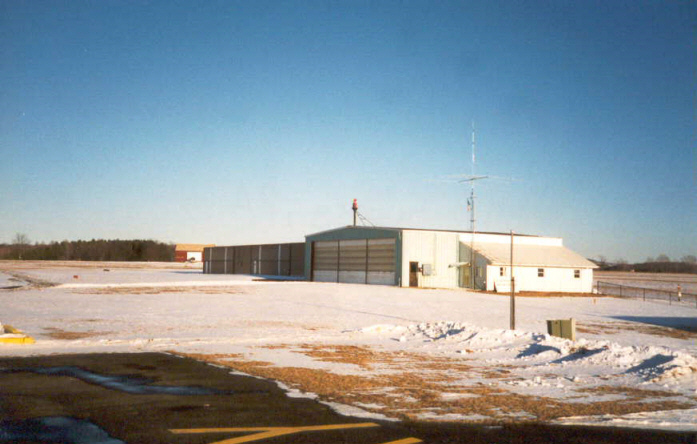 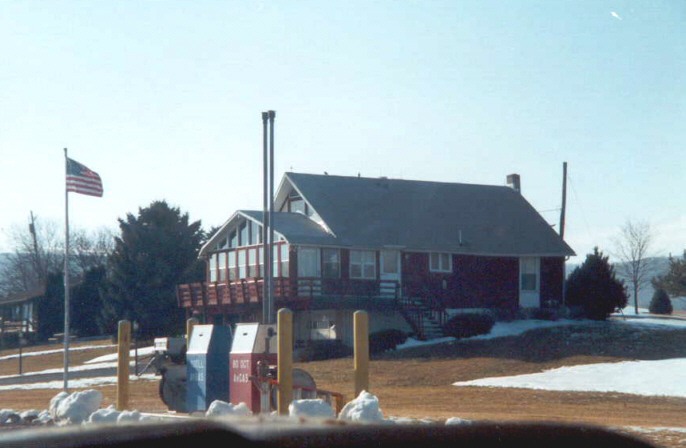 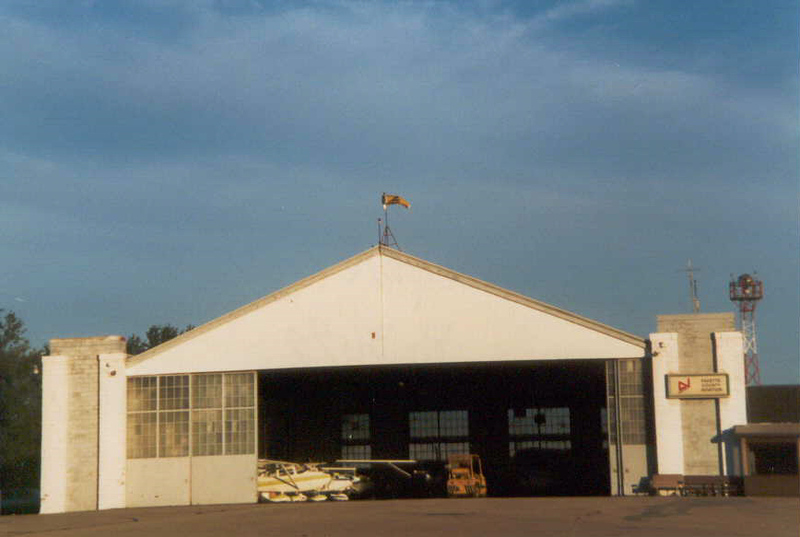 A new control tower was still under construction in Fall, 1999, to replace the four sided window shack on field no more than 10 feet long on any side. 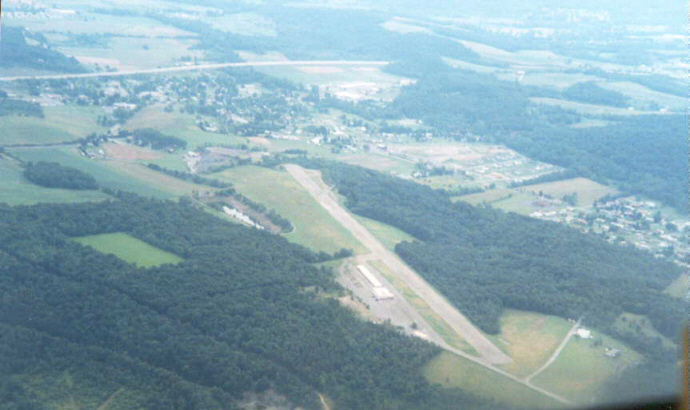 Penn's Cave Airport (N74) Fly-In, Centre Hall, Pennsylvania, 05/19/99 - This is the airport to use to visit the underground water cavern. 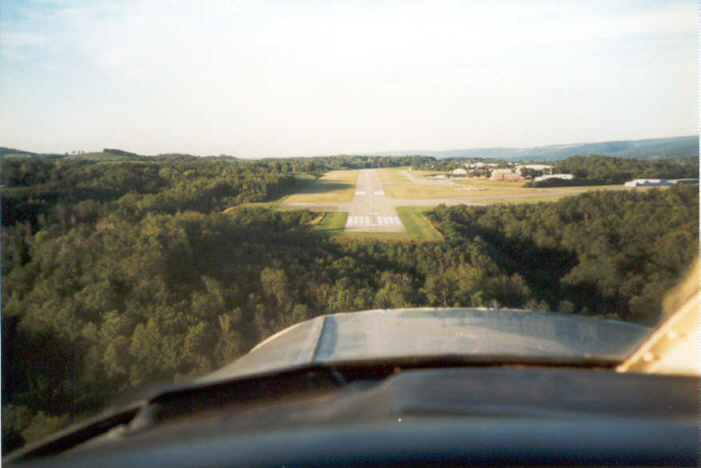 On Final Approach, Hagerstown Regional Airport (HGR), Maryland, 06/12/99 - This airport has the best restaurant on field that I have ever been too. 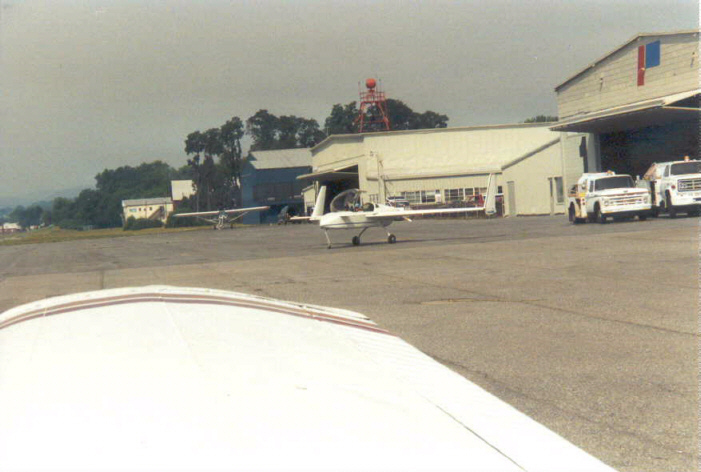 Sentimental Journey, William T. Piper Memorial Airport (LHV), 06/22/99 - The day before the annual fly-in event to celebrate the history of Piper Aircraft, especially the Piper Cub. 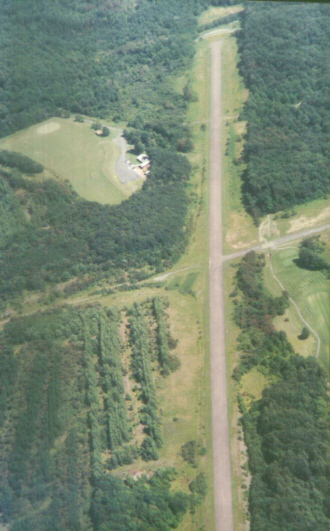 Downwind for Runway 9, Jersey Shore (P96), Pennsylvania, 09/11/99 - The Grass runway is from center left side of the picture over to the white buildings on the right side. 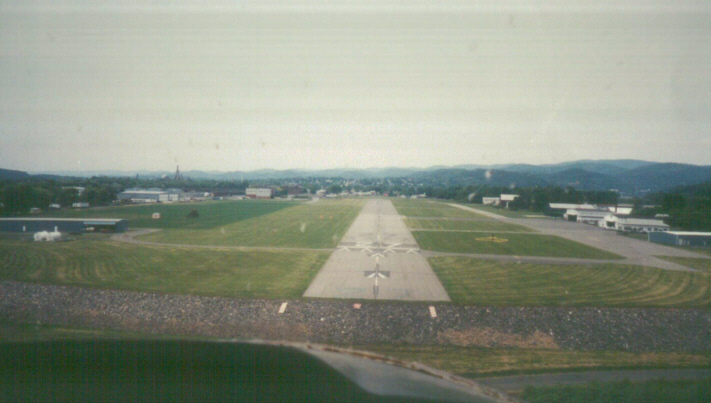 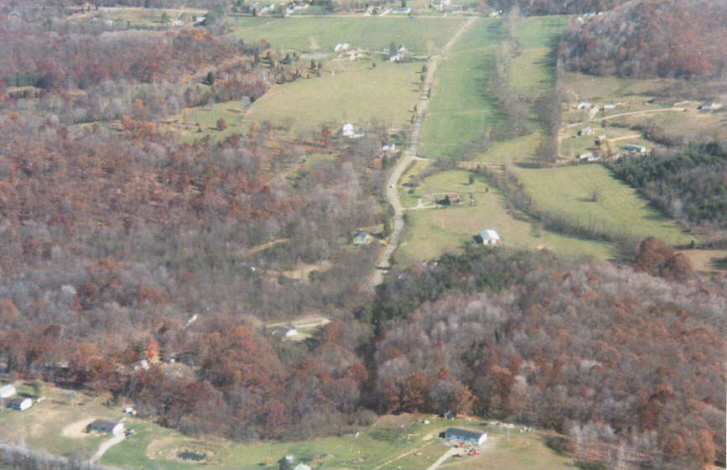 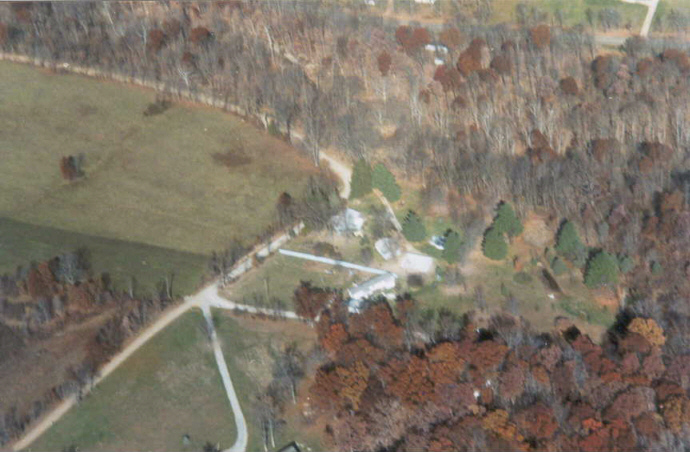 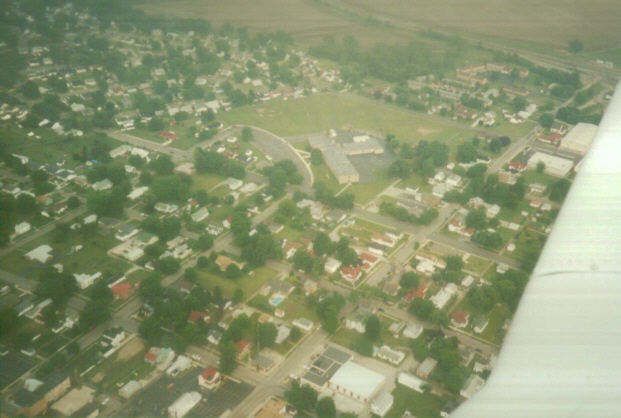 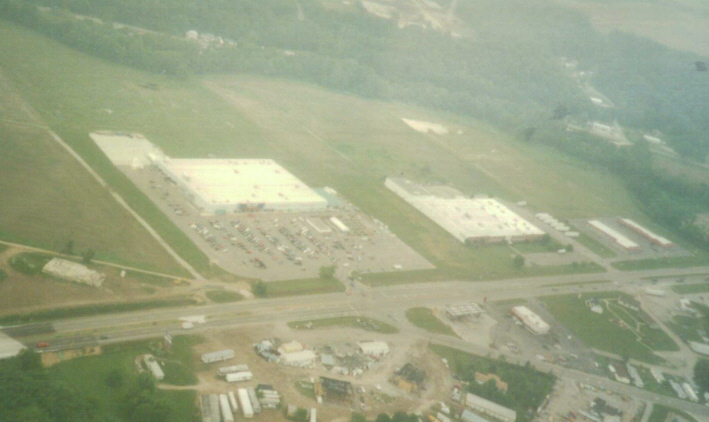 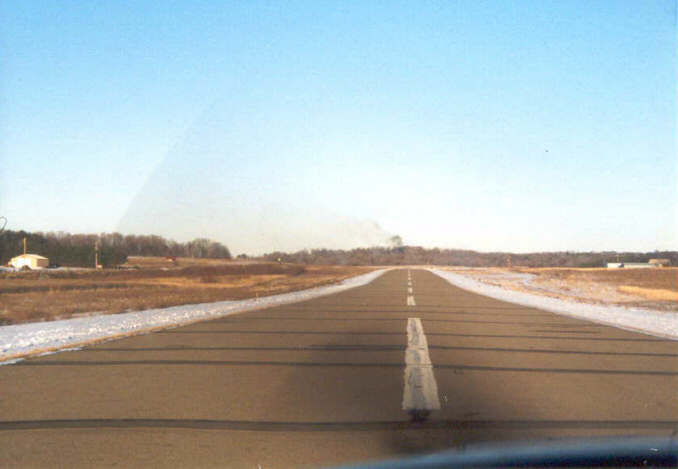 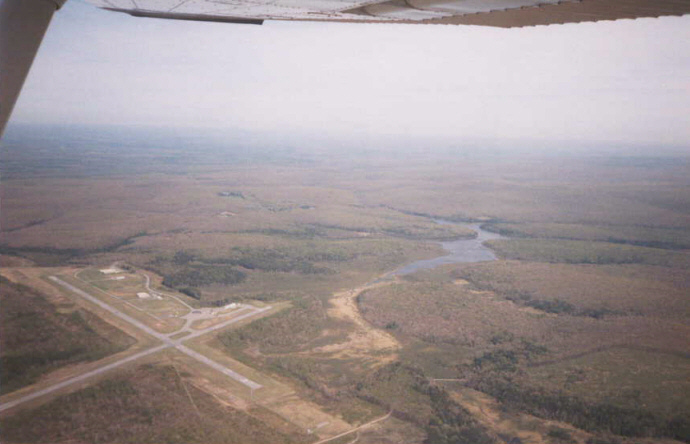 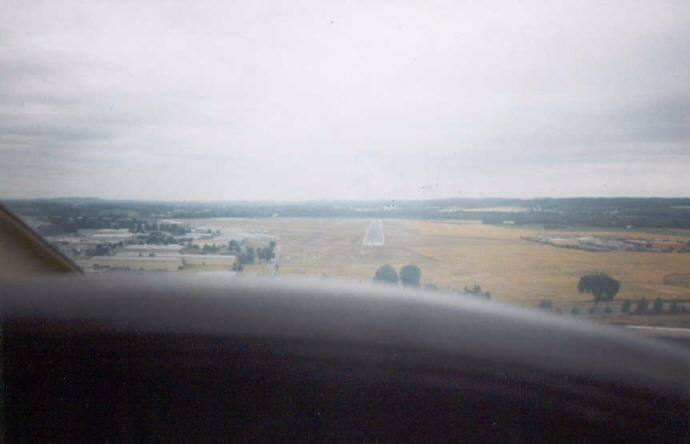 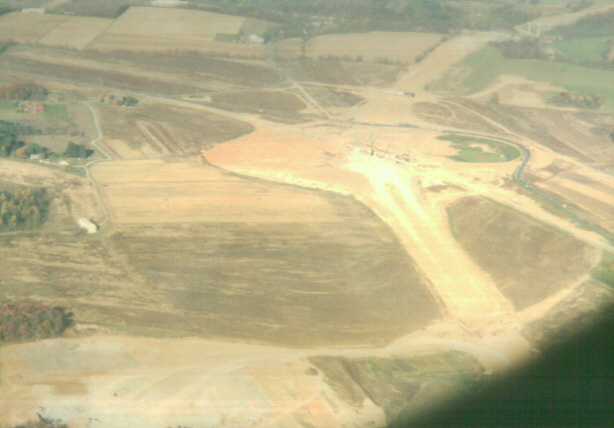 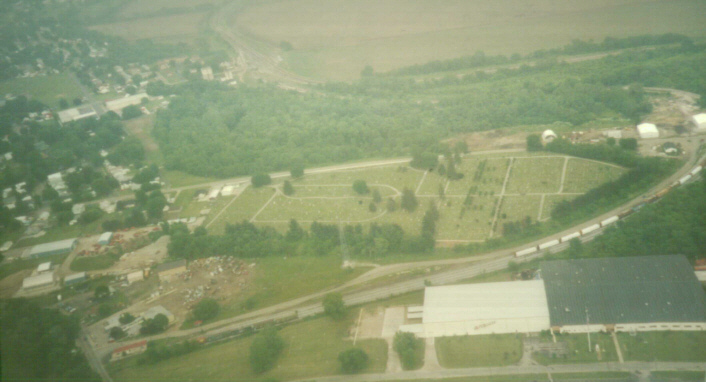 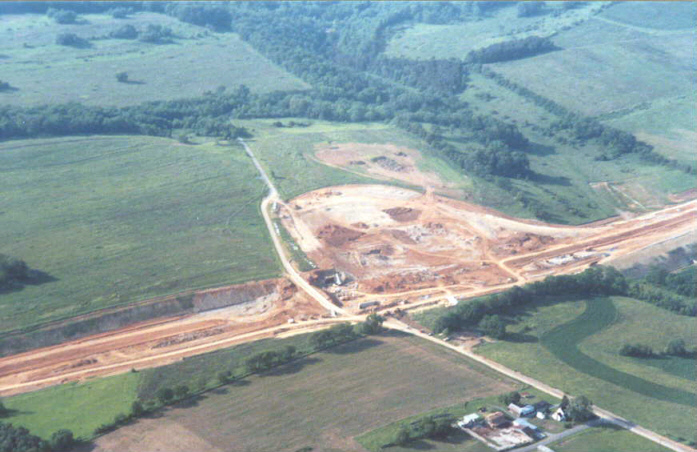 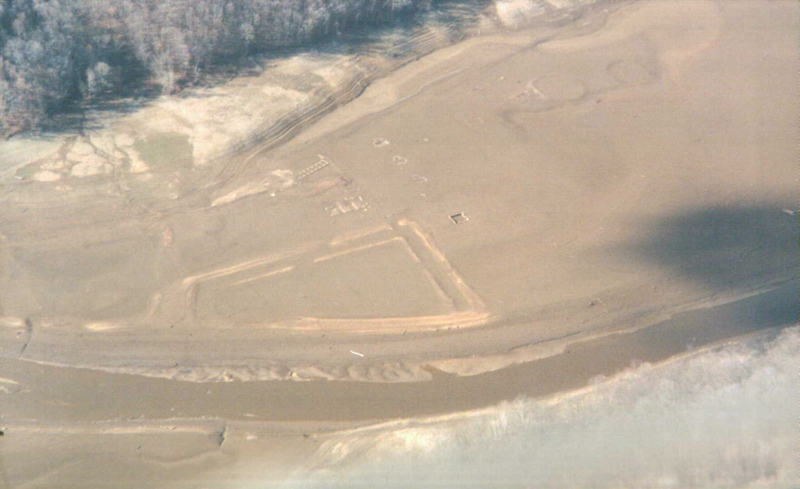 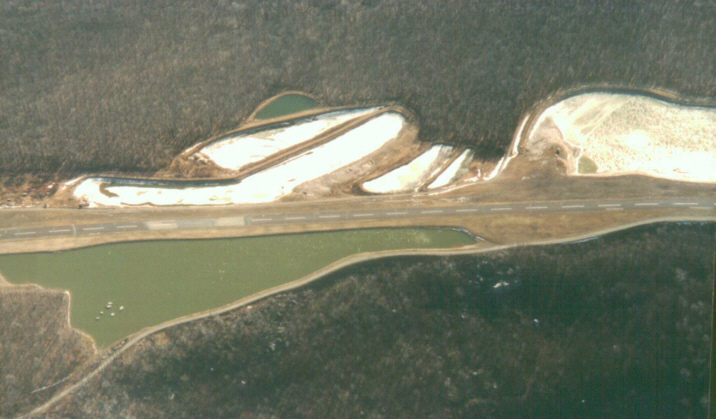 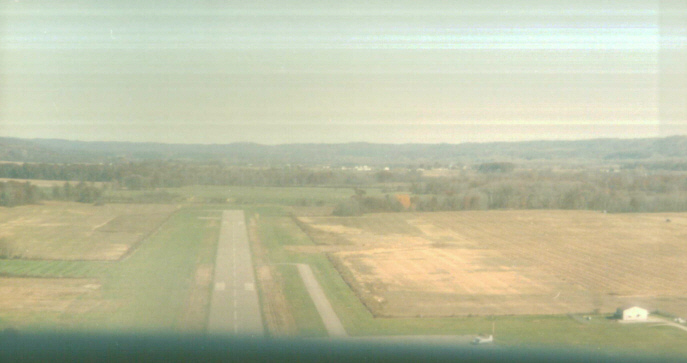 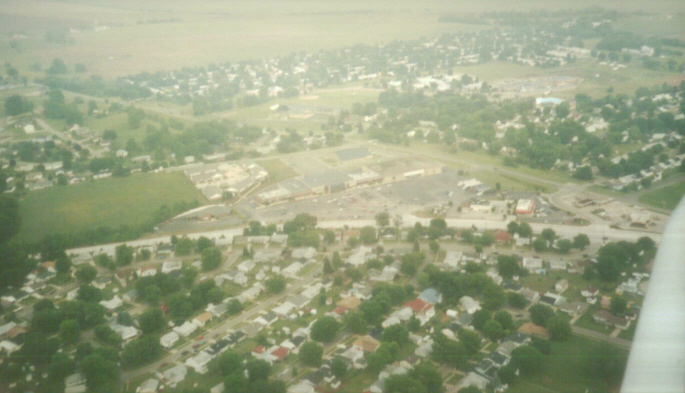 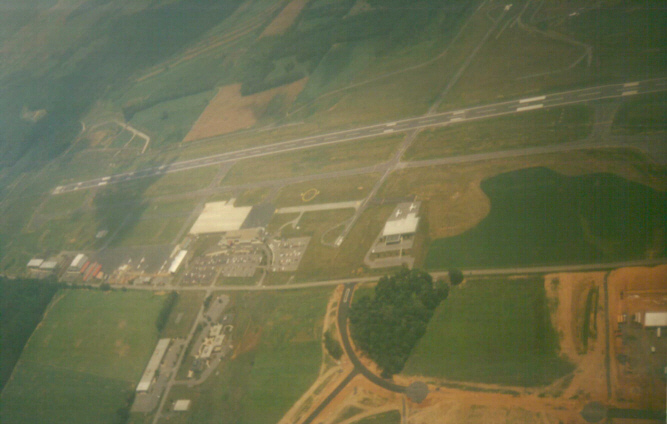 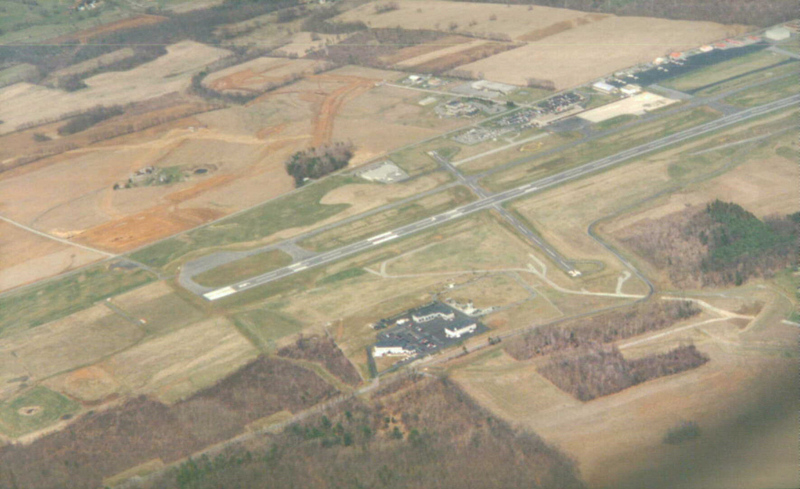 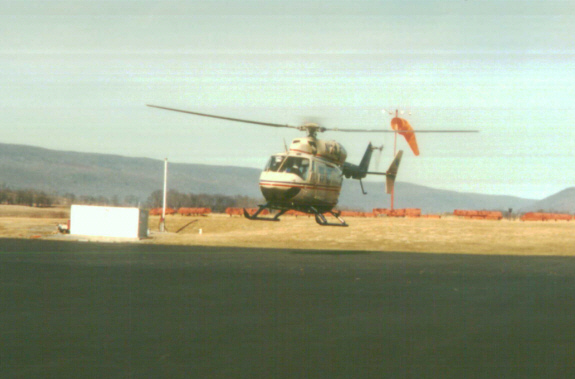 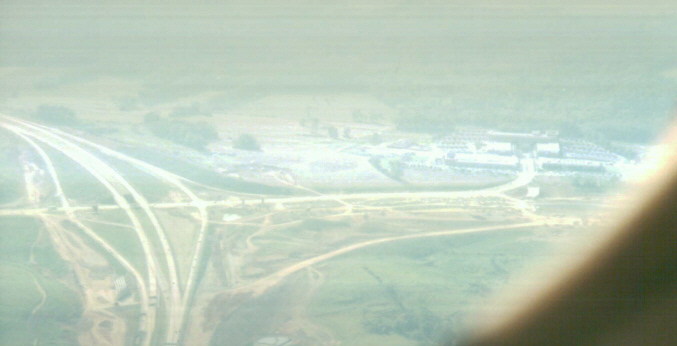 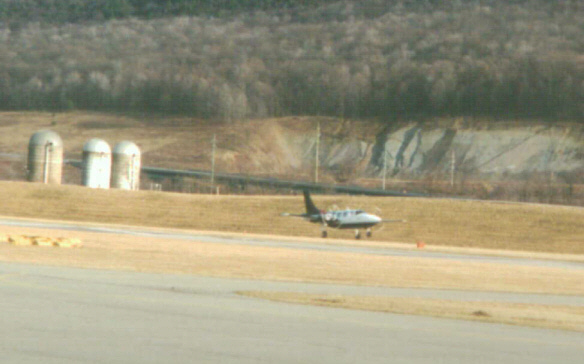 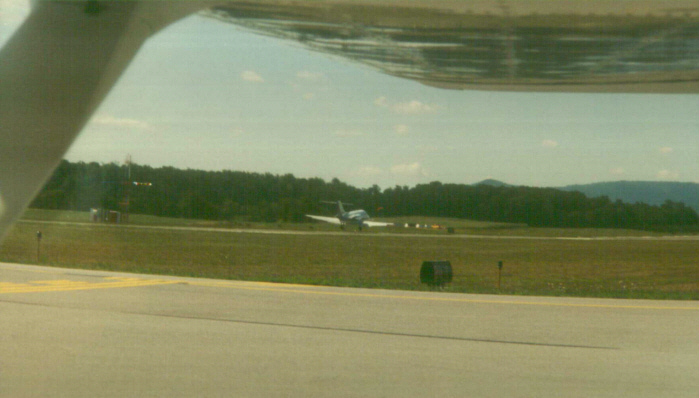 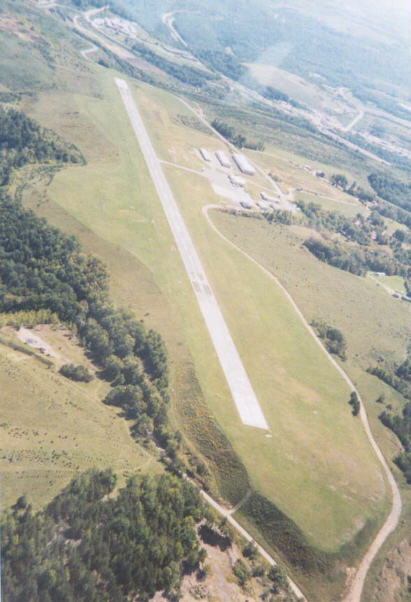 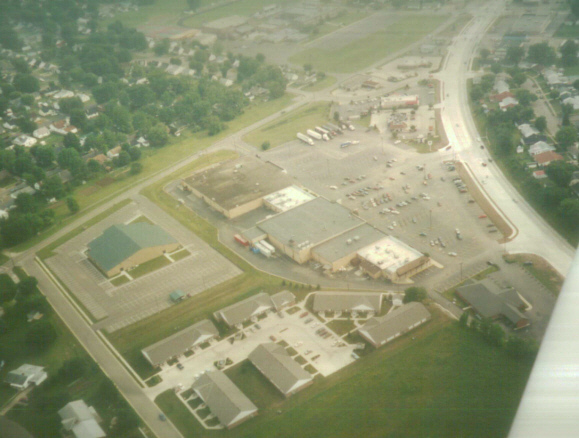 Right Downwind, Runway 25, Pike County Airport (EOP), 11/07/99 - Begin Landing Procedures. 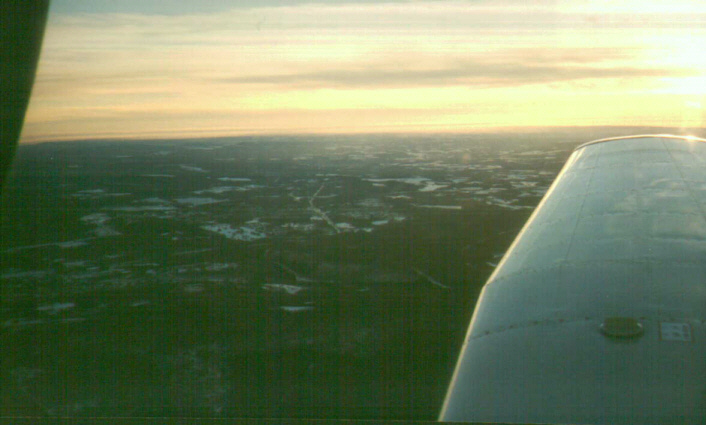 You can see flaps set at 10 degrees. 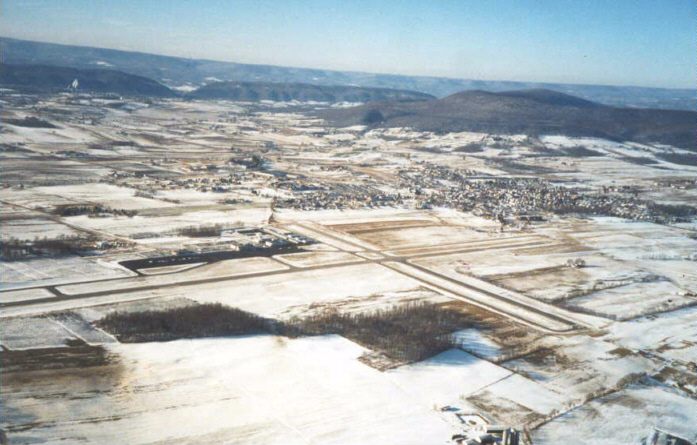 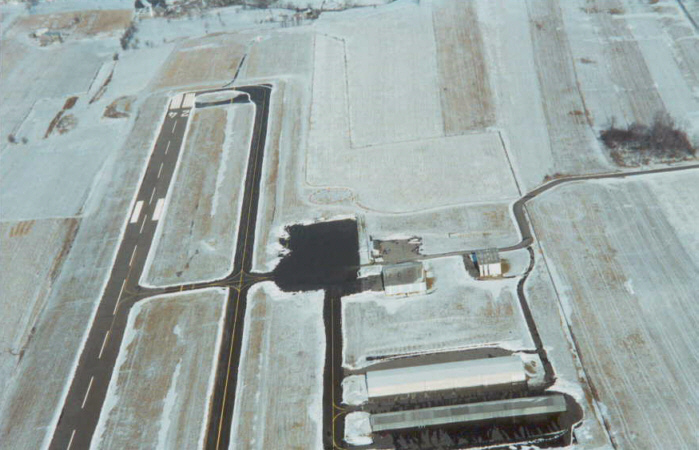 Ebensburg Airport (9G8), Pennsylvania, 01/29/2000 - The airport identifier is on the picture to show you how us pilots have to find the runways amongst everything else in the area. 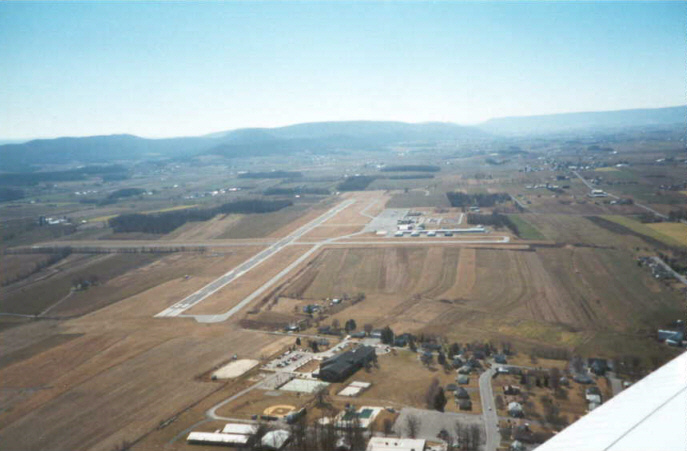 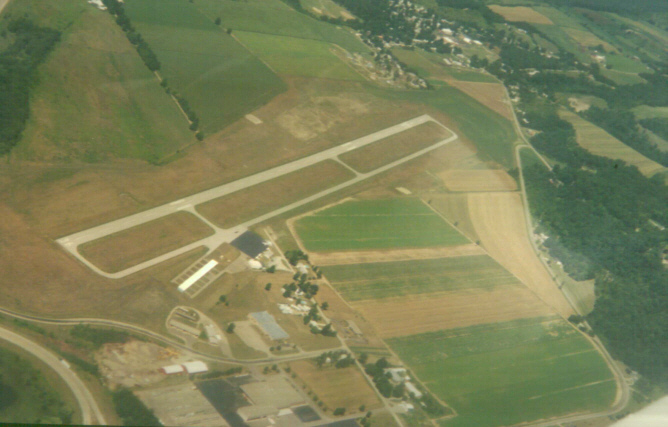 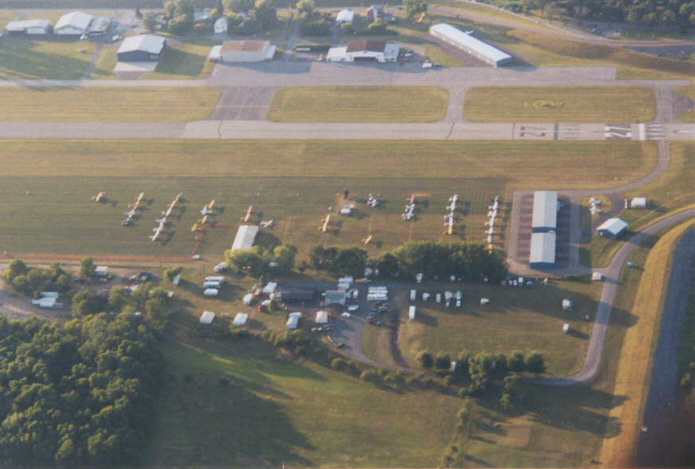 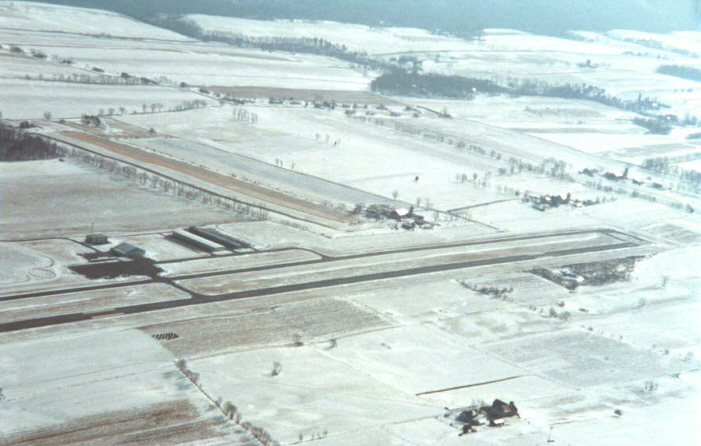 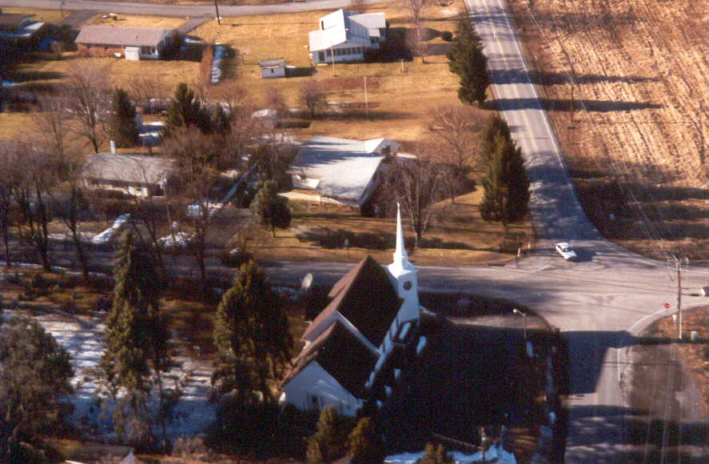 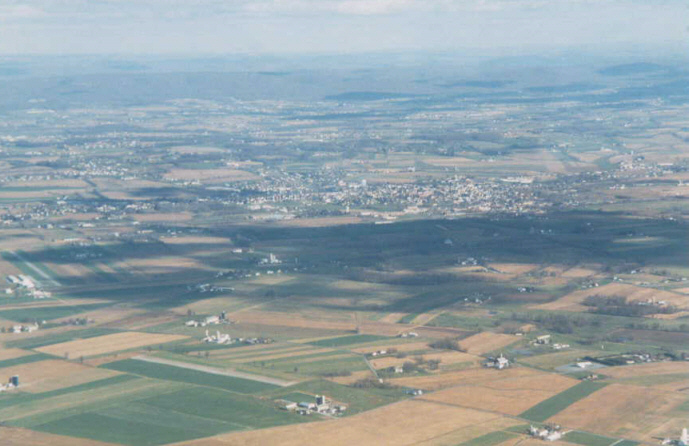 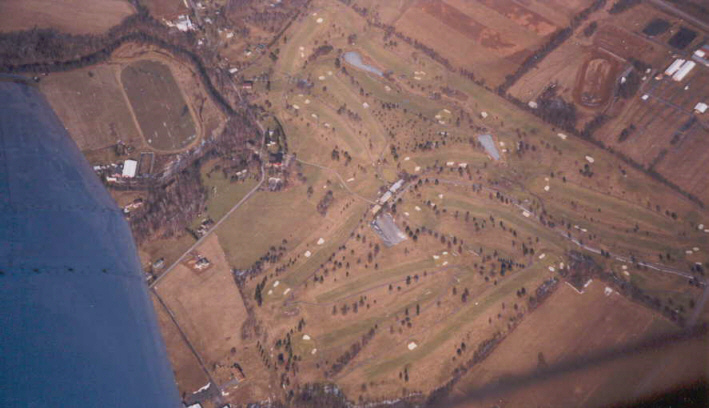 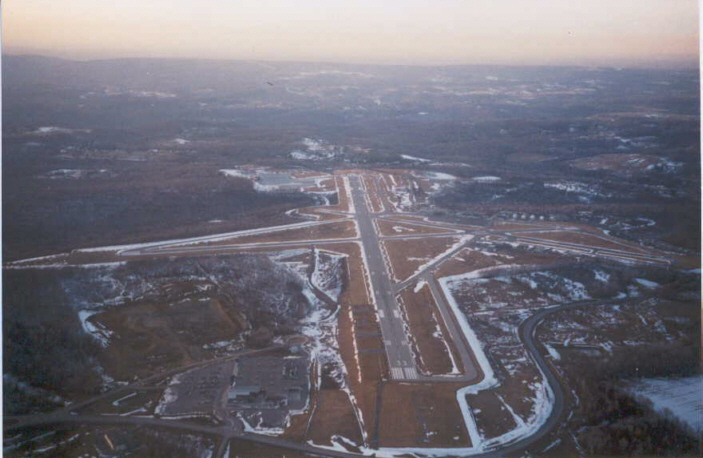 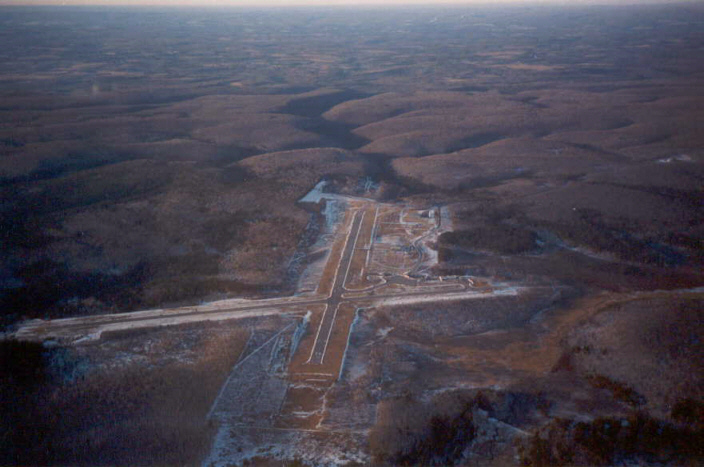 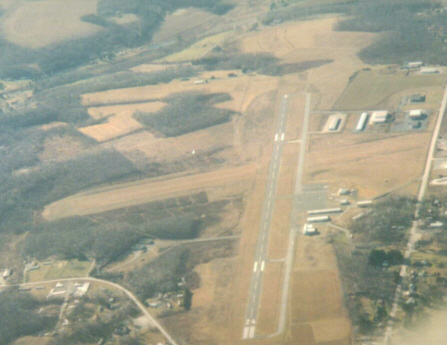 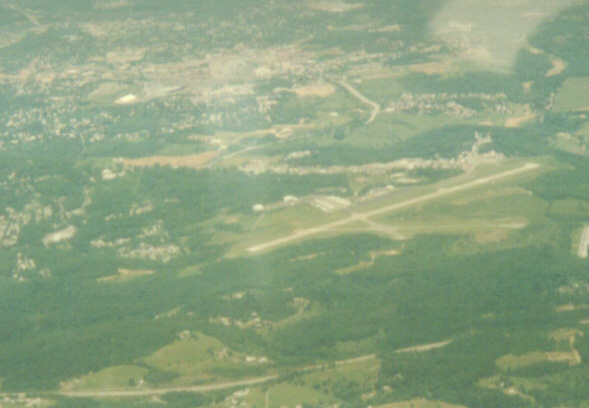 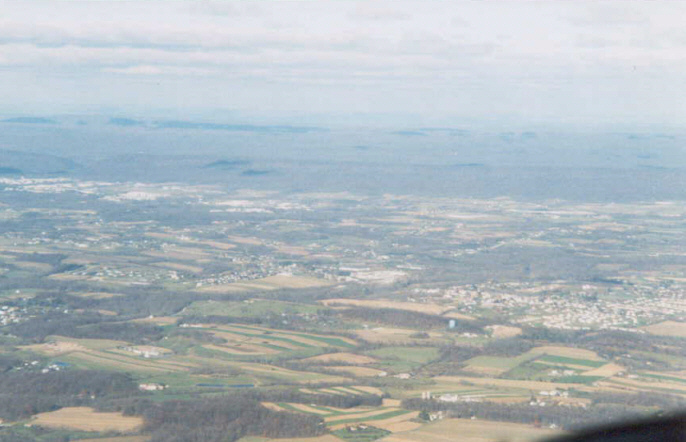 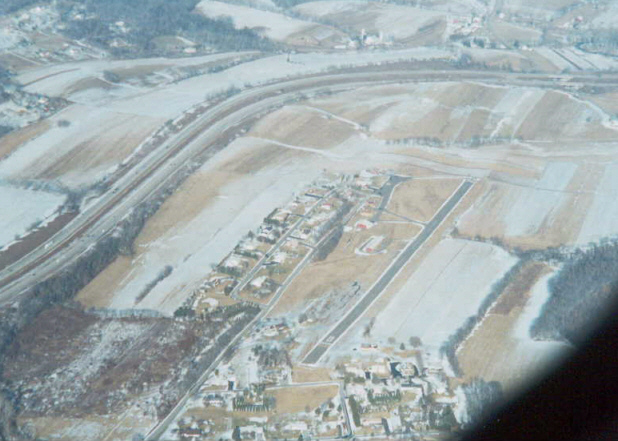 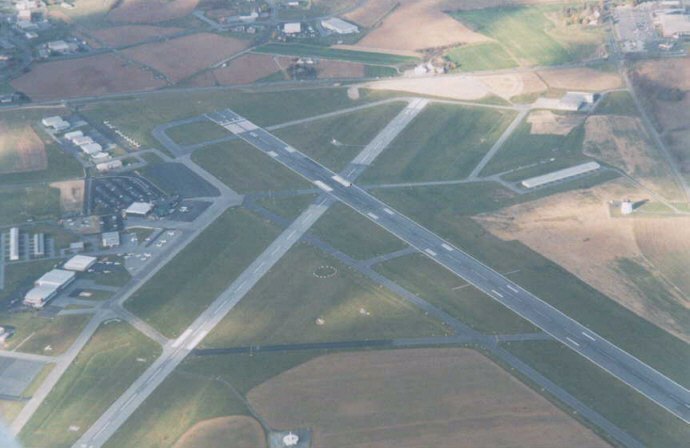 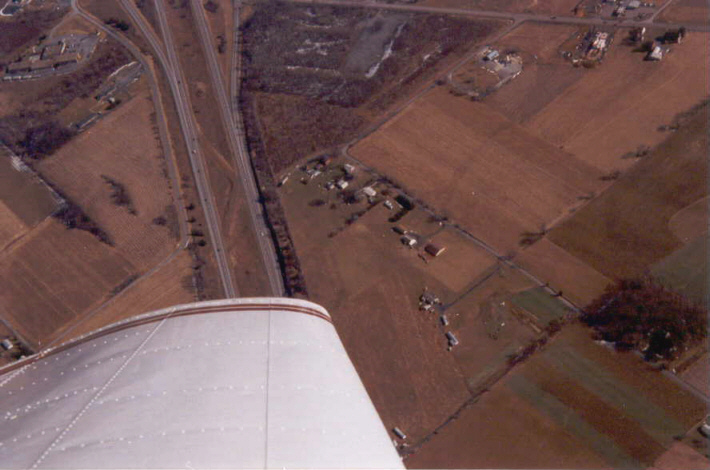 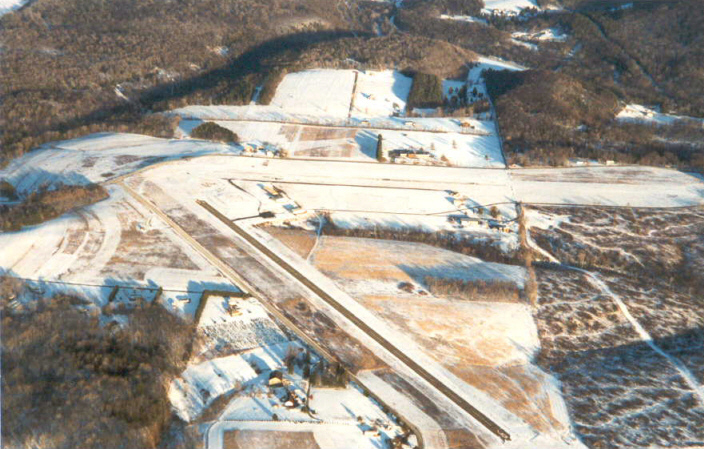 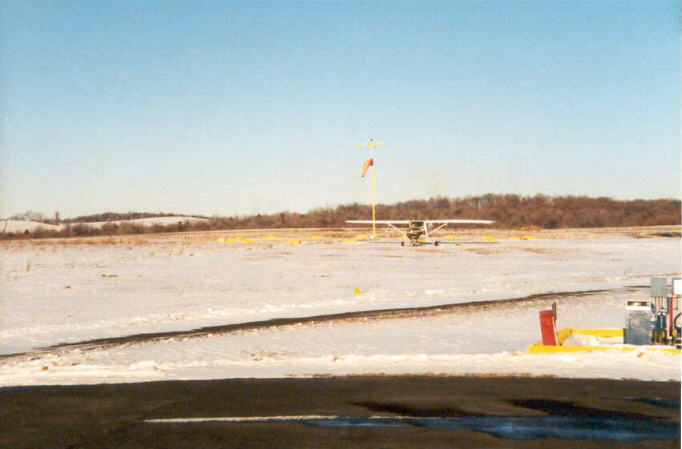 Mifflintown Airport (P34), Pennsylvania, 02/21/2000 - Left Downwind for runway 26. 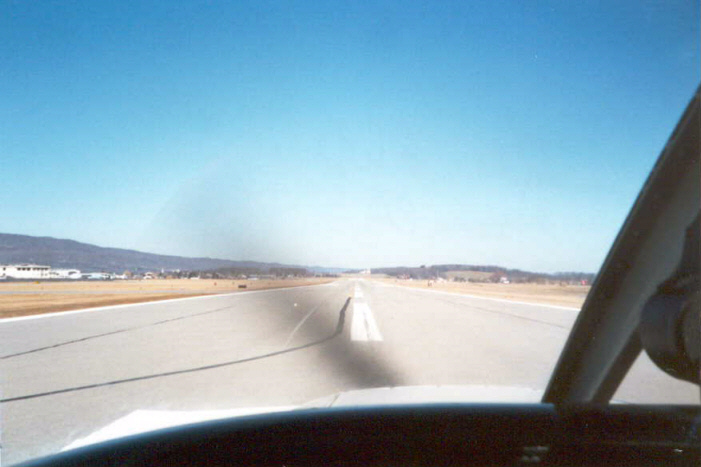 Crosswind, Runway 2, Altoona Aiport (AOO), Pennsylvania, 03/07/2000 - Do you think someone can hit a homerun to the airport from the ball field? 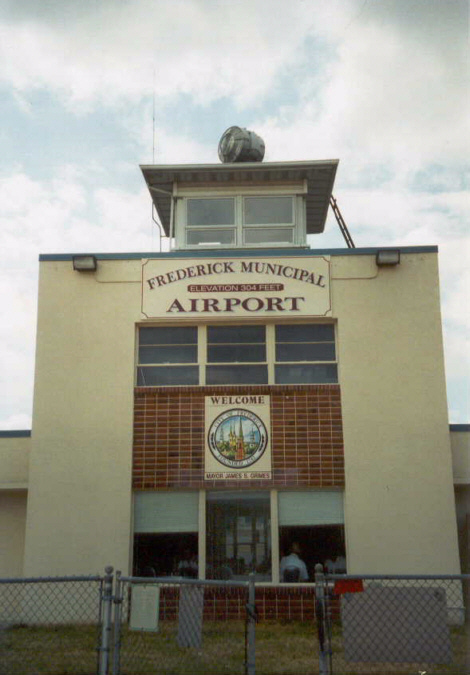 Frederick VOR on field at Frederick Municipal Airport (FDK), 06/12/99 - It's a navigational beacon for pilots. 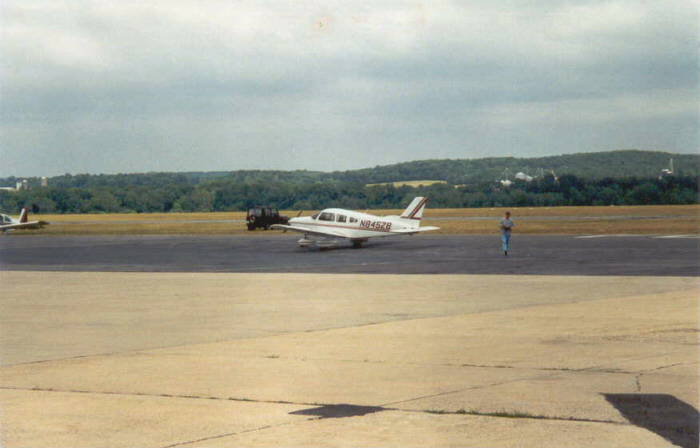 Frederick Municipal Airport (FDK), Maryland, 06/12/99 - Caught in the act of walking away from the plane. 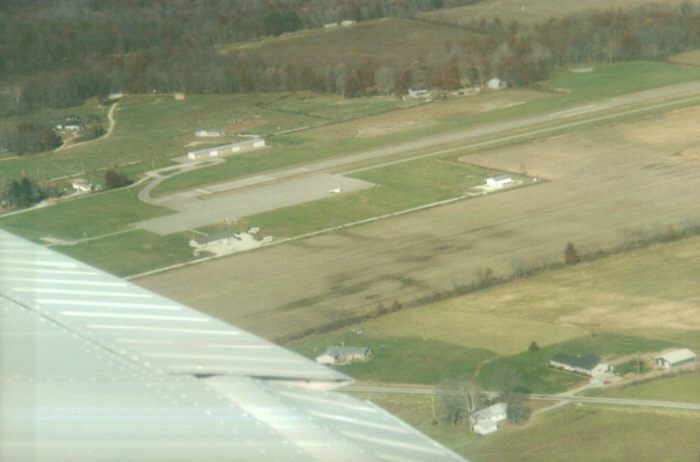 I only had to retrieve my flight plan to file it. 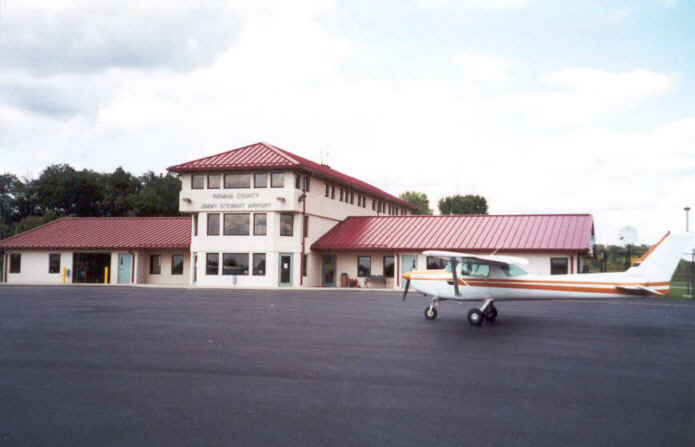 There's a nice diner at the airport. 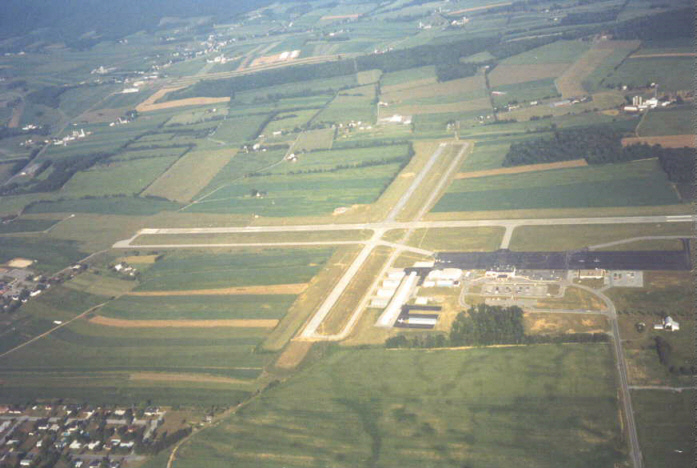 Somerset County Airport (2G9) FBO, Pennsylvania, 07/13/99 with the Cessna 152 I flew there in front. 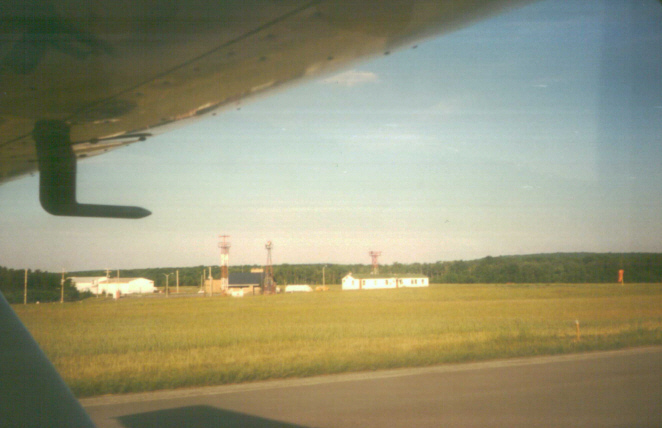 Hornell Municipal Airport (4G6), New York, 08/01/99 - Filling out my logbook in the plane on the ramp. 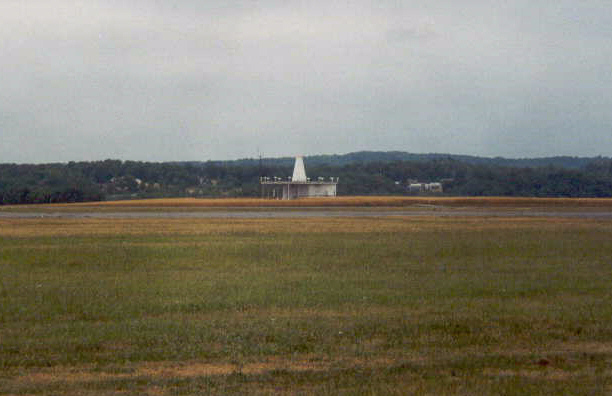 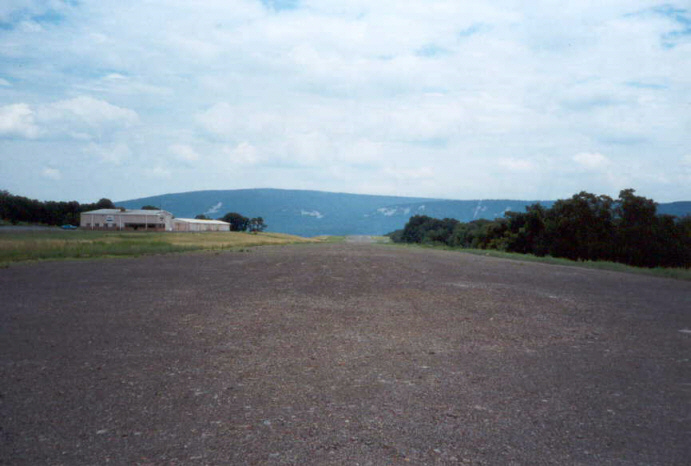 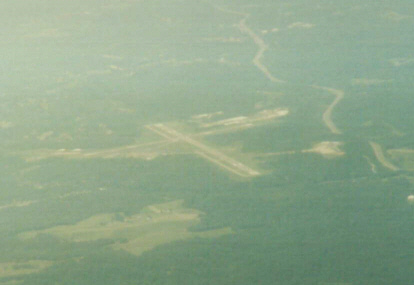 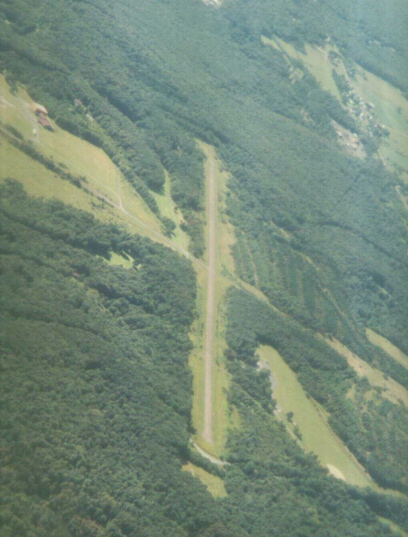 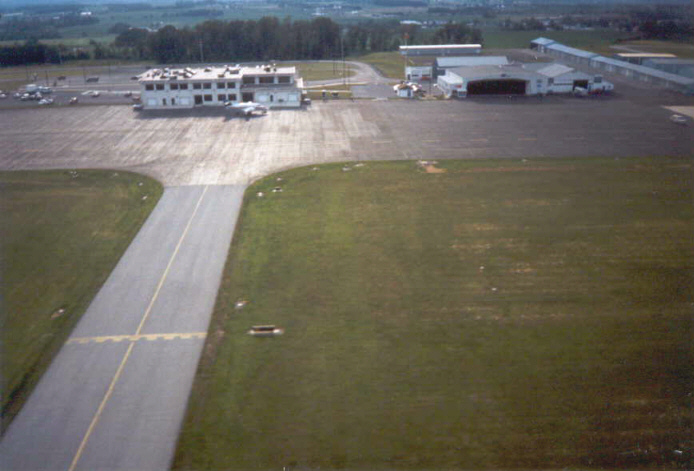 Runup Area, Altoona Airport (AOO), Pennsylvania, 08/06/99 - Nobody on the runway (left). 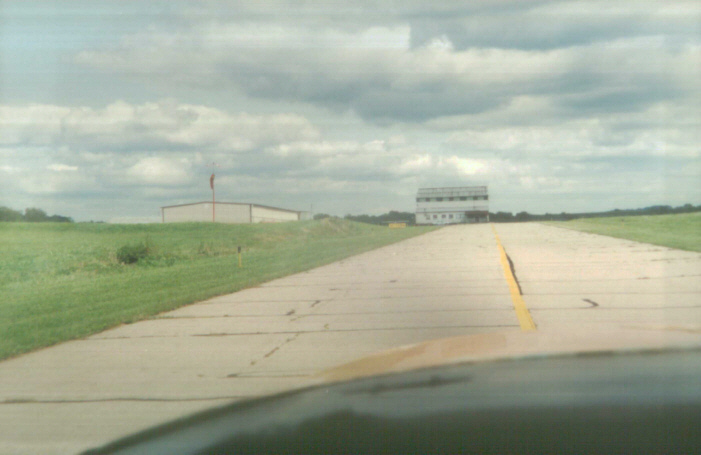 Nobody waiting behind me on the taxiway (right). 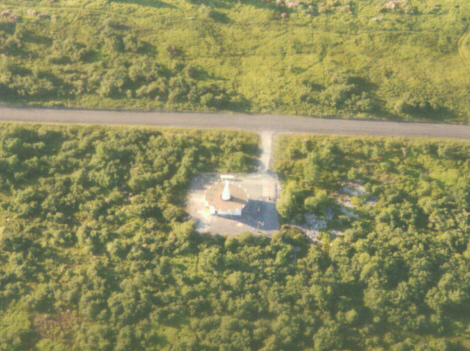 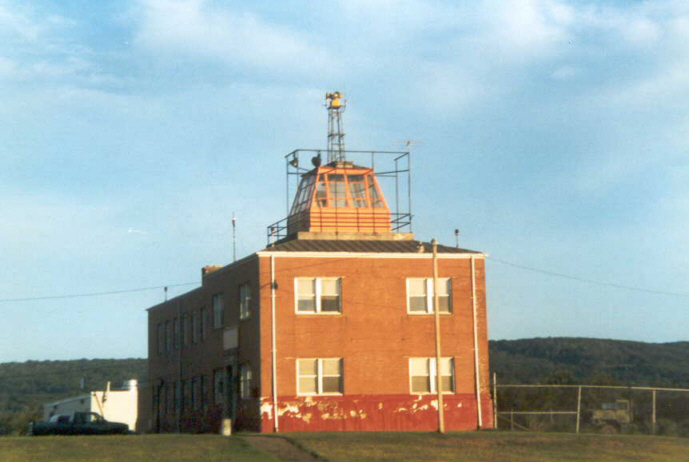 Former ATC Tower at Connellsville Airport (2G3), Pennsylvania, 08/31/99 - This airport is no longer a towered airport. 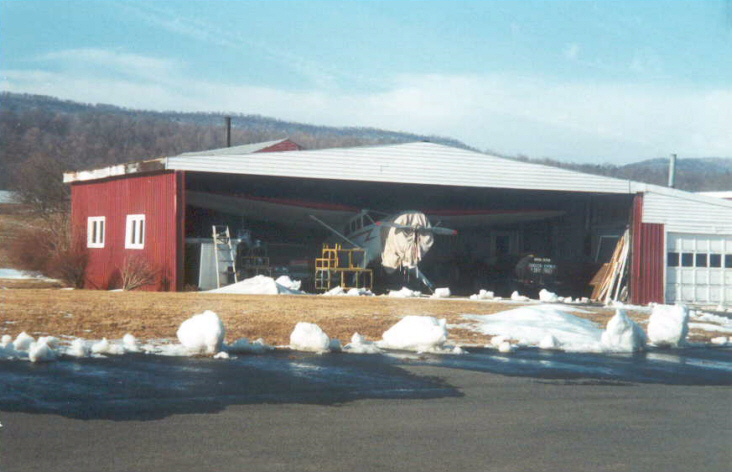 FBO at Mifflintown Airport (P34), Pennsylvania, 02/21/2000 - Yes, someone's house. 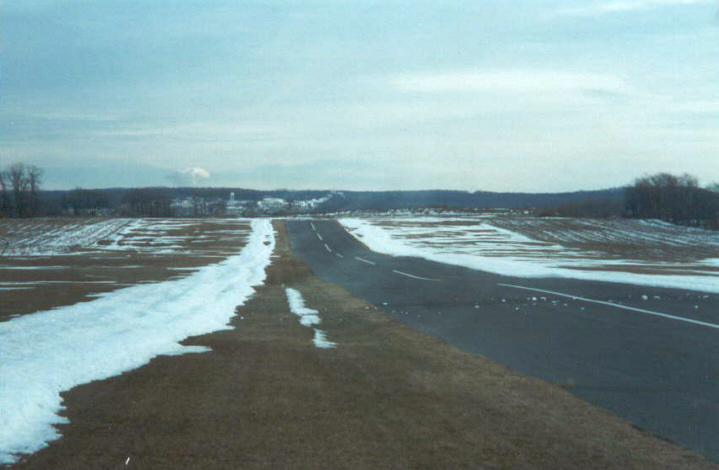 Runway 26, Mifflintown Airport (P34), Pennsylvania, 02/21/2000 This is certainly one of the toughest runways I have ever used. 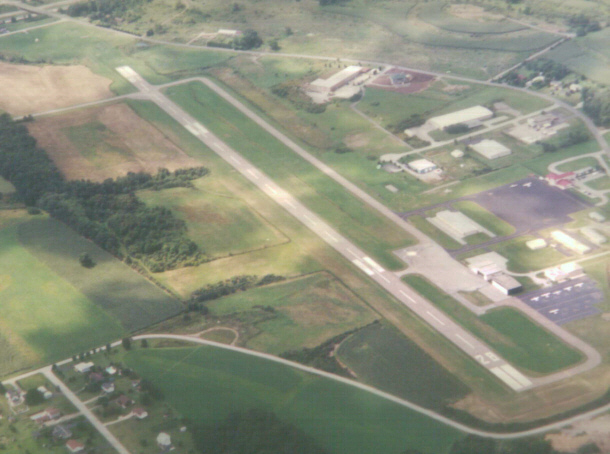 Kutztown runway is a piece of cake compared to this. 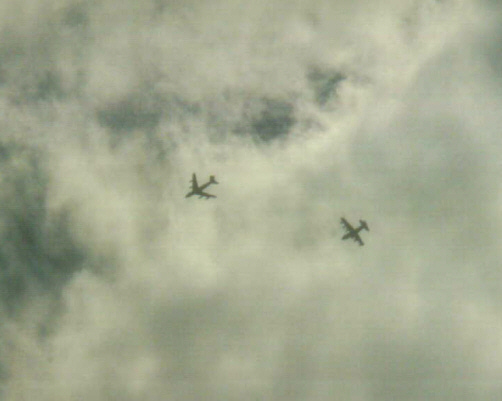 These are aircraft I "pass by" in one way or another. 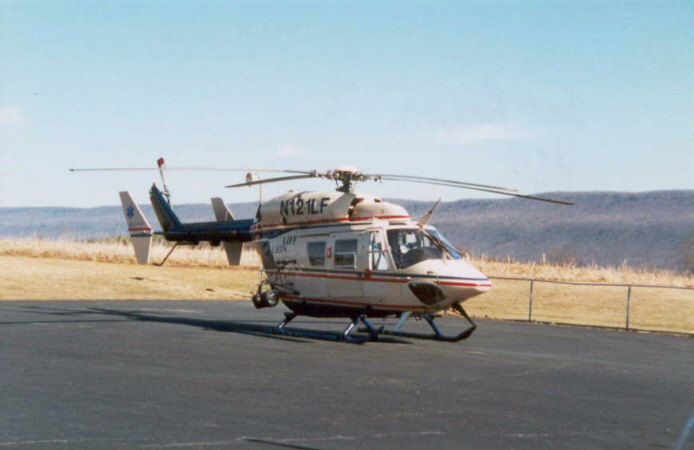 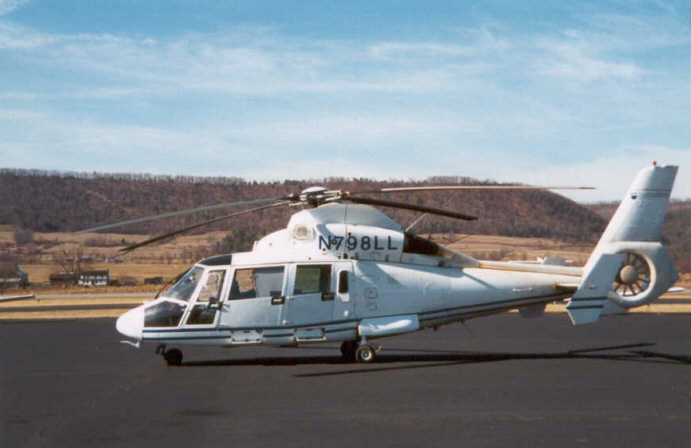 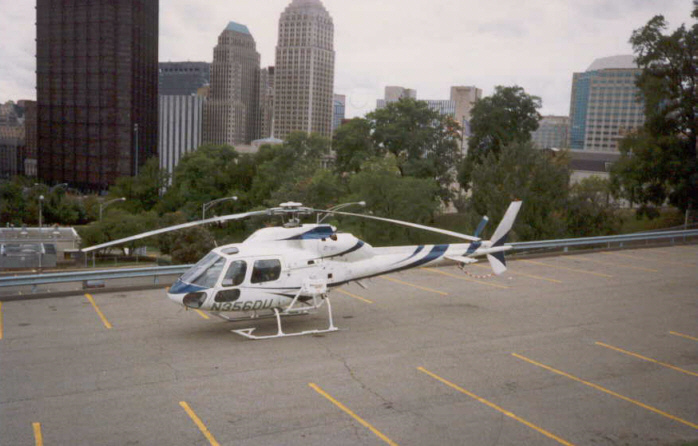 Aerospatiale AS 355 F Ecureuil Helicopter used in Michael Keaton movie while filmed in Pittsburgh, Pennsylvania. 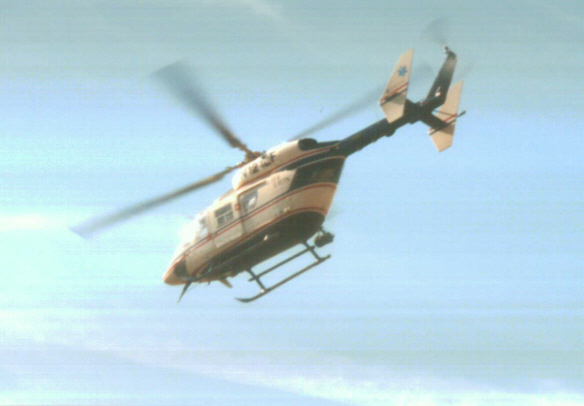 I don't know the name but I believe he is a doctor in a California hospital. 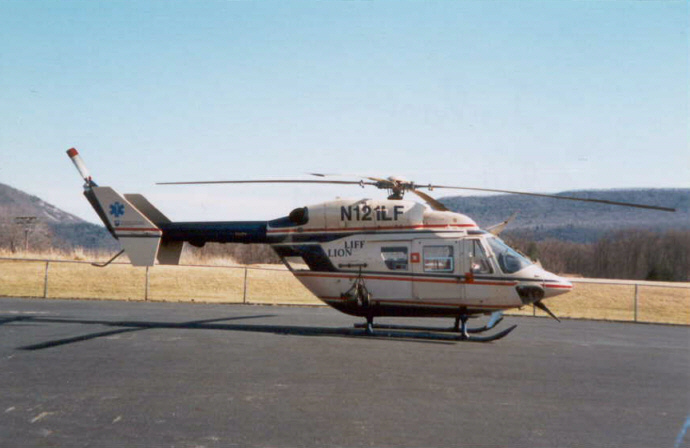 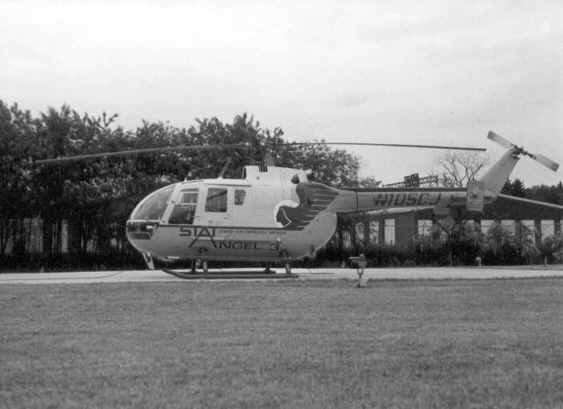 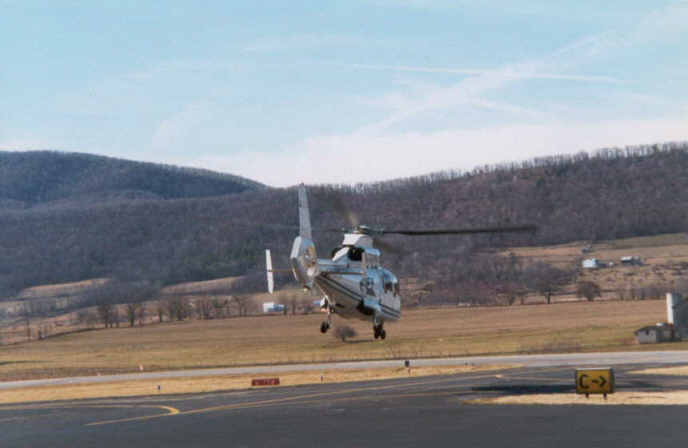 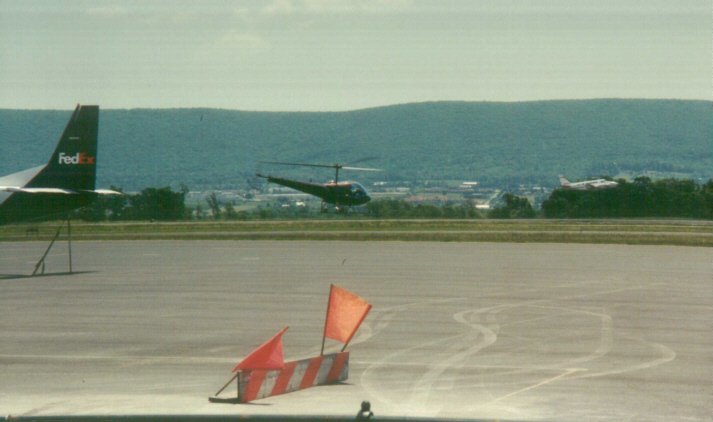 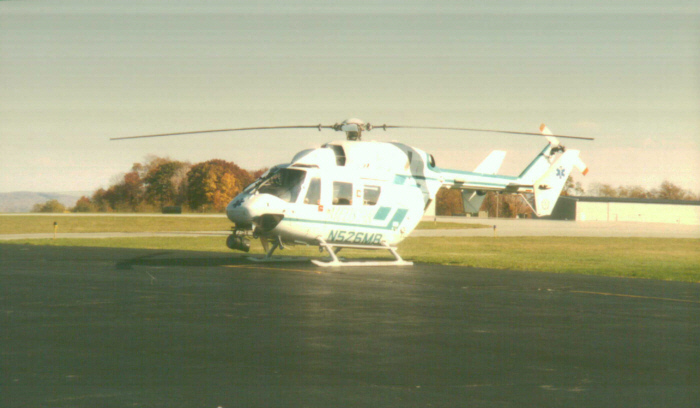 A Helicopter hovering over ramp at University Park, Pennsylvania to begin "taxi" to runway 24 for departure. 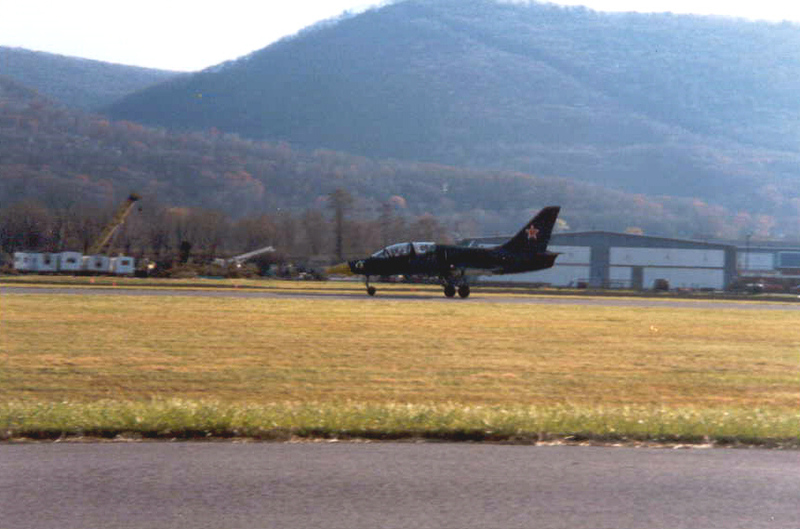 Aircraft in background on right is departing runway 24. 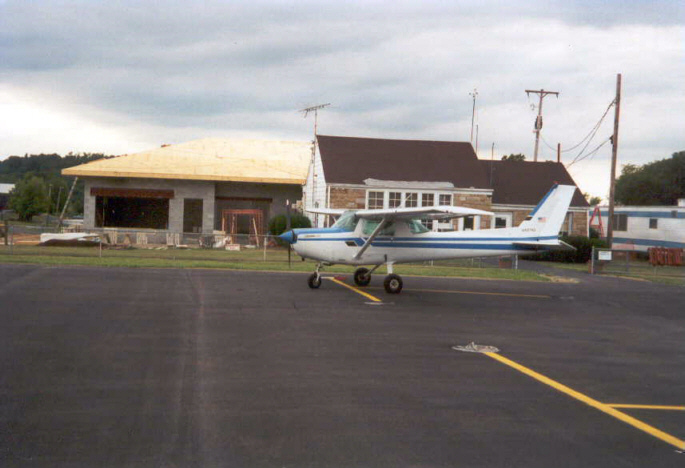 Small plane with Candard design, Lock Haven Airport (LHV), Pennsylvania, 07/13/99 - I don't know if this is a home or a factory built. 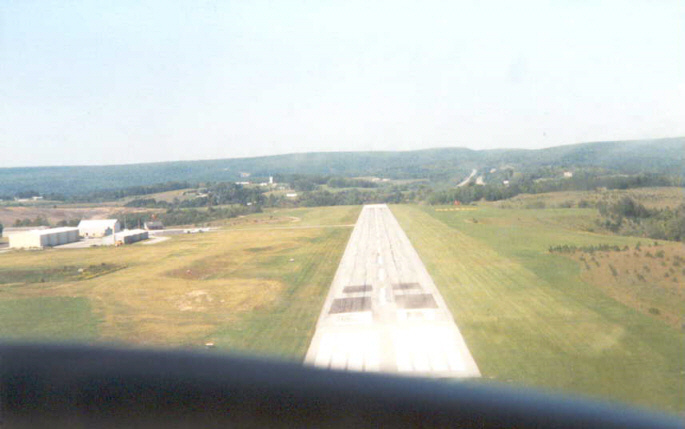 Jet about to land at Altoona, Pennsylvania, 08/06/99 I was holding short of the active runway while this plane came in for landing. 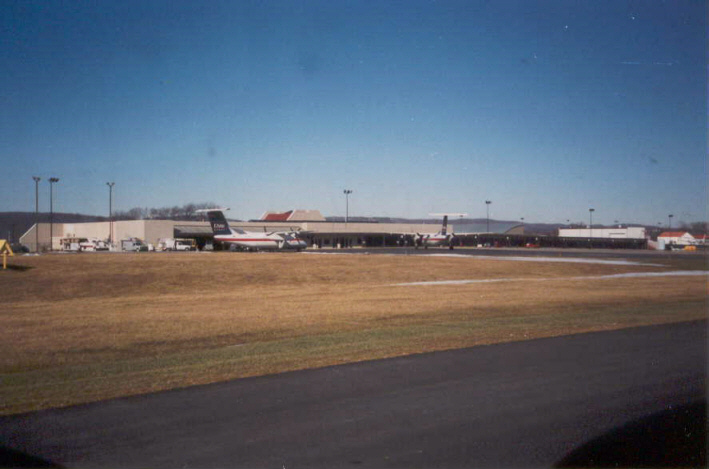 Get in Line at Lock Haven Airport (LHV), Pennsylvania, 03/05/2000 - I was behind three other planes for take-off. 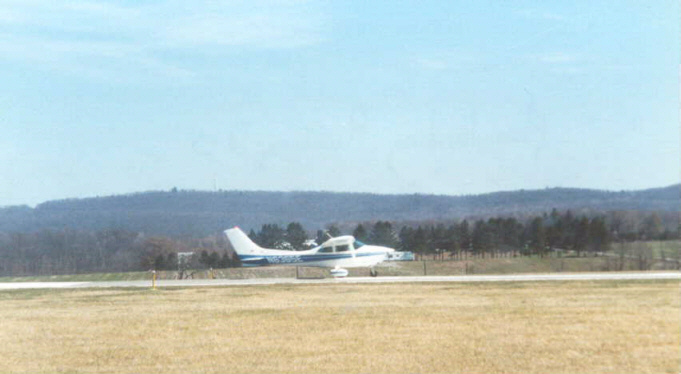 A Cessna 172 landing on runway 20, Altoona Airport (AOO), Pennsylvania, 04/01/2000 - As soon as the plane finishes its rollout and clears the runway, I can take-off. 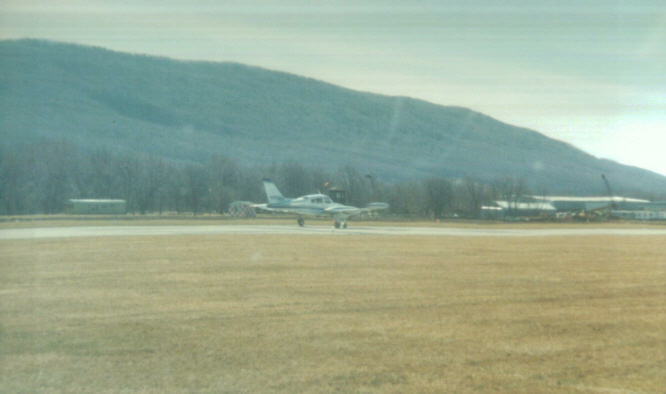 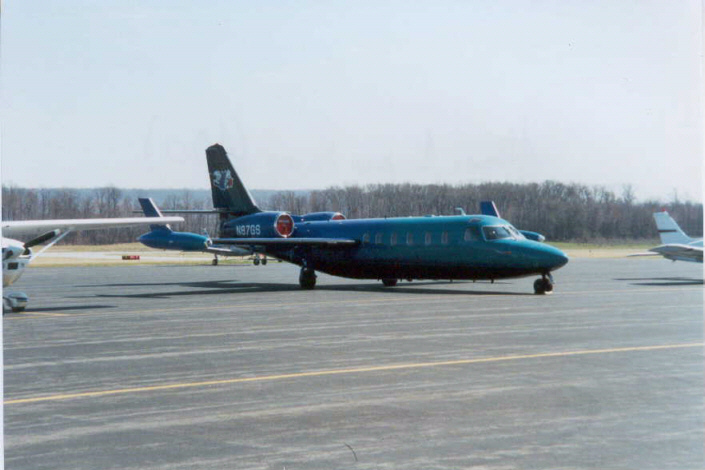 A Beech B-60, University Park Airport (UNV), State College, Pennsylvania, 04/13/2000 - As I taxied in from landing, I was instructed to park next to this plane. 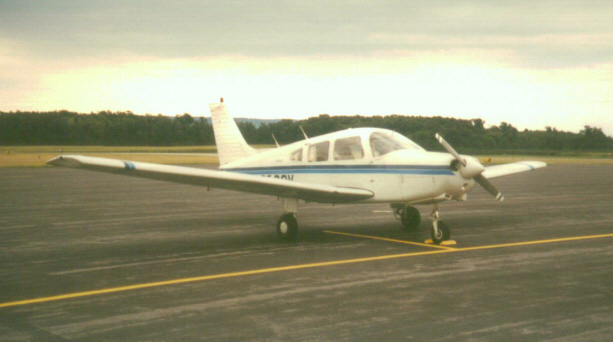 Planes I fly regularly and have flown listed in chronological order of first flight date. 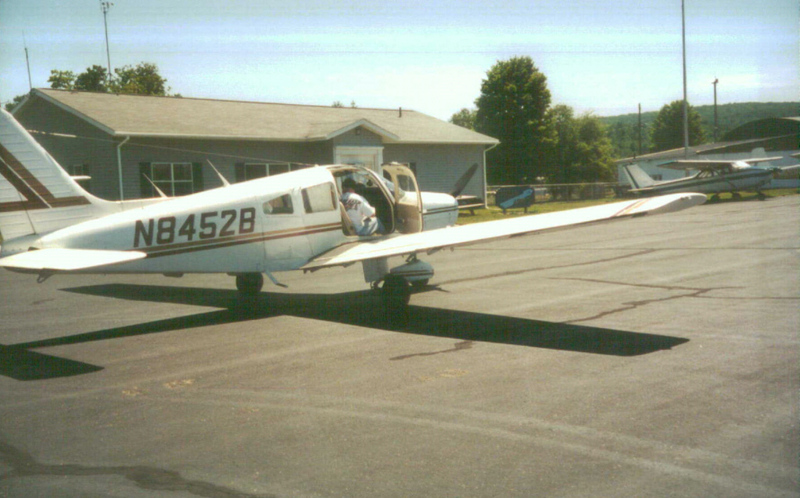 There are four airplanes I fly regularly meaning each one at least once a month. 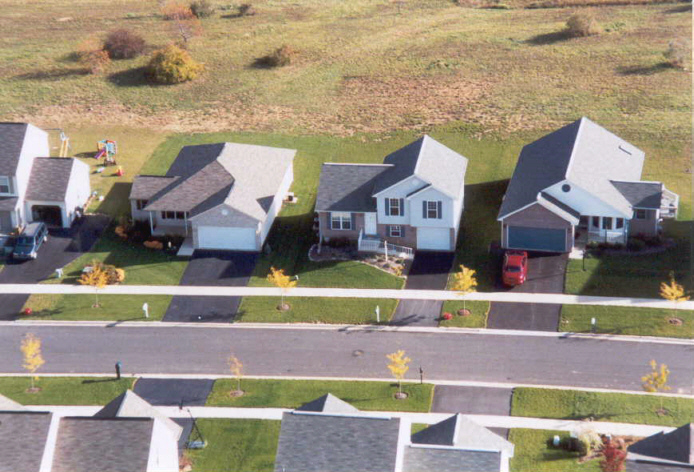 There were five until one was sold. 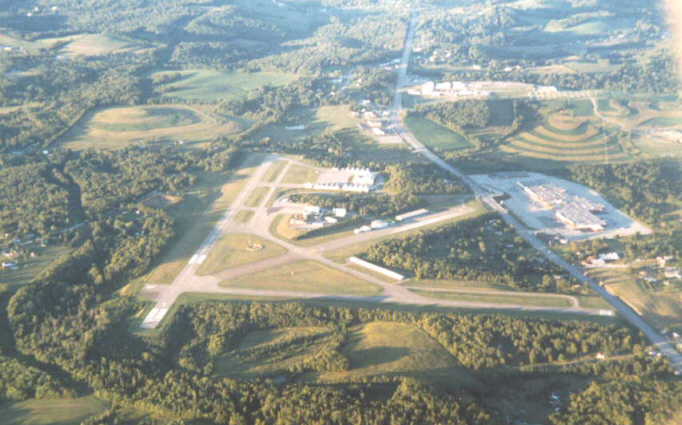 I fly from two different airports which are 90 miles apart. 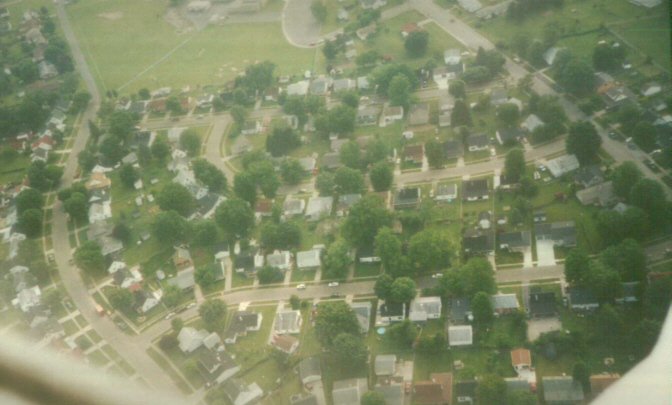 I live in the middle. 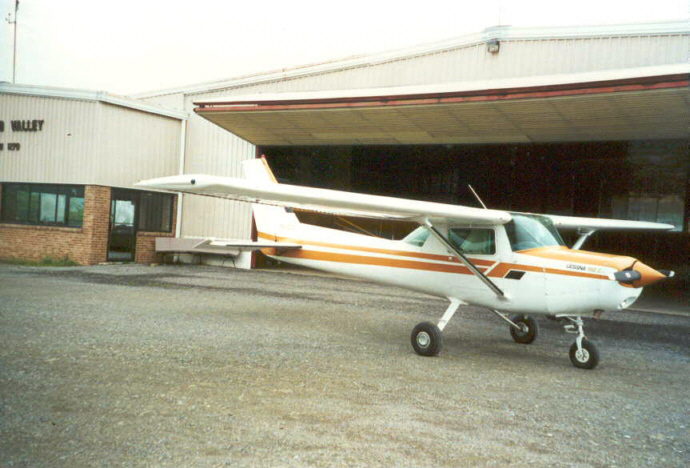 Cessna 150 (C150) N19255, Lock Haven (LHV), Pennsylvania - First plane I ever flew (03/28/98, regularly) including my first solo. 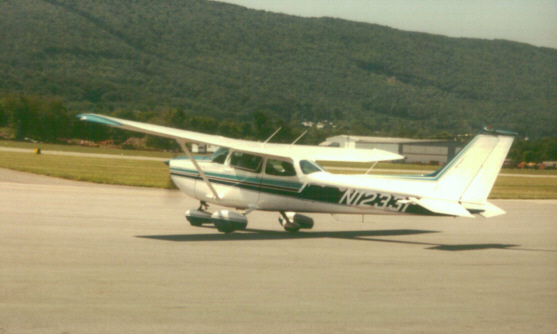 Cessna 172 (C172) N12331, Lock Haven (LHV), Pennsylvania - Second plane I ever flew (07/18/98, regularly). 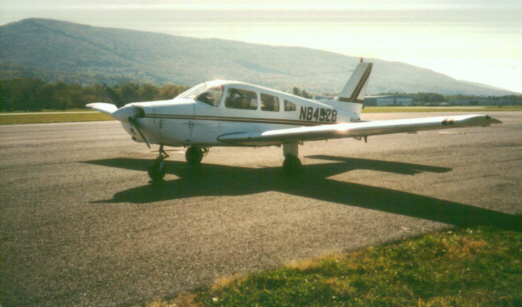 This plane loves to climb and easily cruises at 140 MPH with its 160 HP engine. 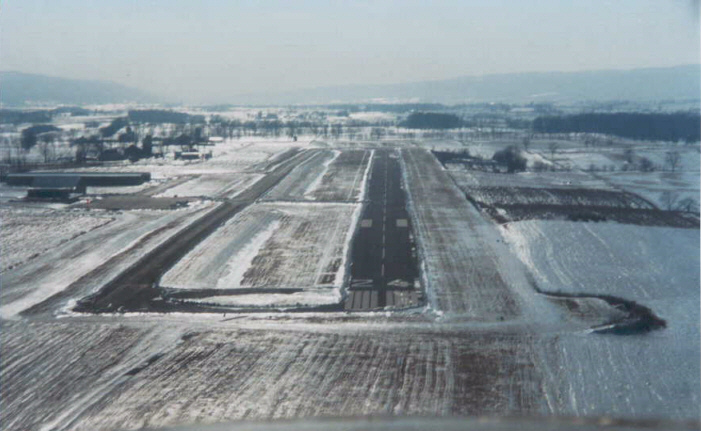 I'm taxing out to the runway. 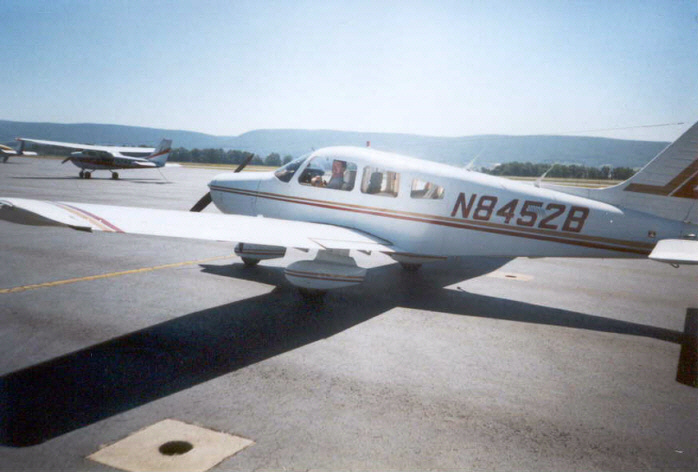 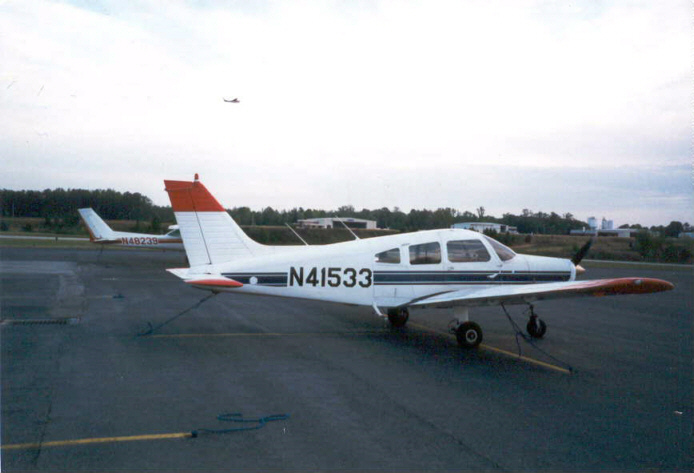 Piper Warrior (PA-28-161) N8452B, Lock Haven (LHV), Pennsylvania - First flew 08/07/98, regularly. 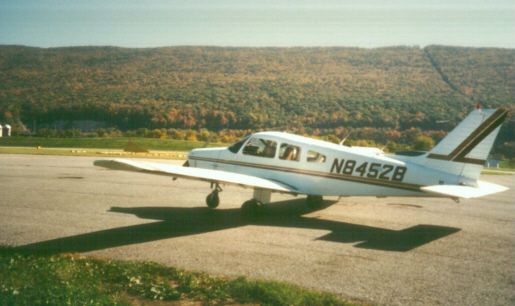 This is my favorite plane to fly. 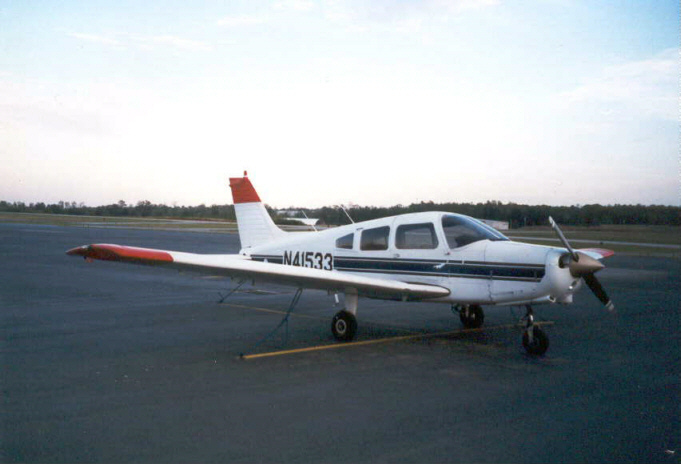 Piper Warrior (PA-28-161) N41533, Atlanta, Georgia - Flew once (4/13/99) when I was in Atlanta for a week of job training. 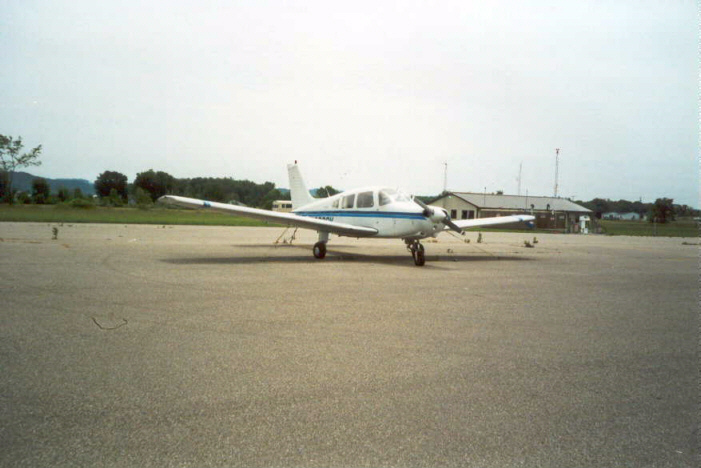 After arriving at the hotel, the first thing I looked for were airports with rental planes. 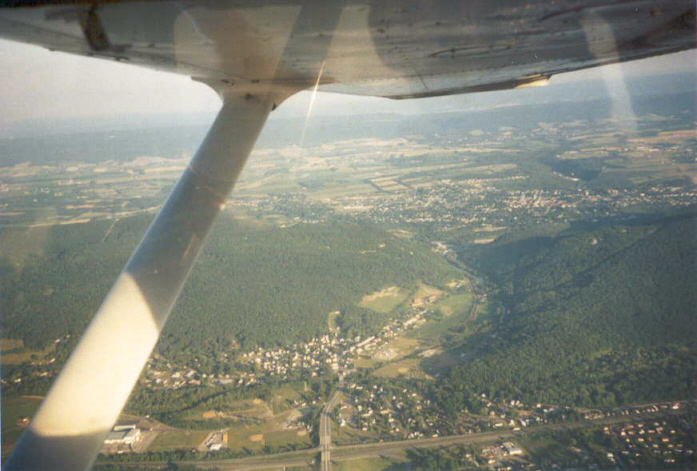 I had my priorities straight: flying first, everything else second. 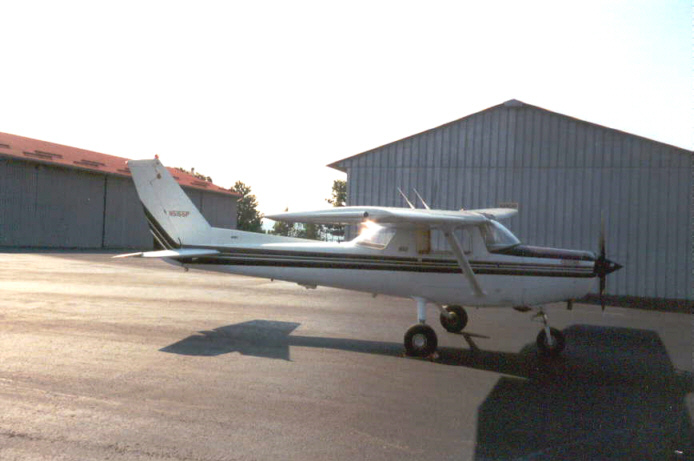 Cessna 152 (C152) N49740, Altoona-Blair County Airport (AOO), Pennsylvania - First flew 07/09/99. 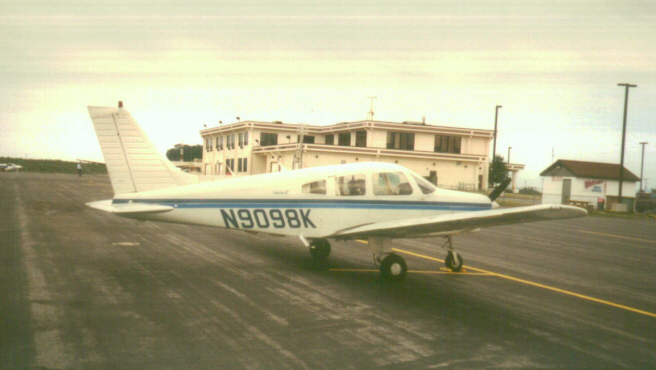 I flew it regularly until the owner sold it at the end of January, 2000. 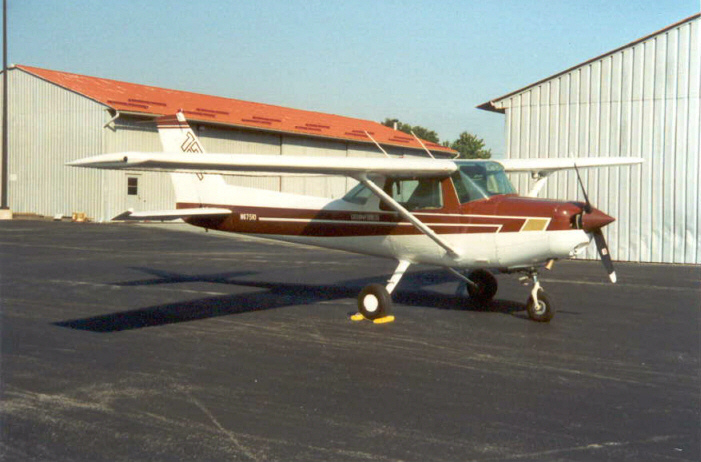 Cessna 152 (C152) N67510, University Park Airport (UNV), State College, Pennsylvania - Only flew once 07/25/99. 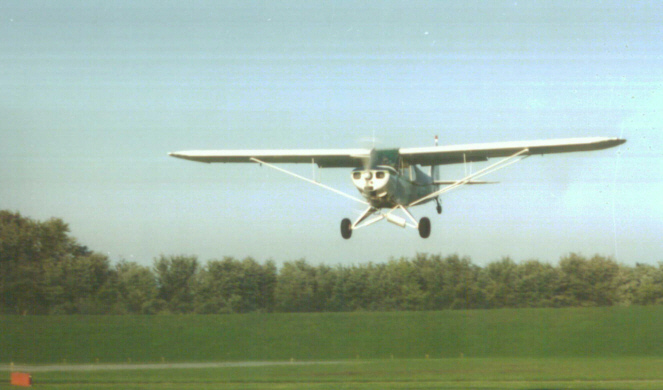 I'd fly it more if the company who owns it didn't have such strict policy use. 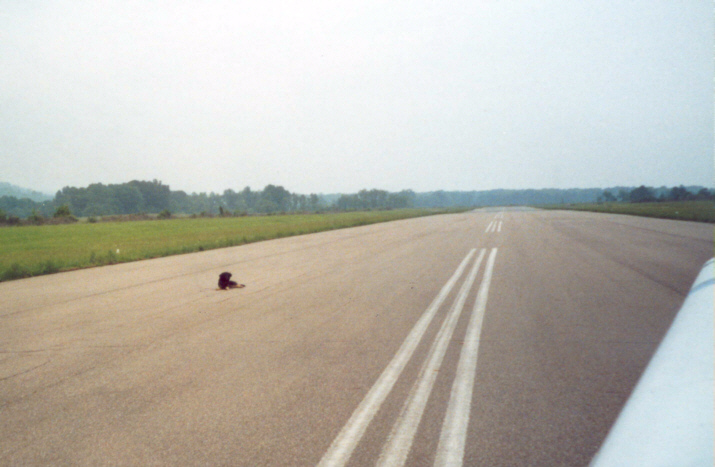 Example: Never be late. 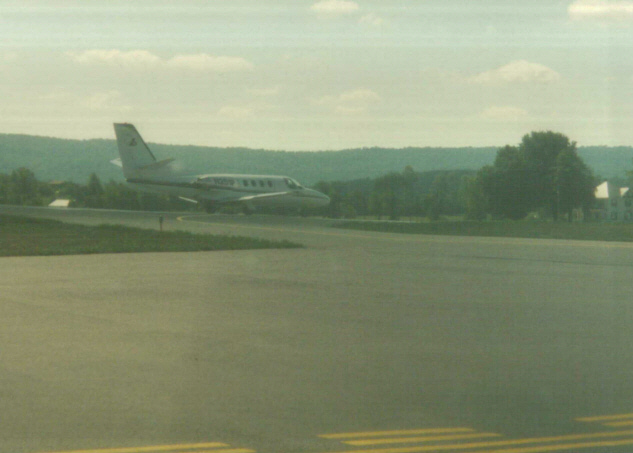 You lose the reservation and are charged a penalty fee. 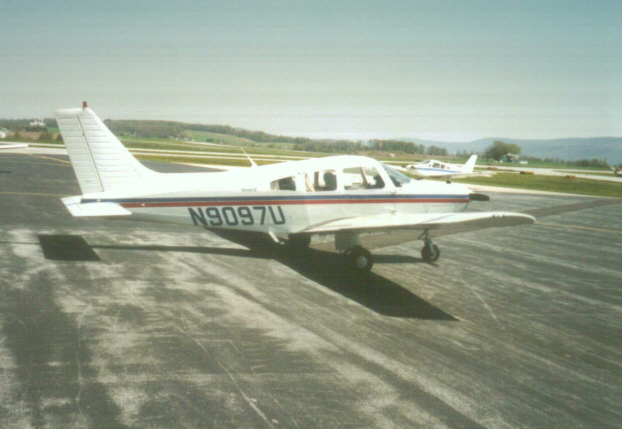 Piper Warrior (PA-28-161) N9098K, Front side view, Altoona-Blair County Airport (AOO), Pennsylvania - First flew 08/10/99. 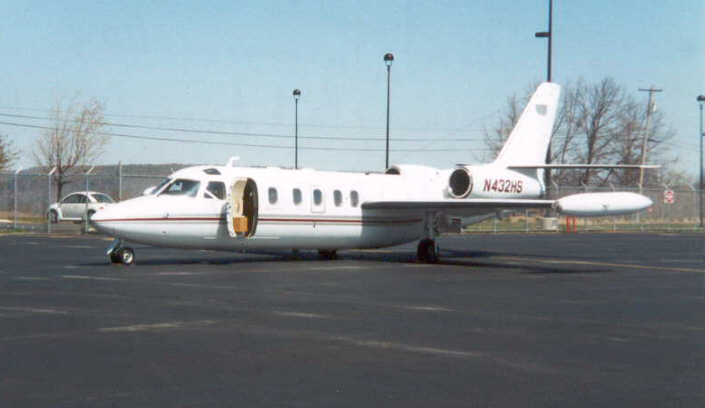 I flew it and Warrior 9097U regularly until the airport started treating the company unfairly with items such as extremely high rent. 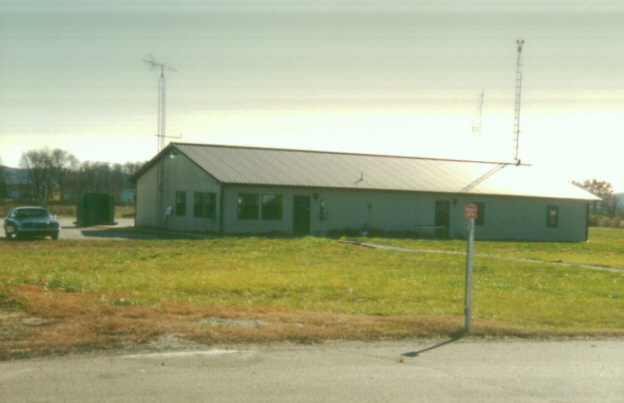 They had to close at the end of 2005. 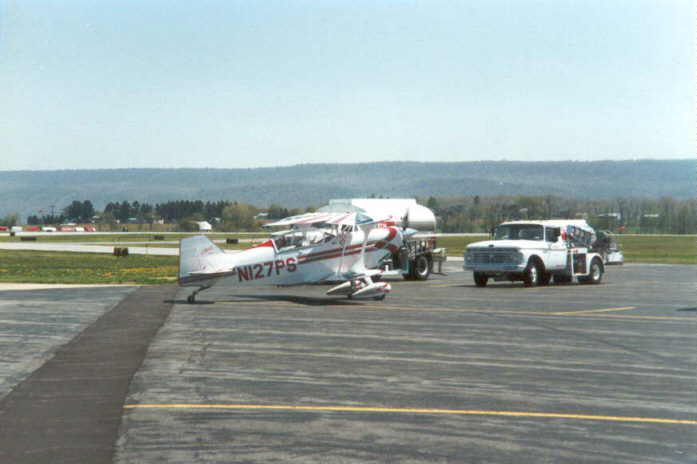 Piper Warrior (PA-28-161) N9097U, Altoona-Blair County Airport (AOO), Pennsylvania - First flew 05/03/2000. 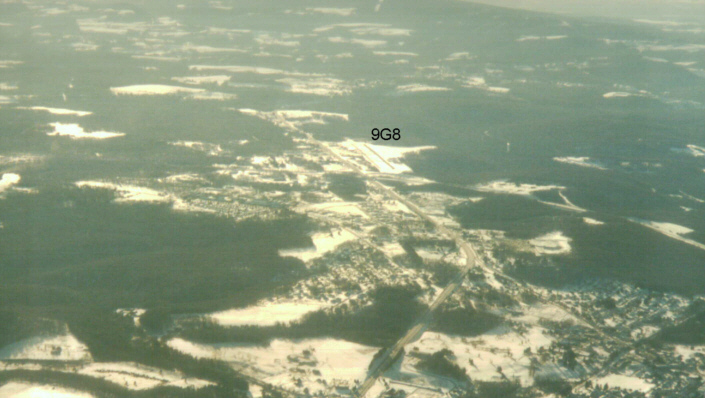 This is the twin to Warrior 9098K (background). 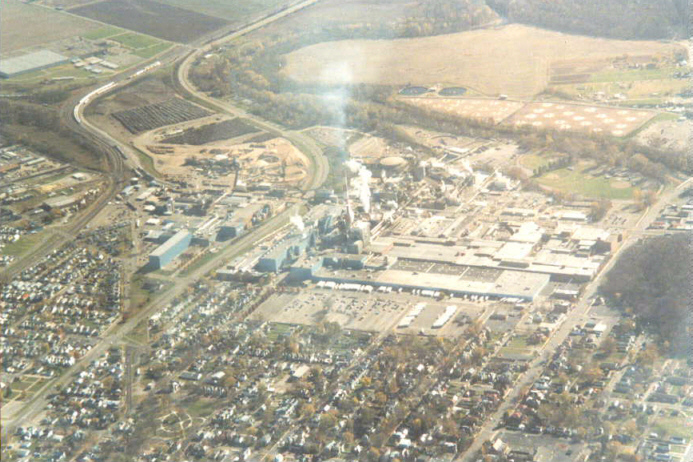 They came out of the factory at the same time. 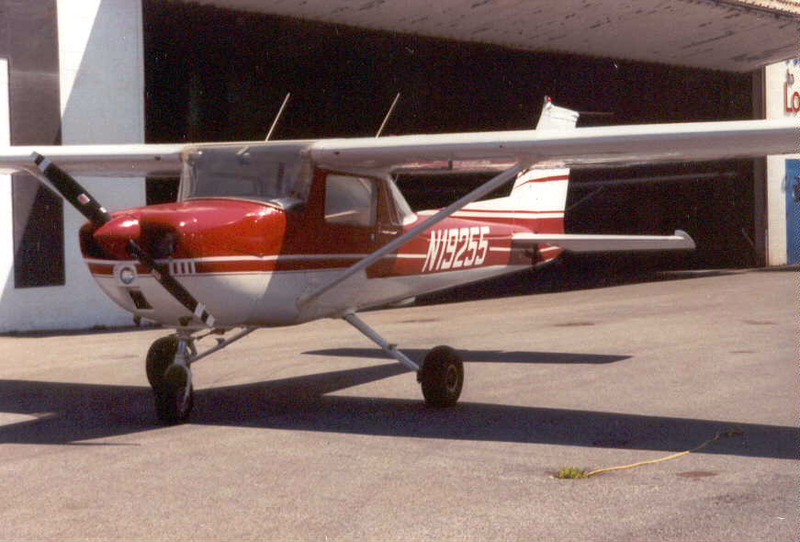 This one was in storage for a year until they had the money to buy a new engine. 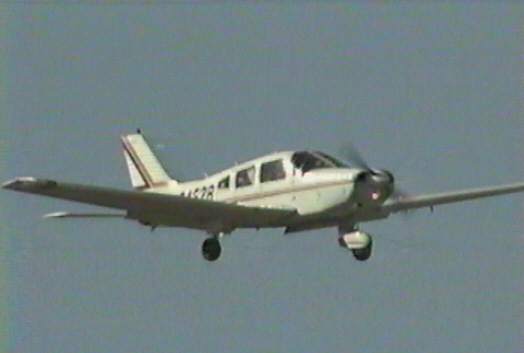 It runs beautifully. 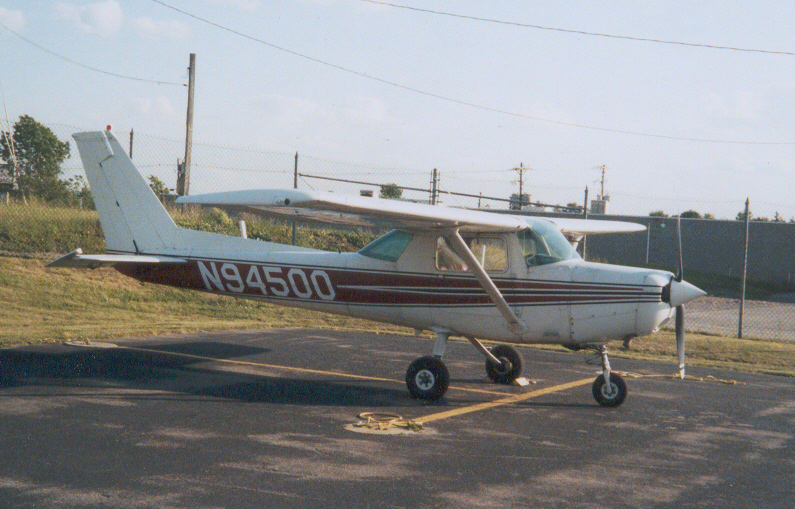 Cessna 152 (C152) N89223, Blue Knob Valley Airport, Pennsylvania, First flew 05/23/2000. 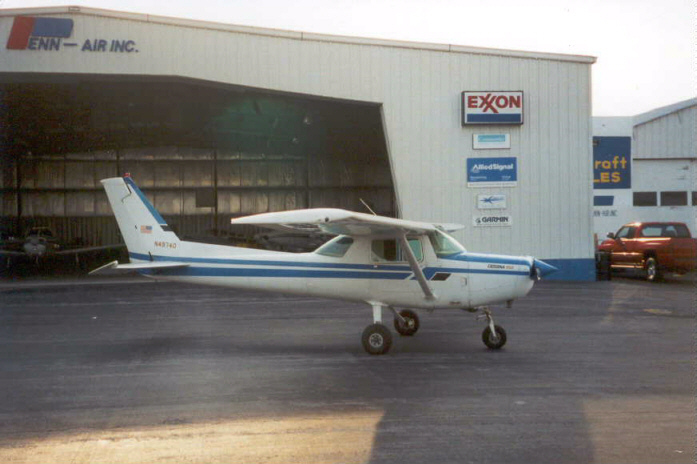 Cessna 152 (C152) N94500, Ebensburg Airport, Pennsylvania - First Flew 06/16/2006.